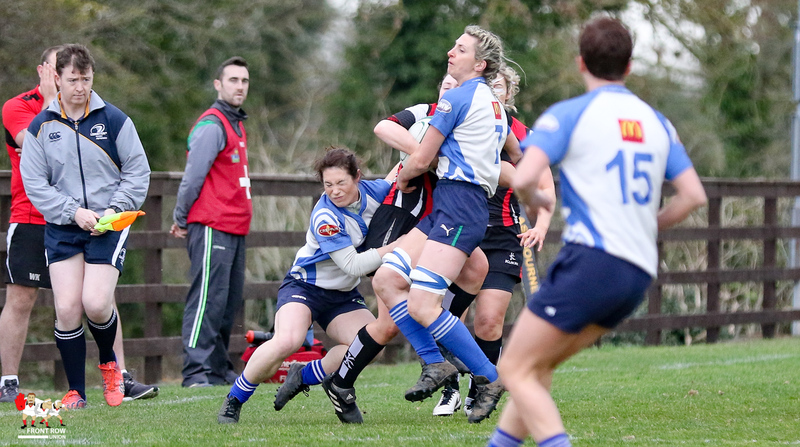 Vicky Irwin breaks through the Tralee defence. 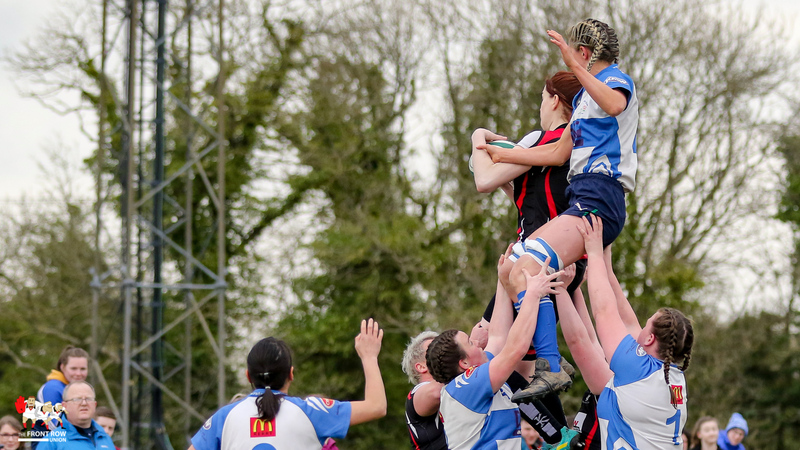 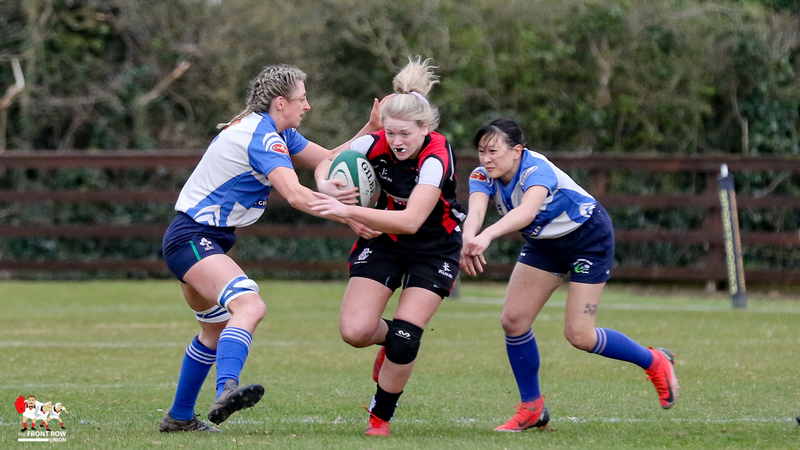 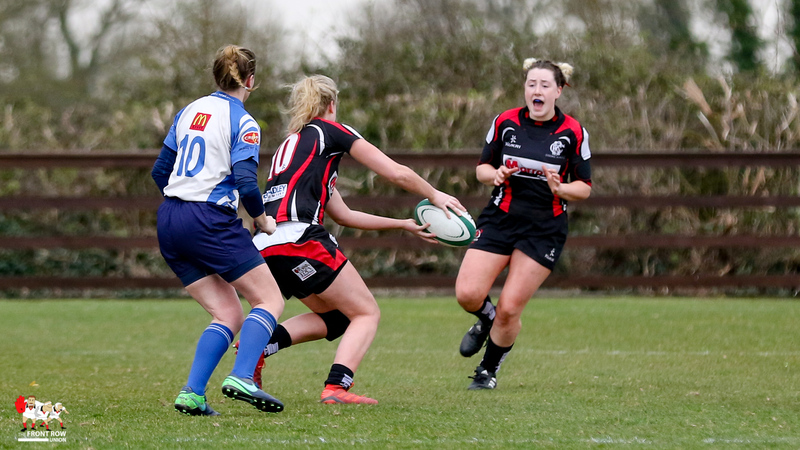 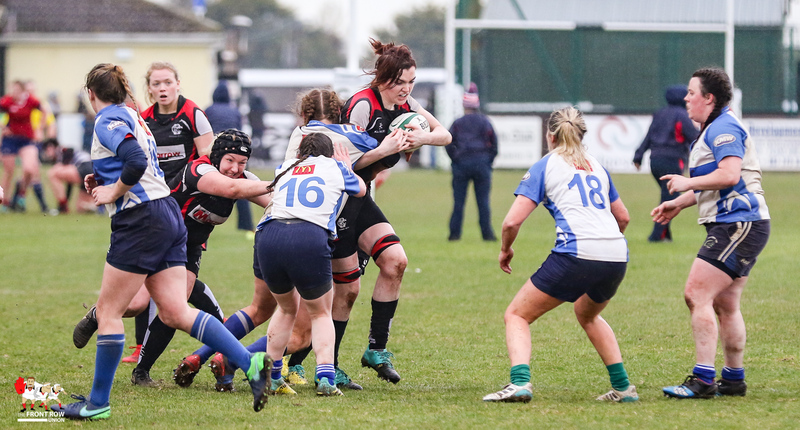 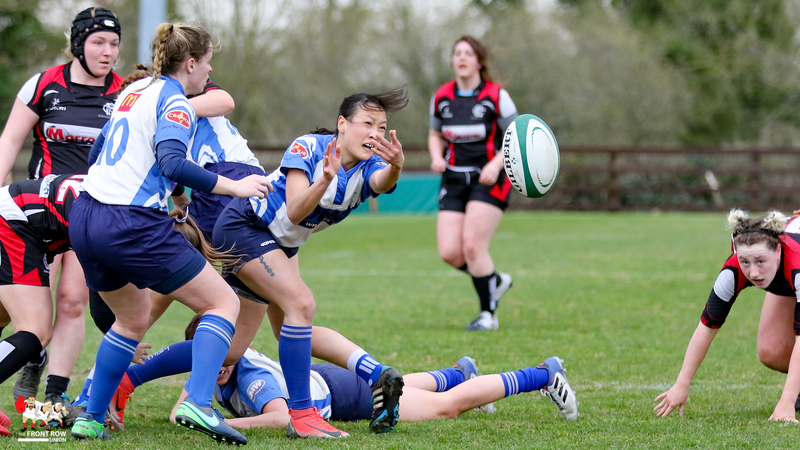 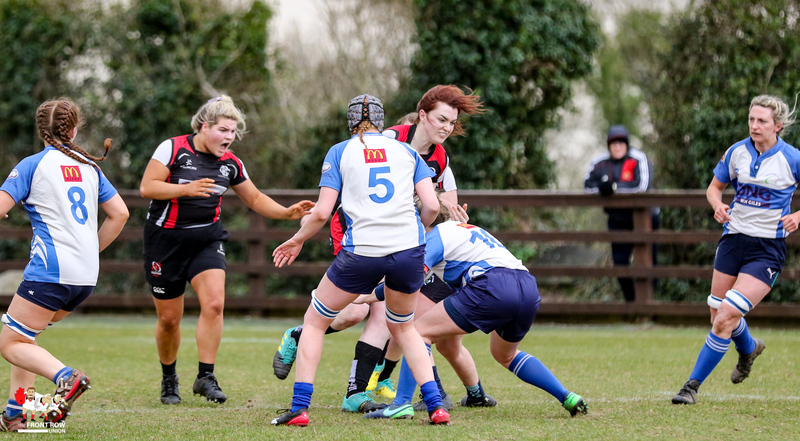 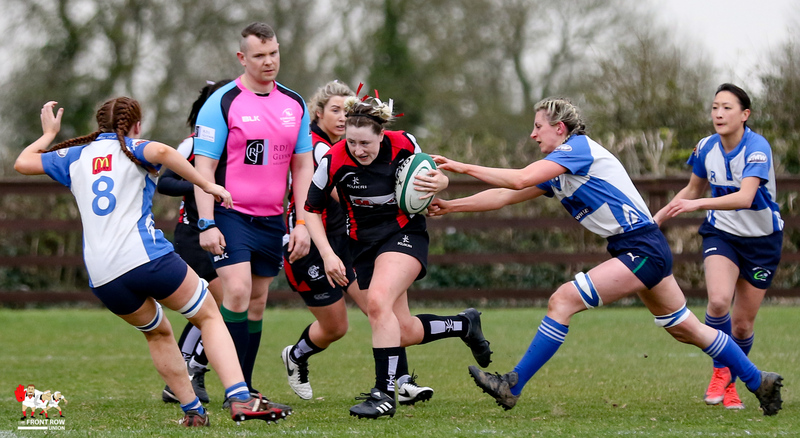 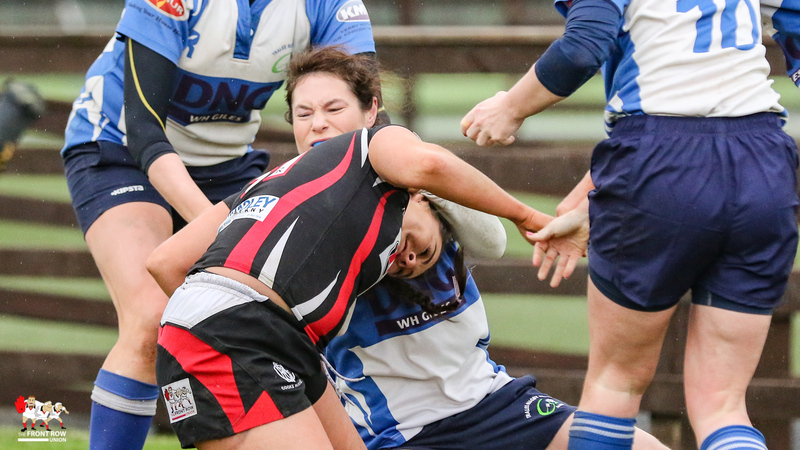 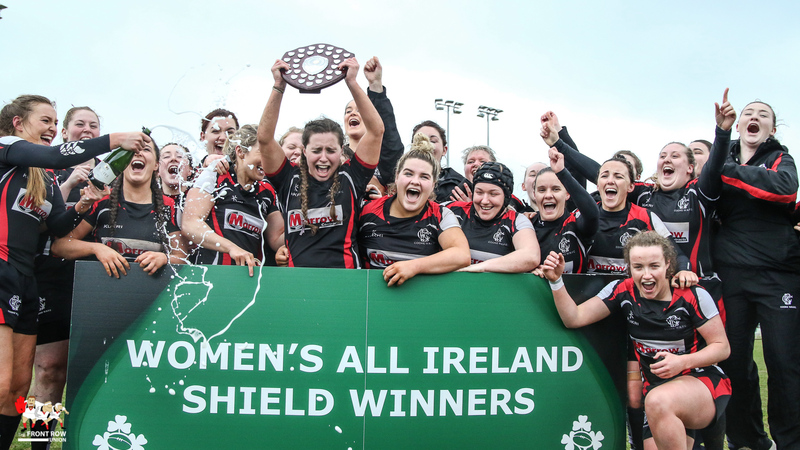 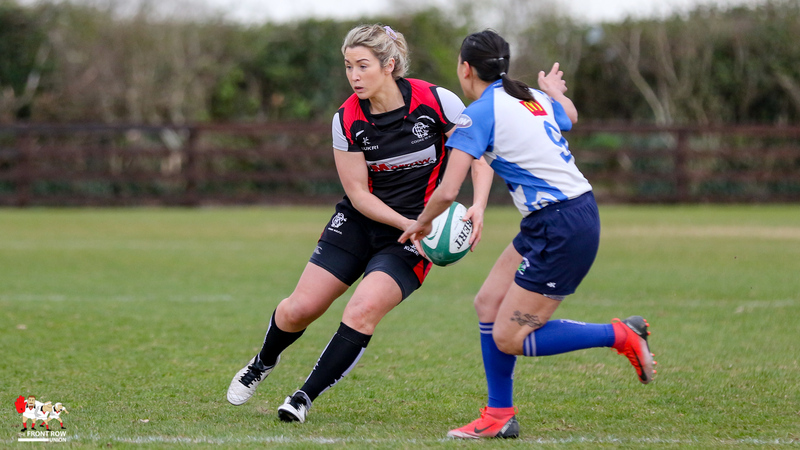 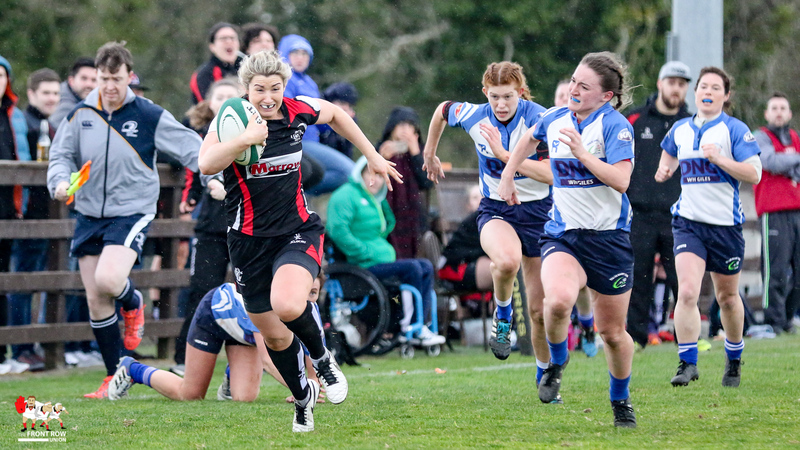 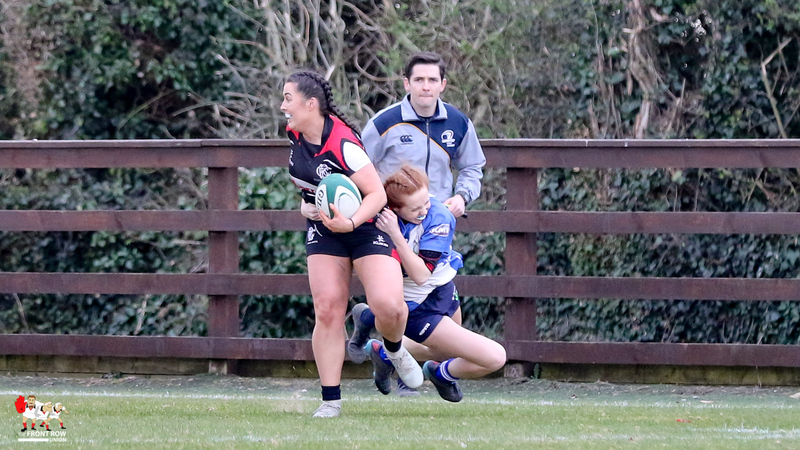 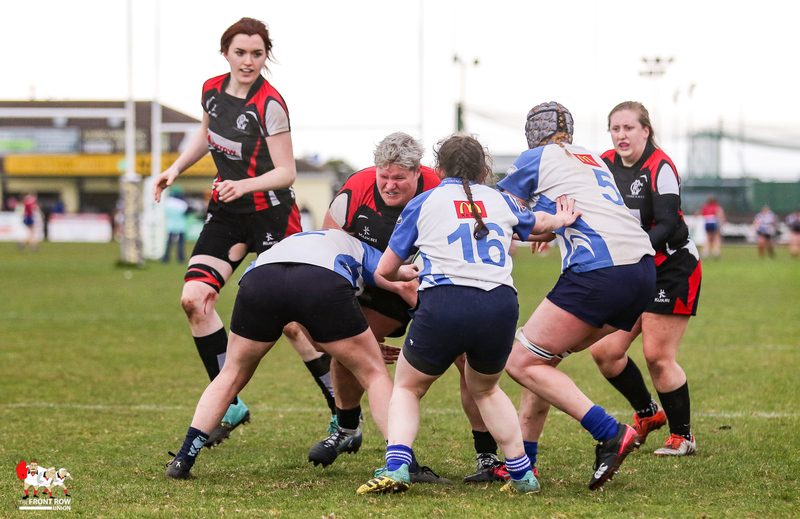 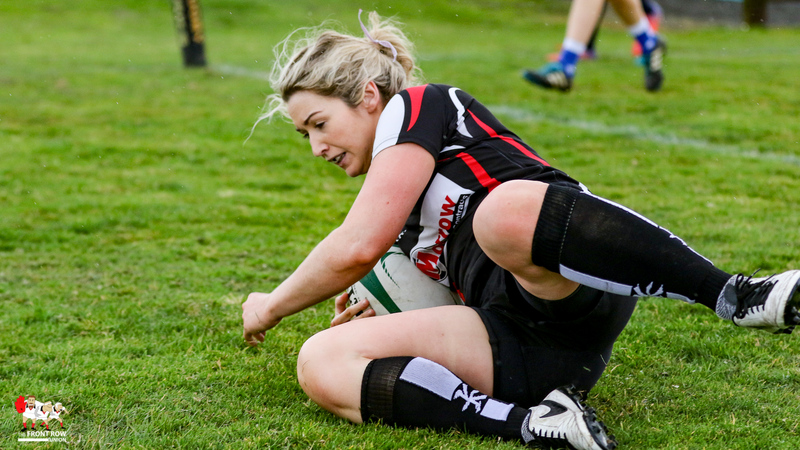 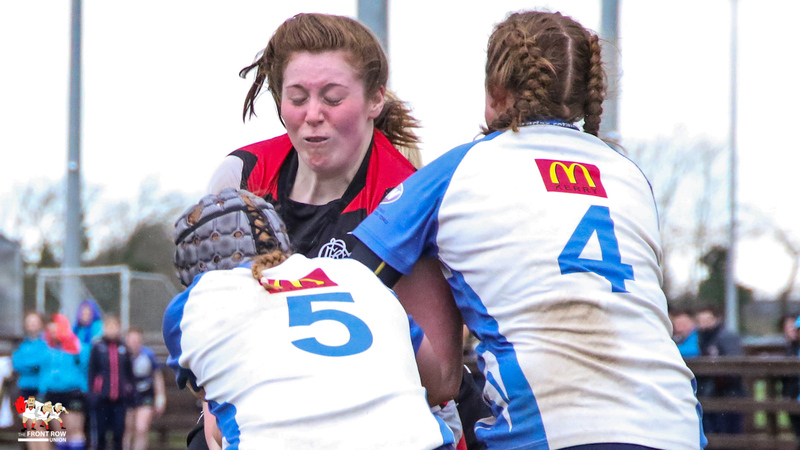 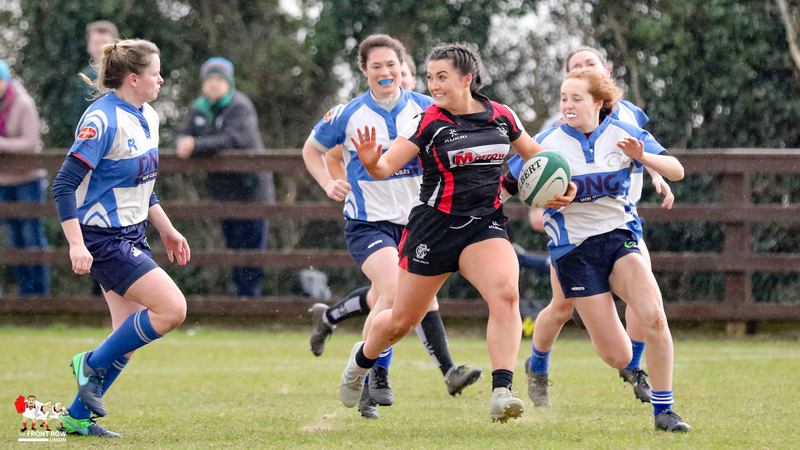 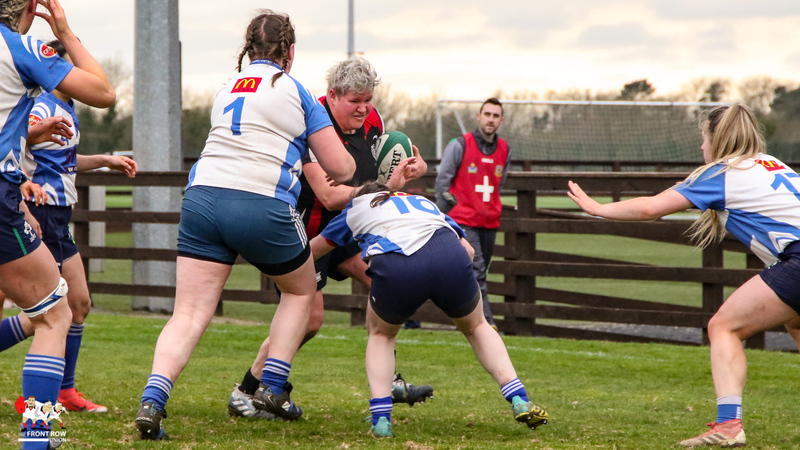 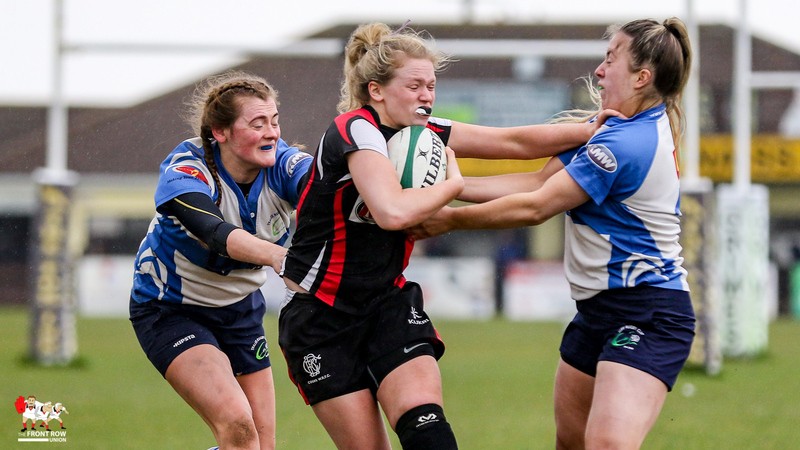 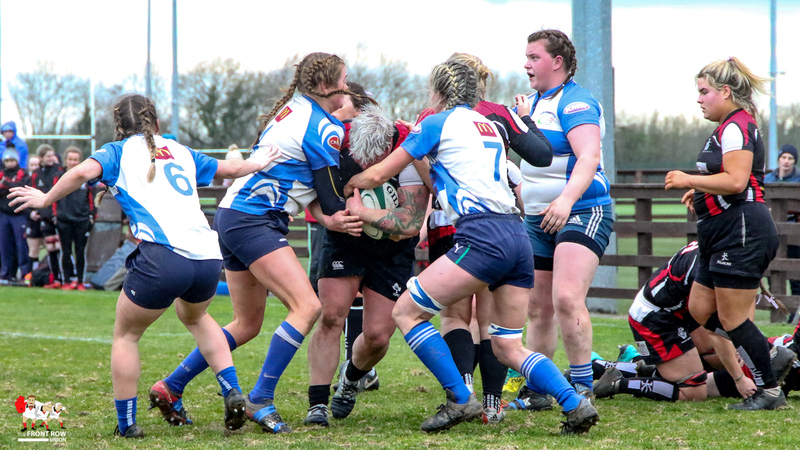 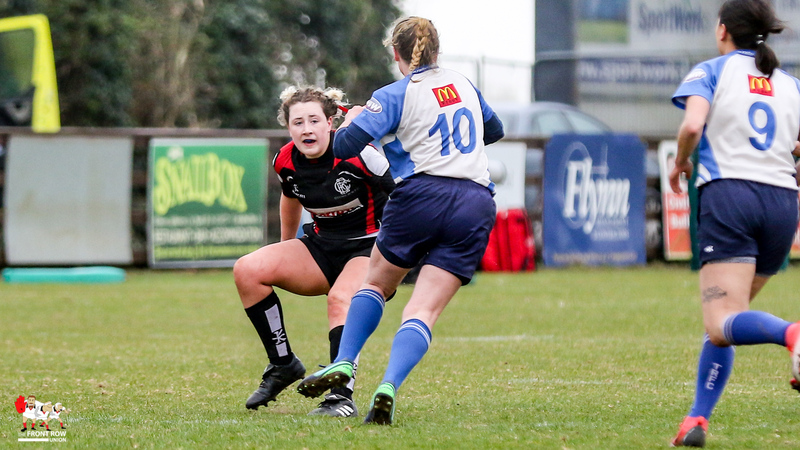 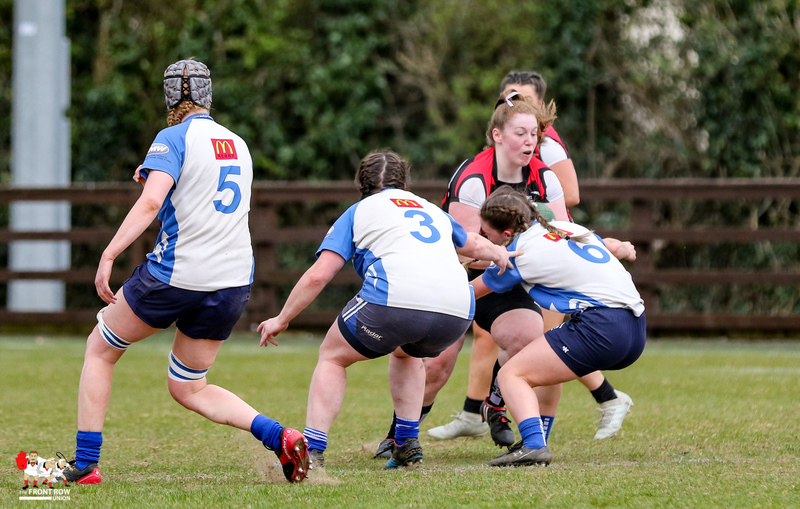 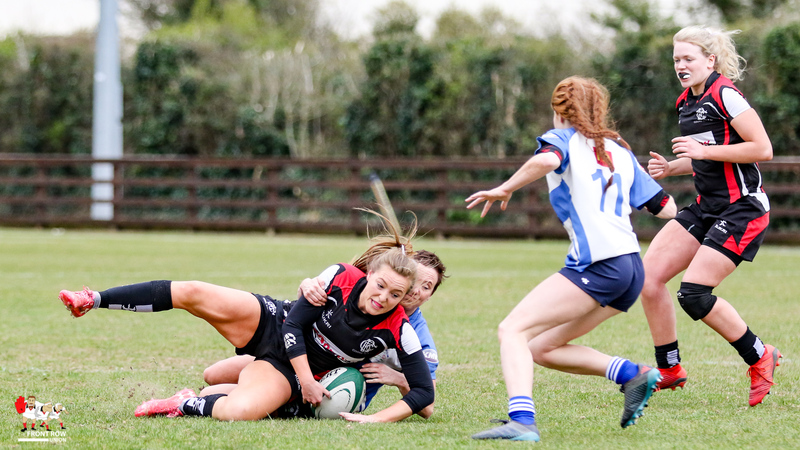 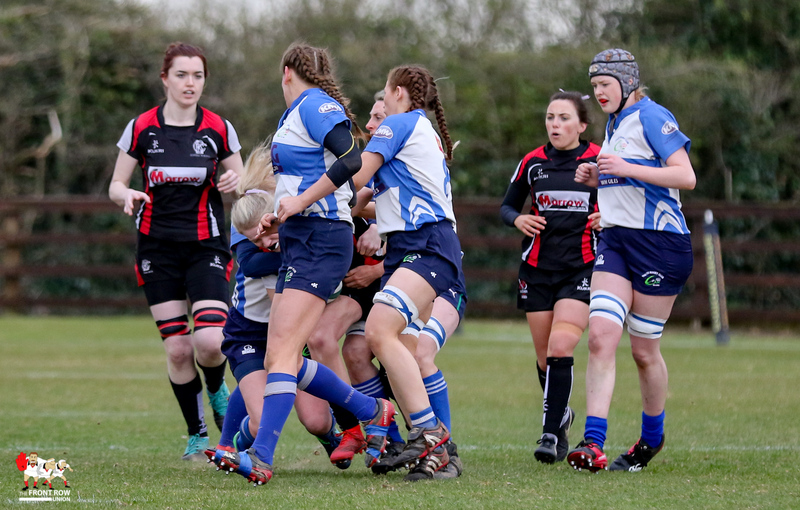 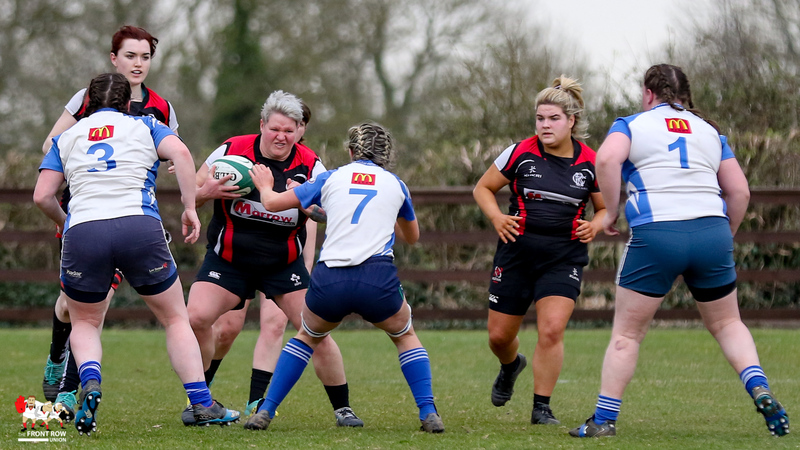 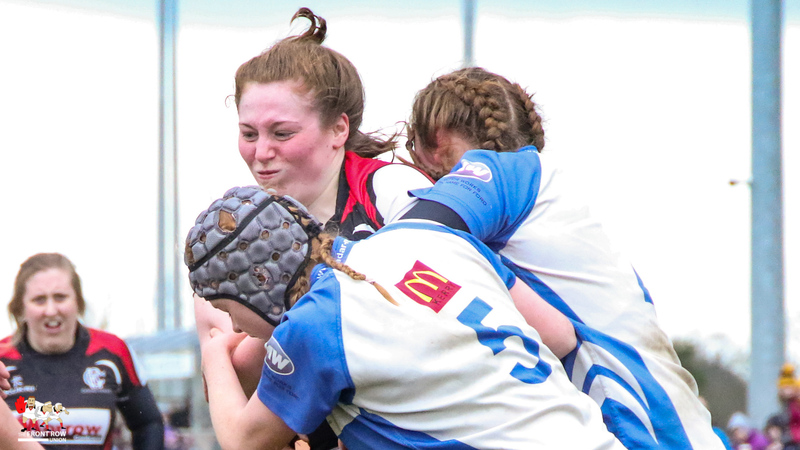 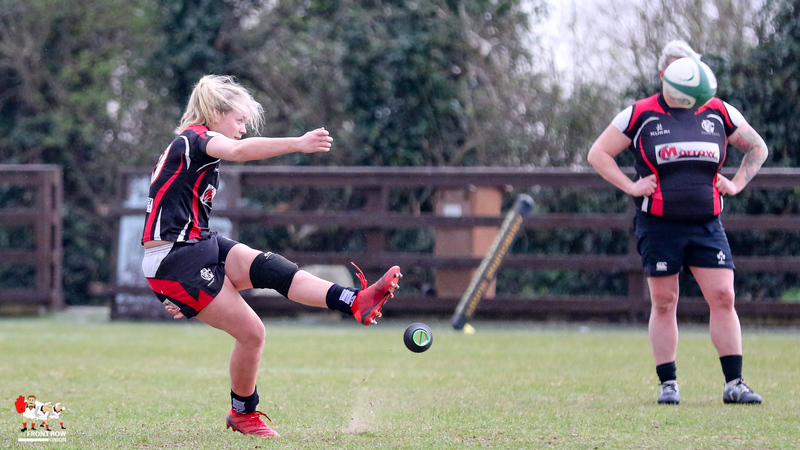 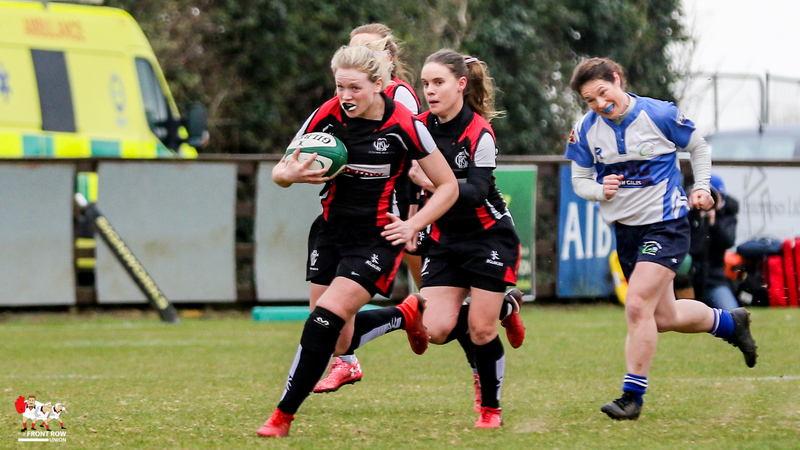 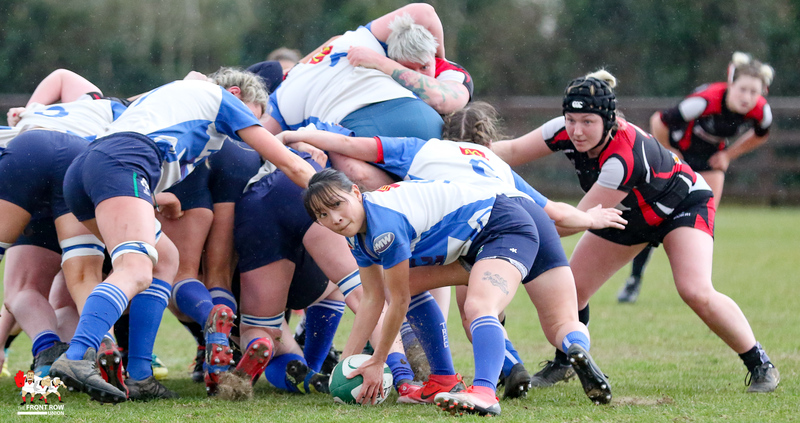 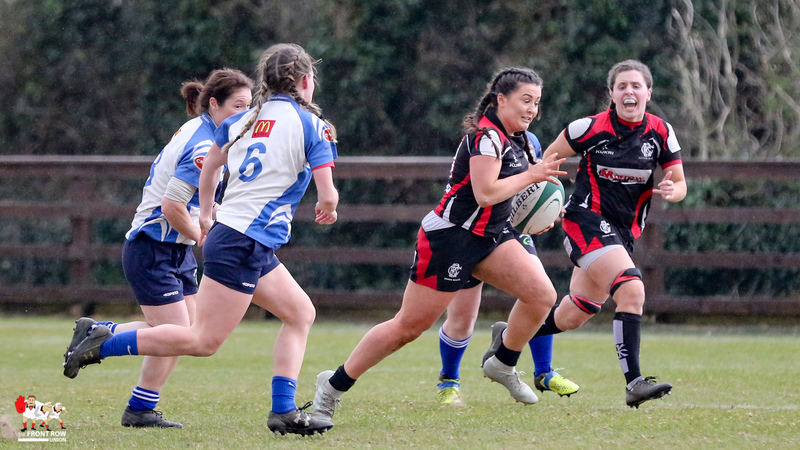 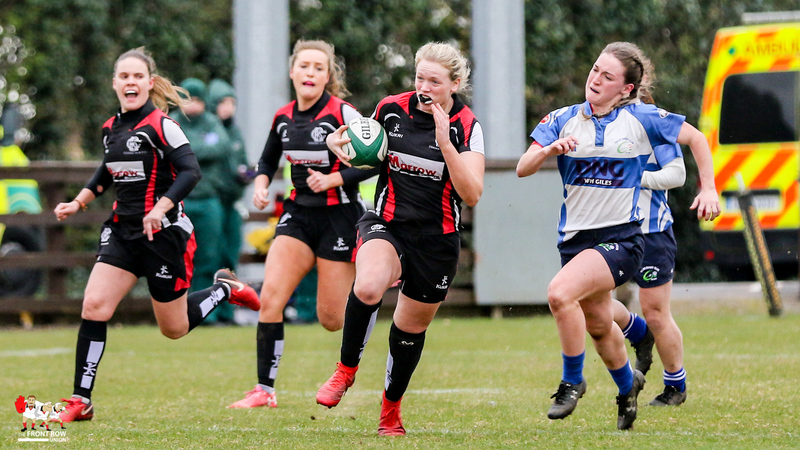 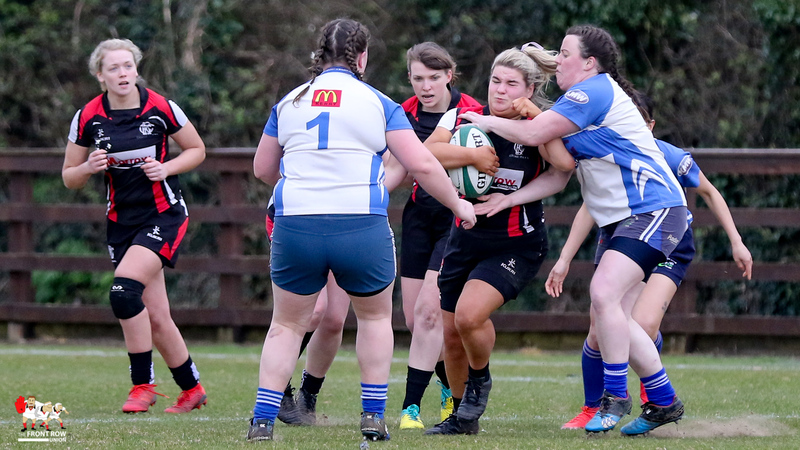 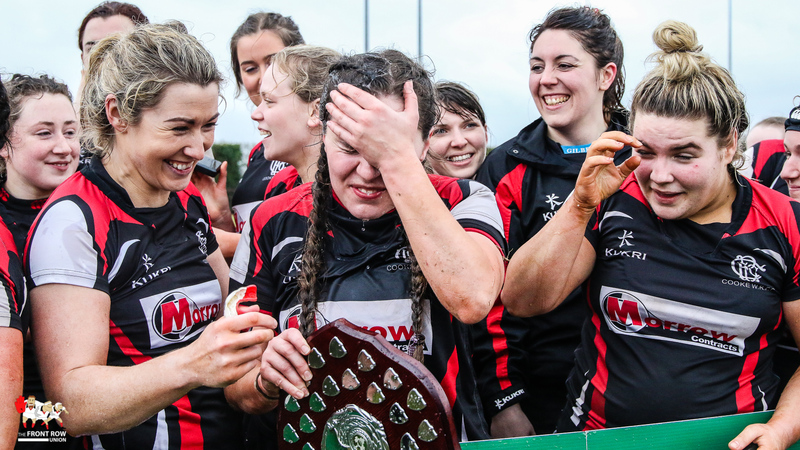 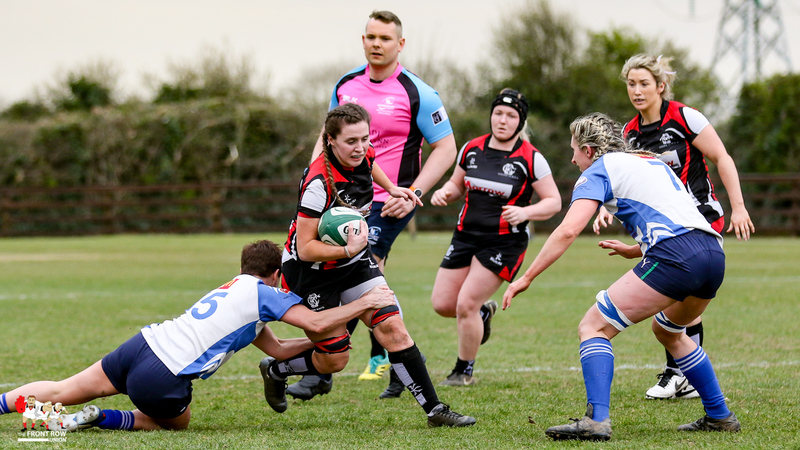 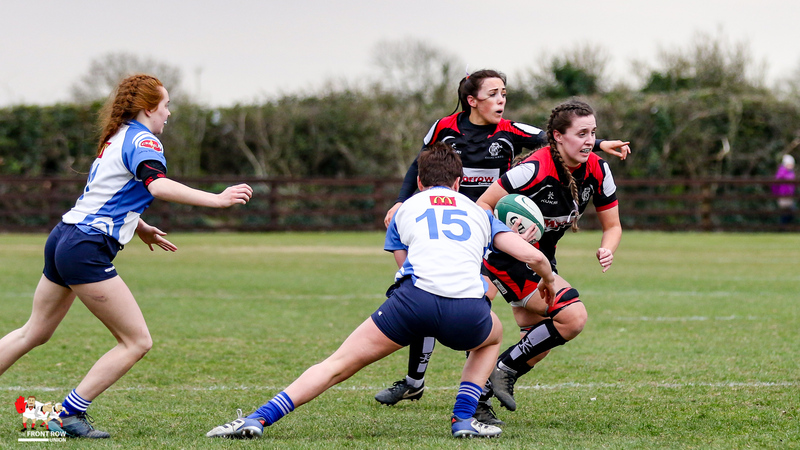 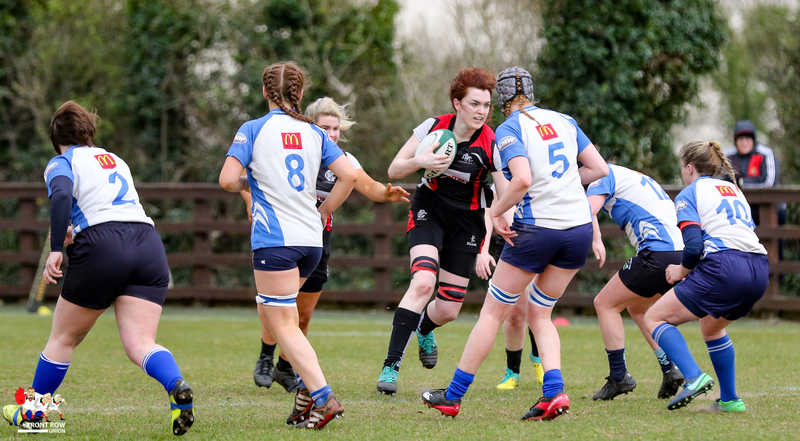 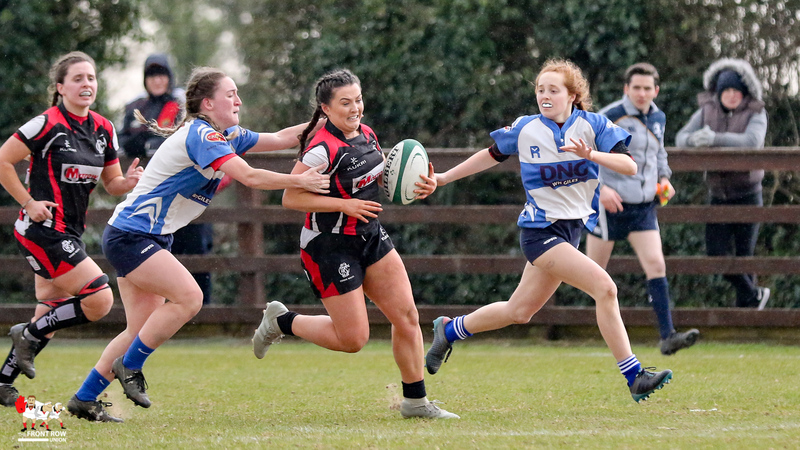 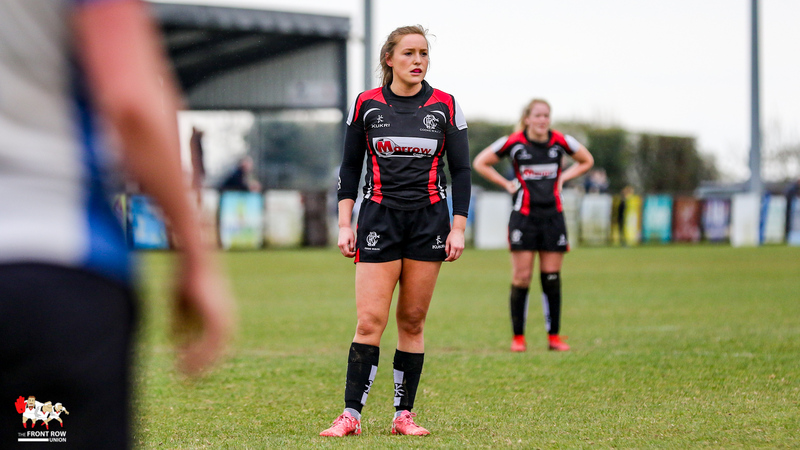 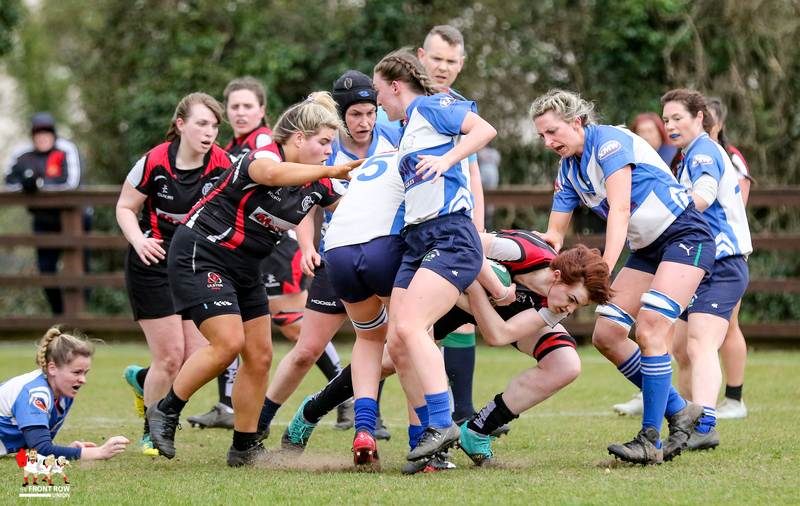 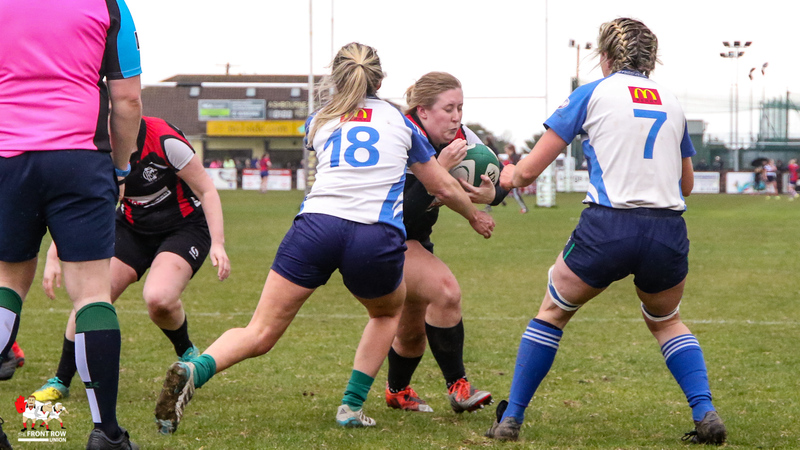 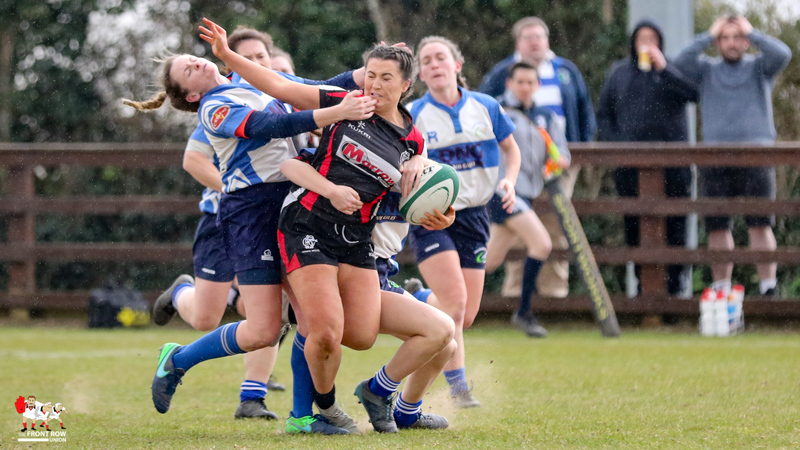 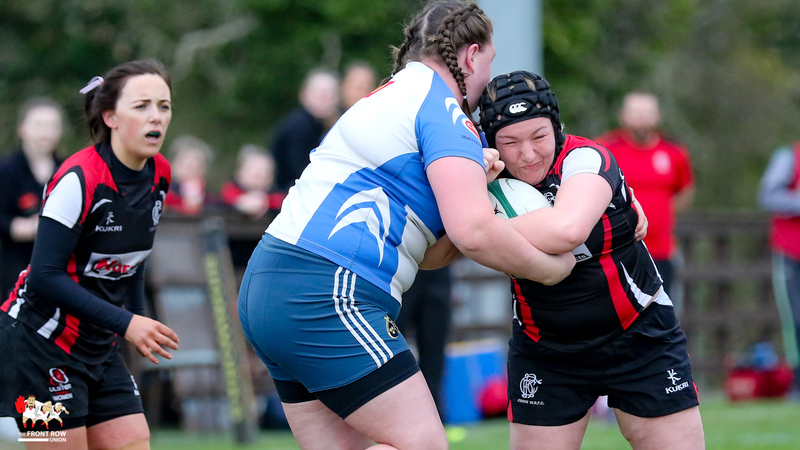 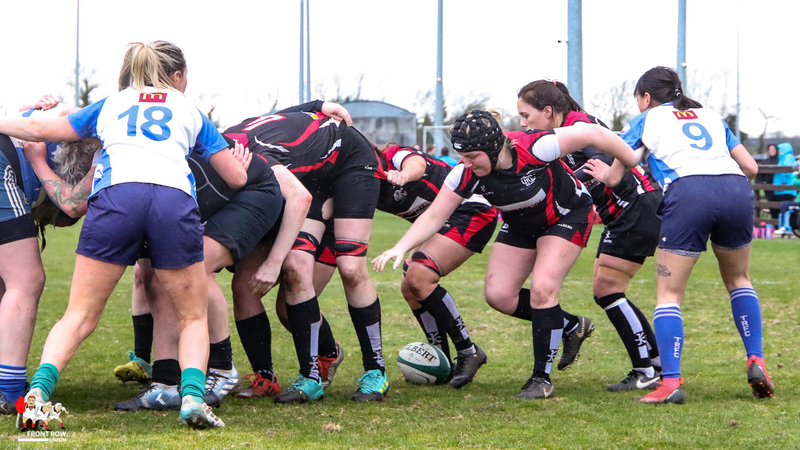 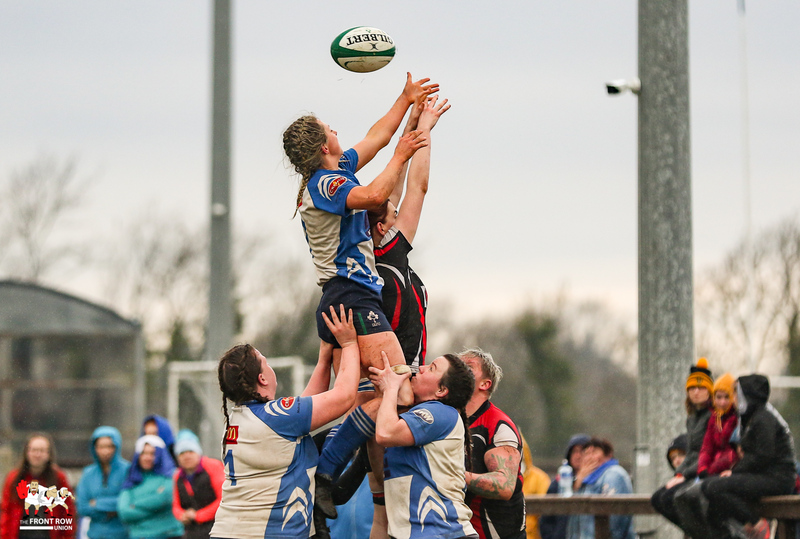 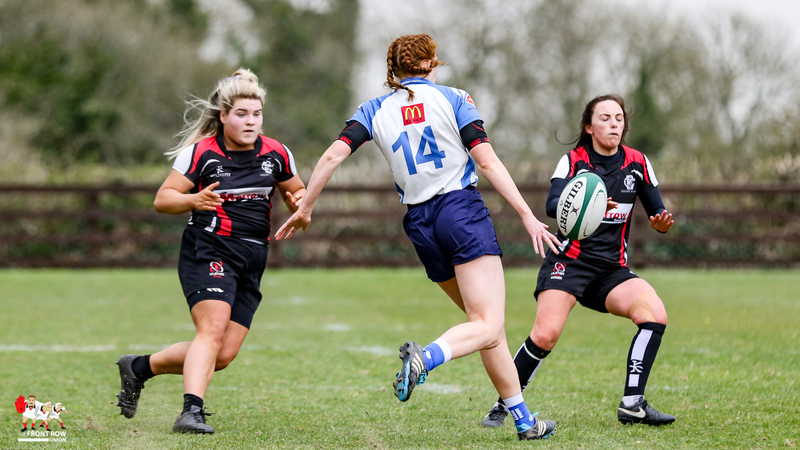 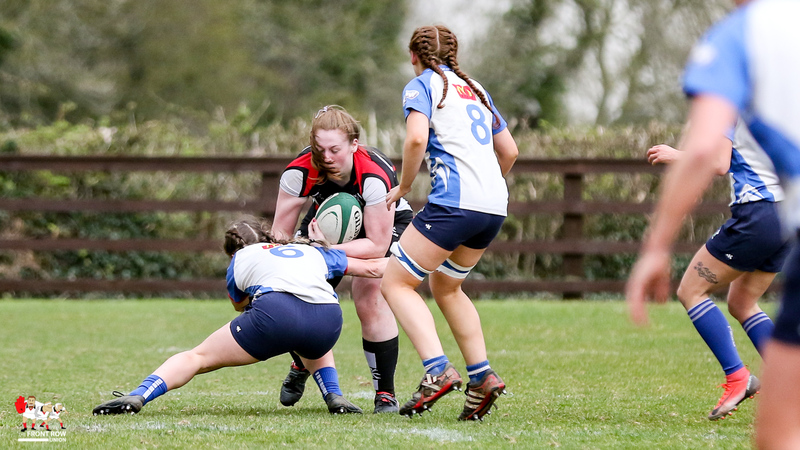 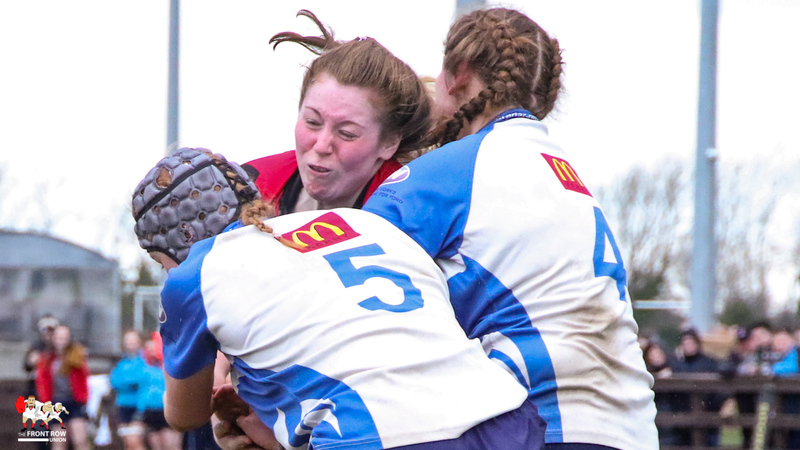 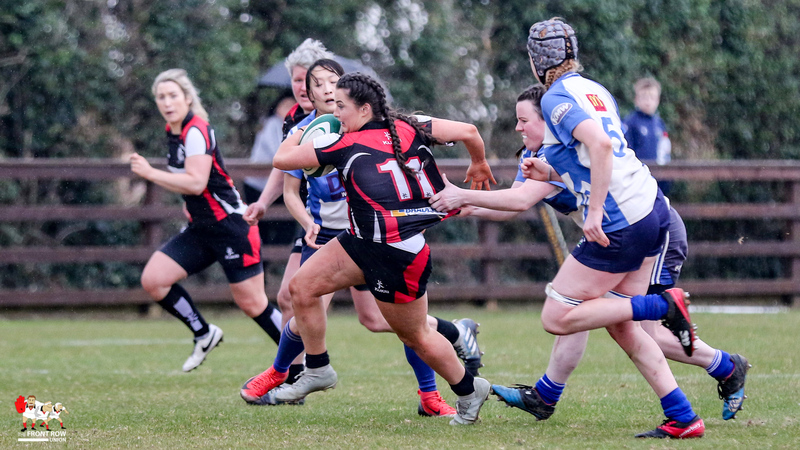 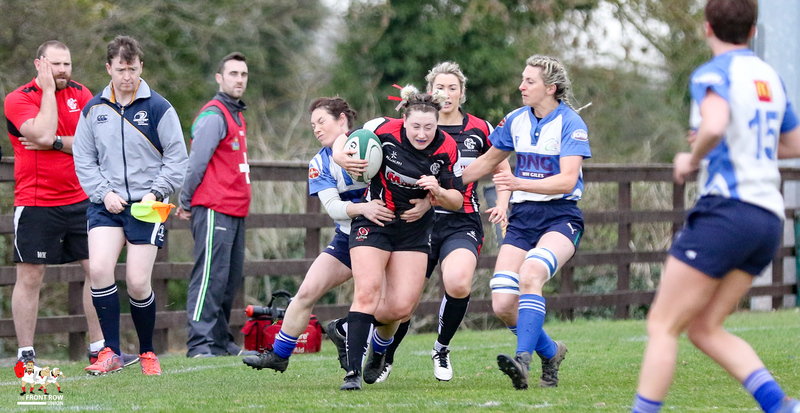 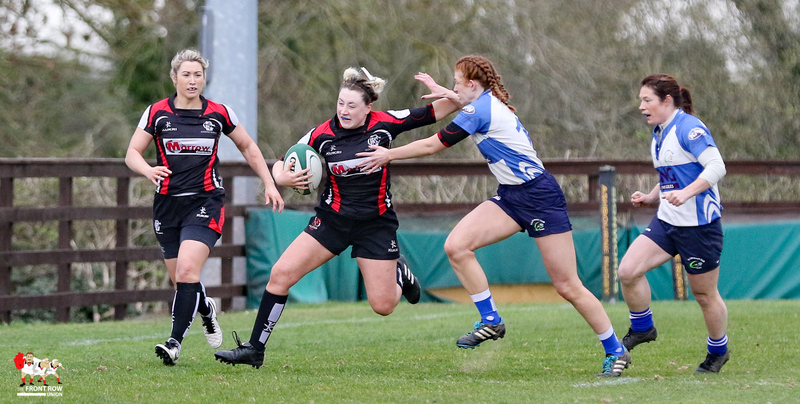 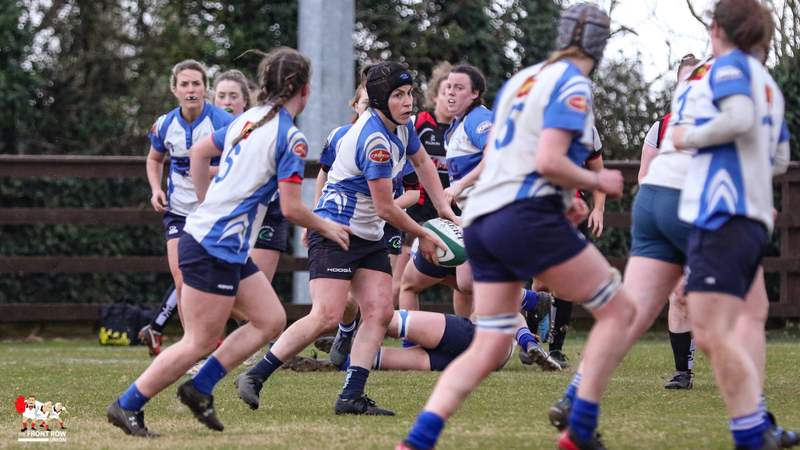 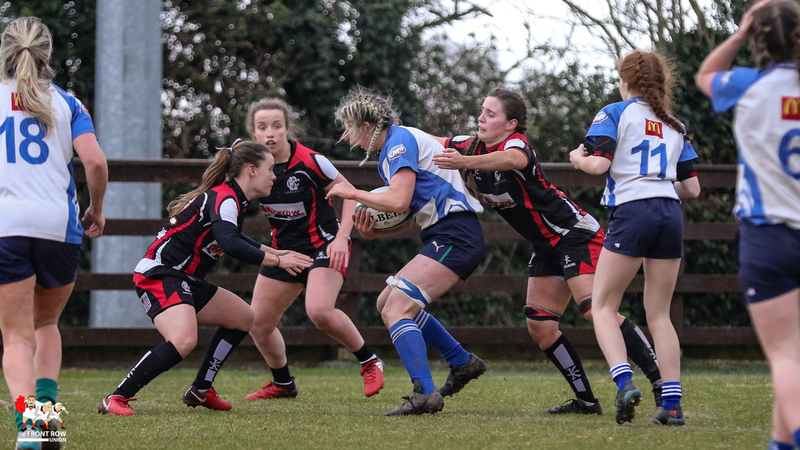 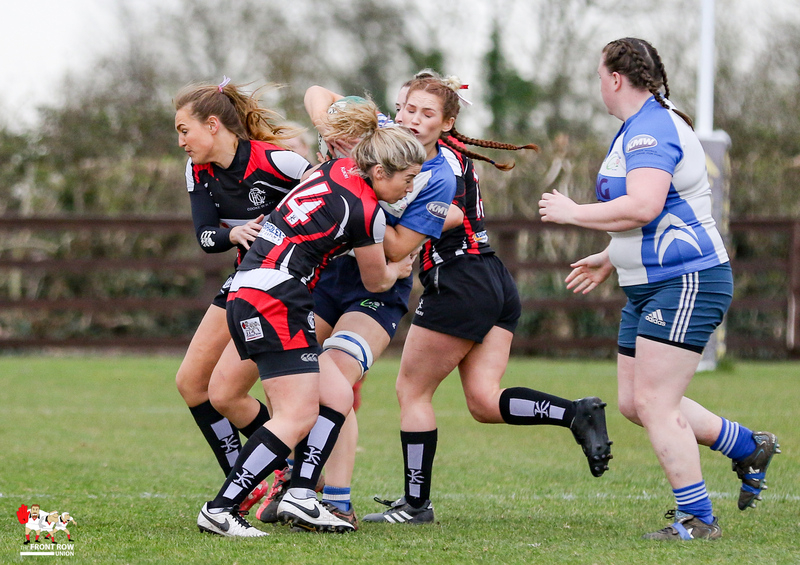 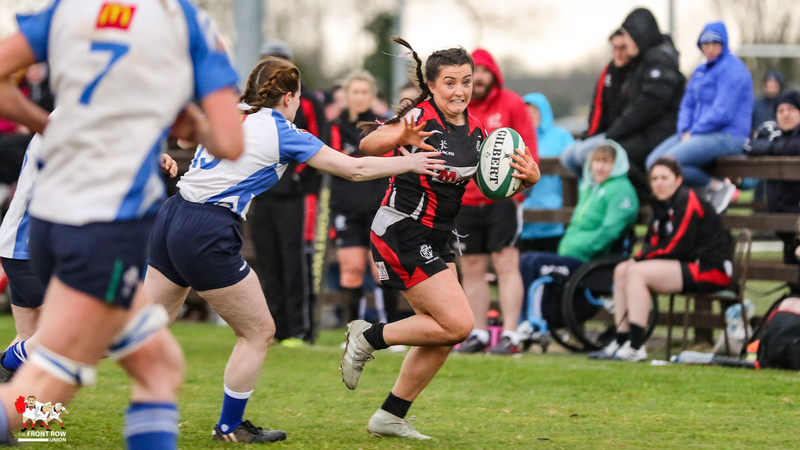 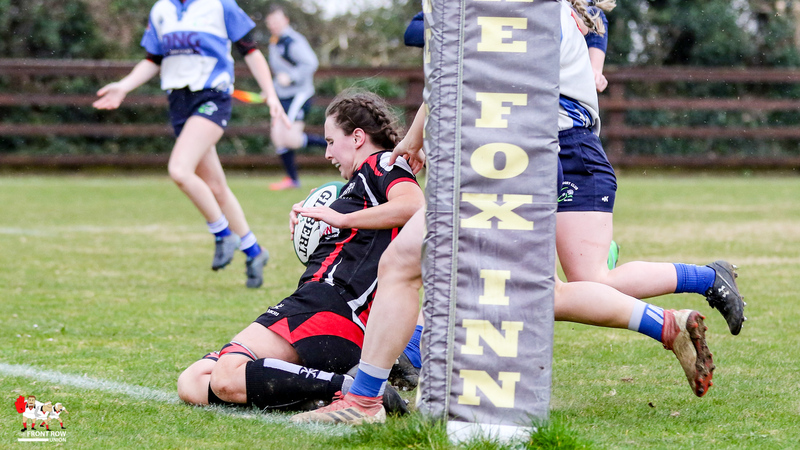 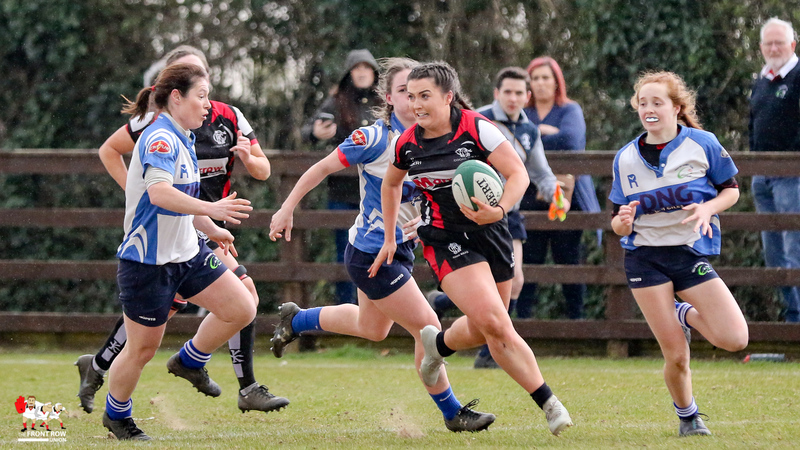 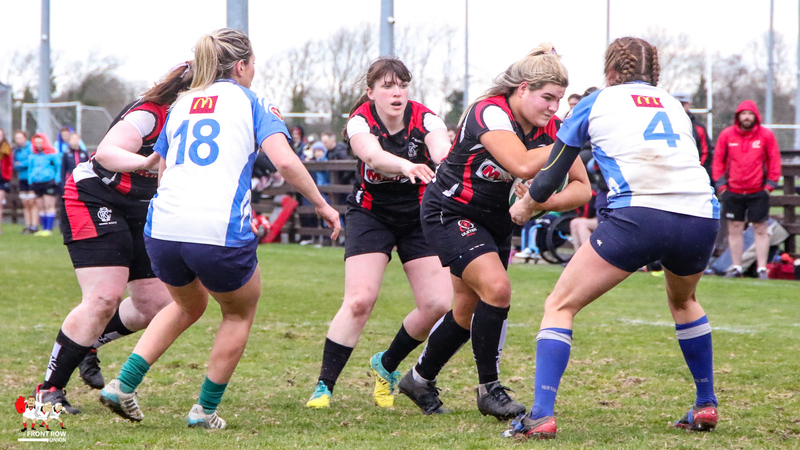 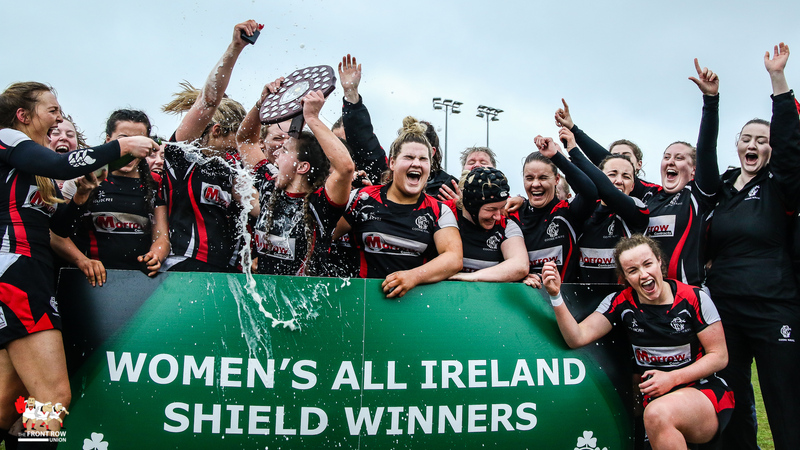 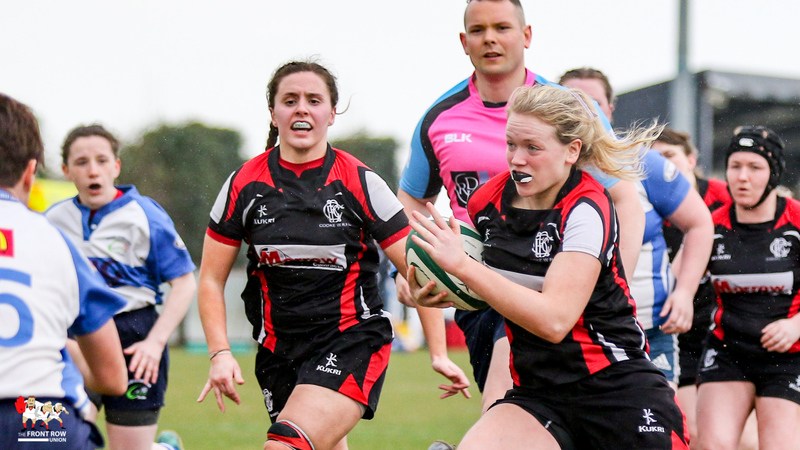 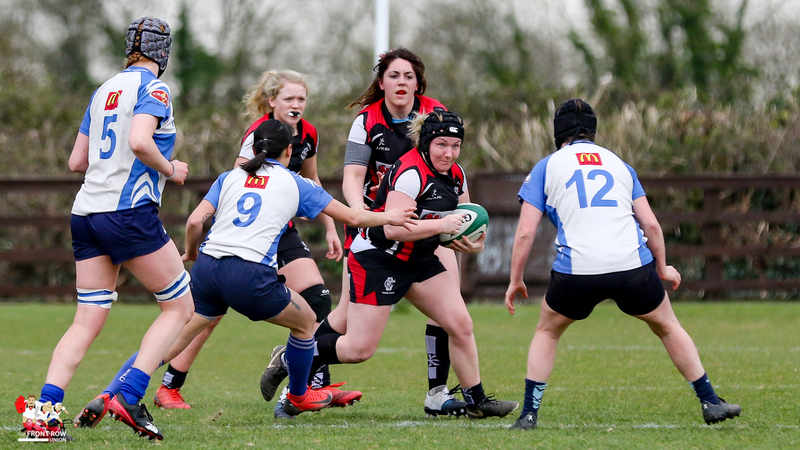 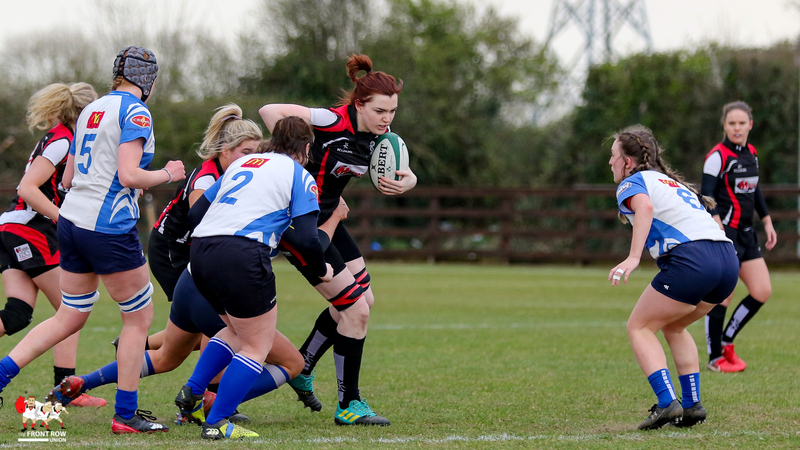 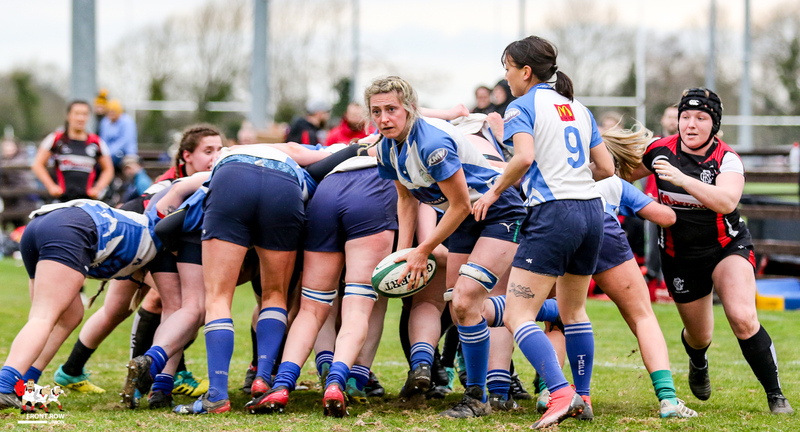 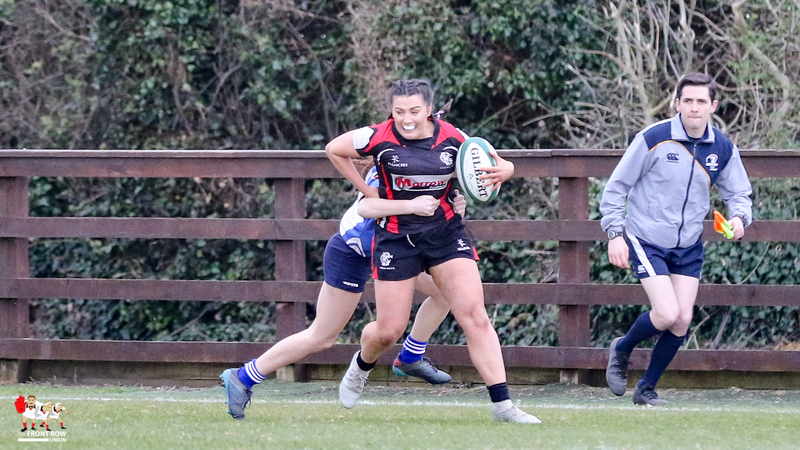 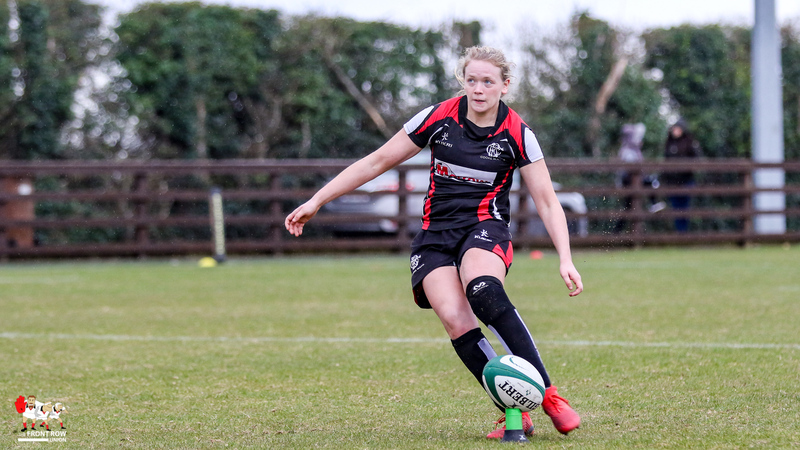 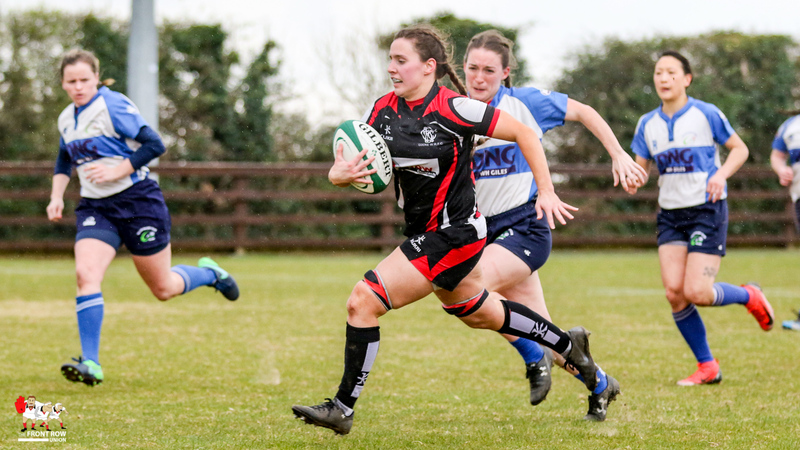 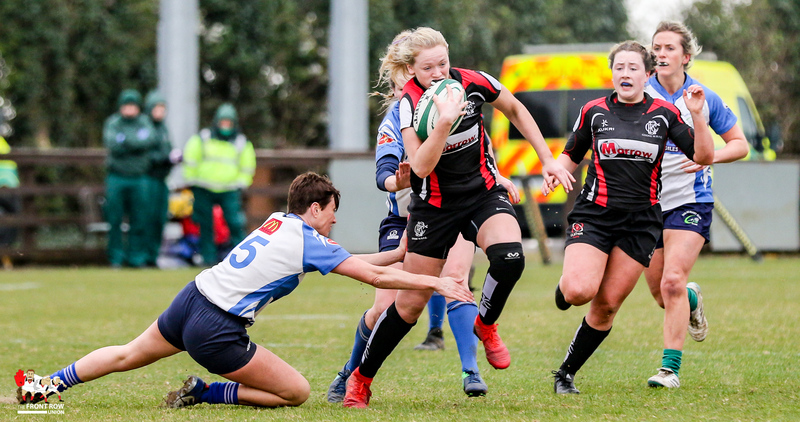 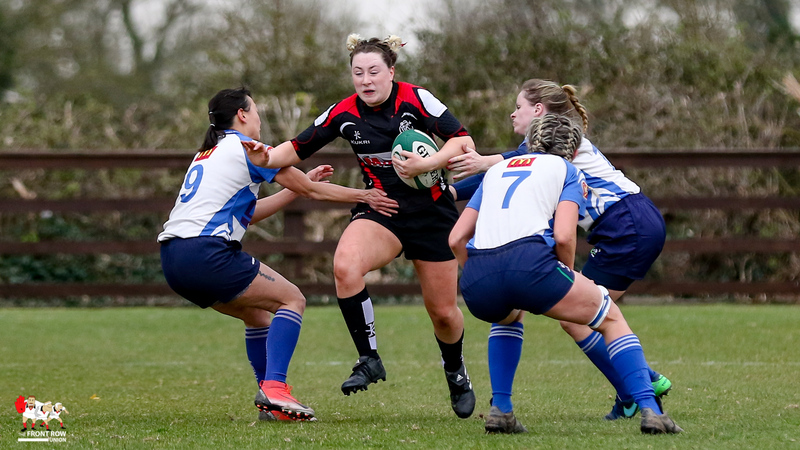 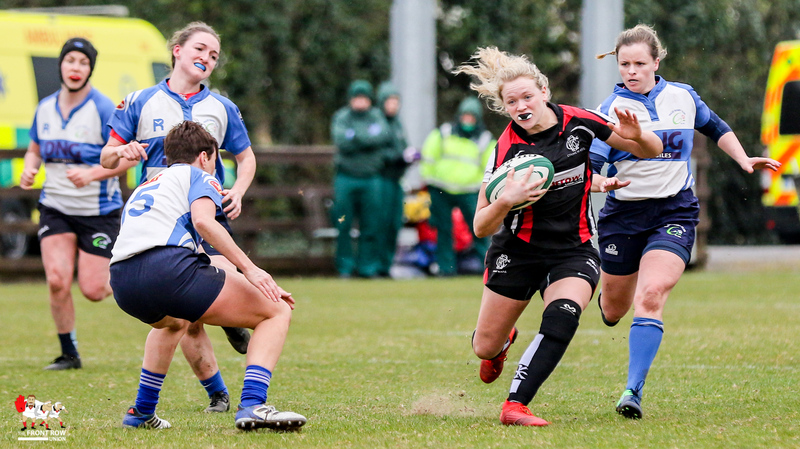 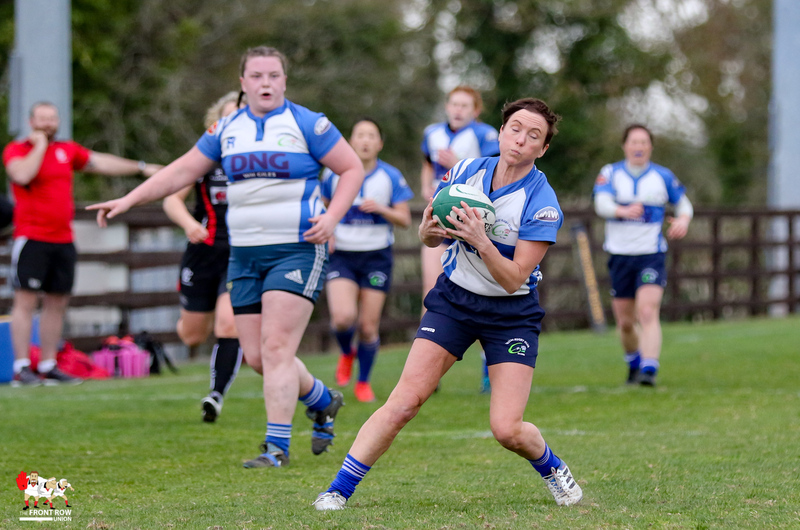 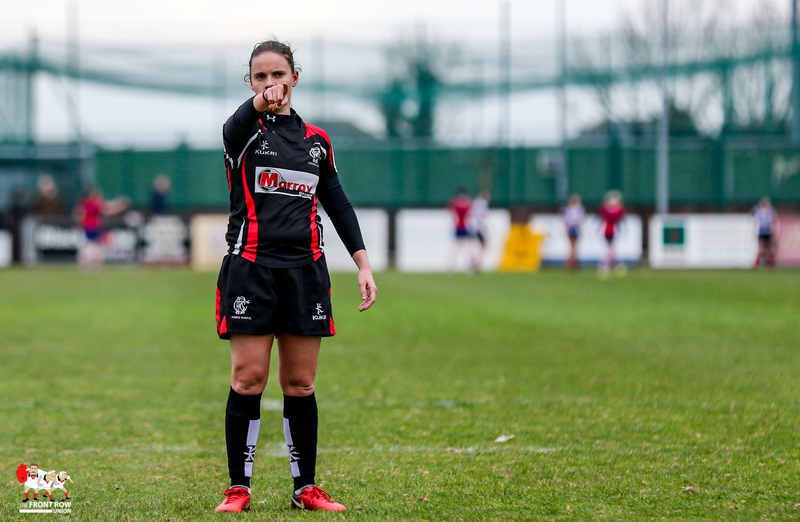 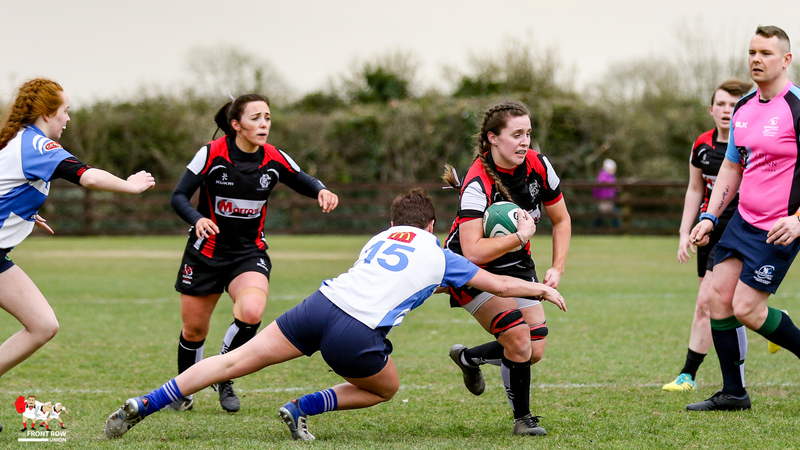 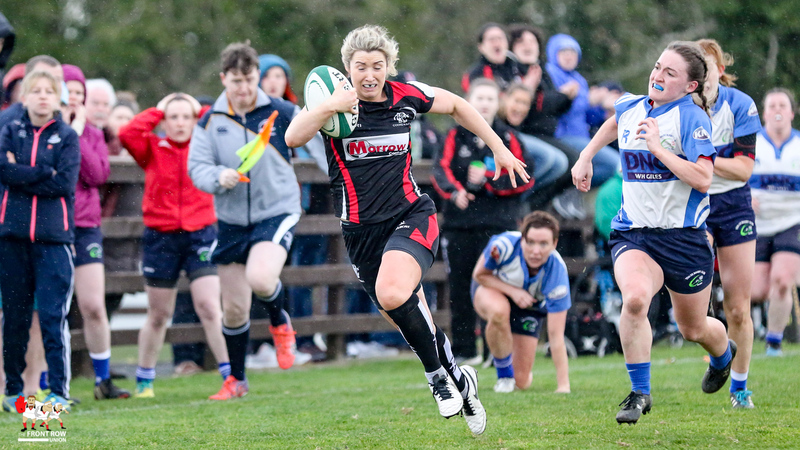 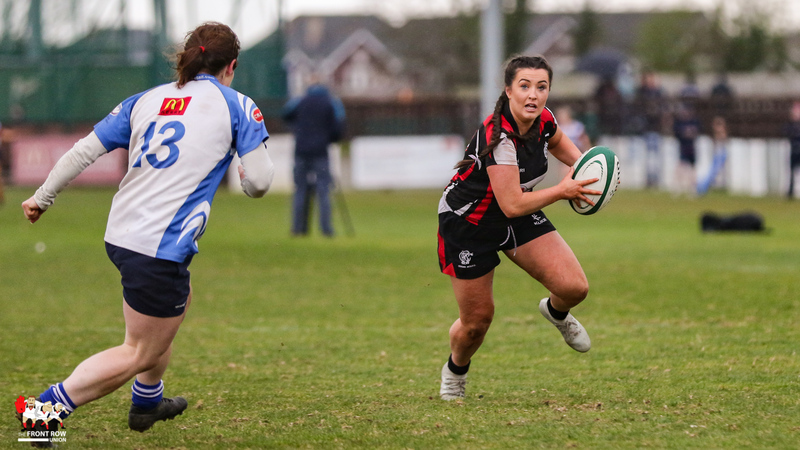 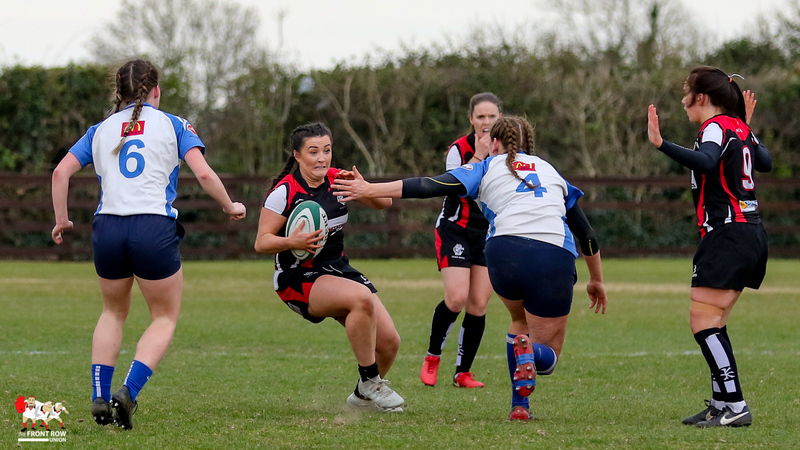 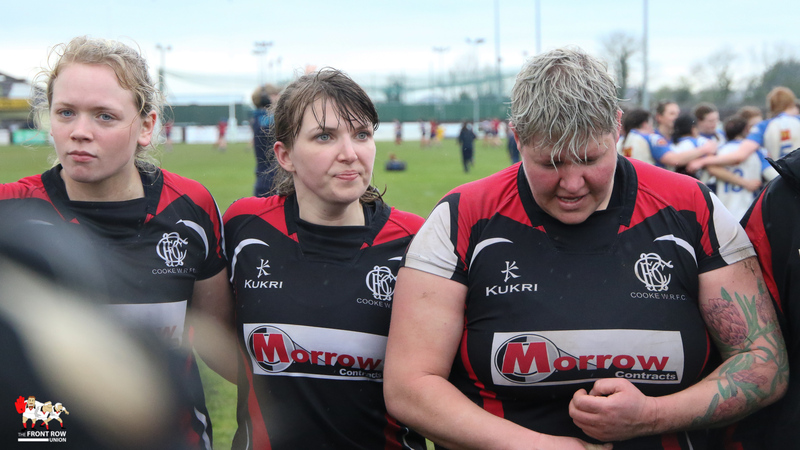 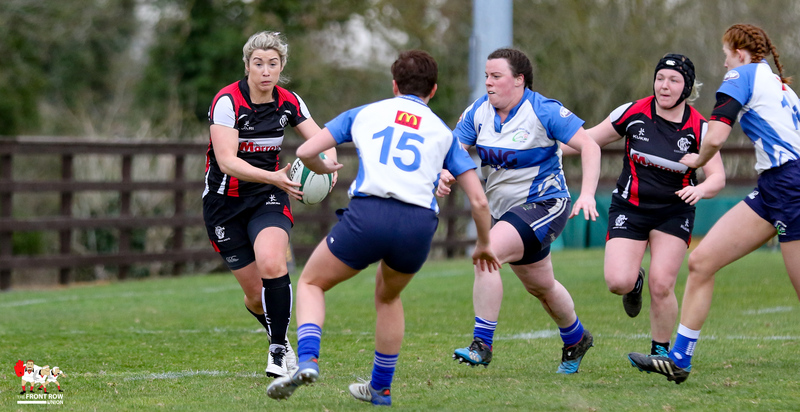 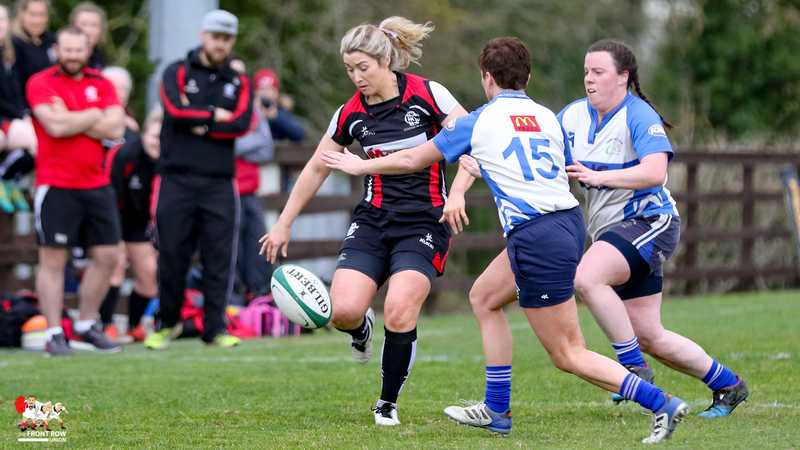 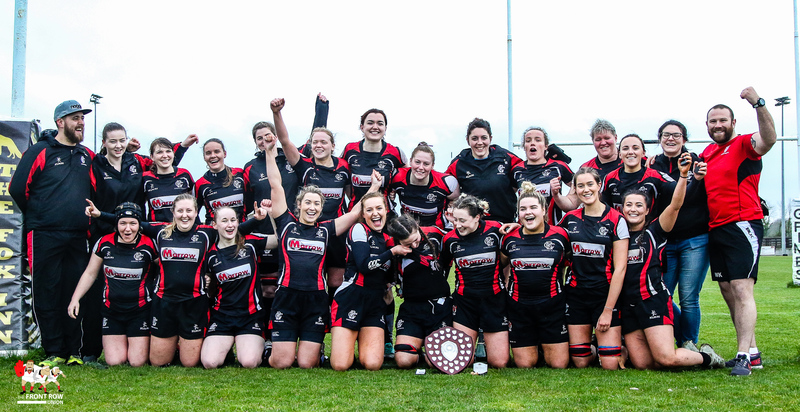 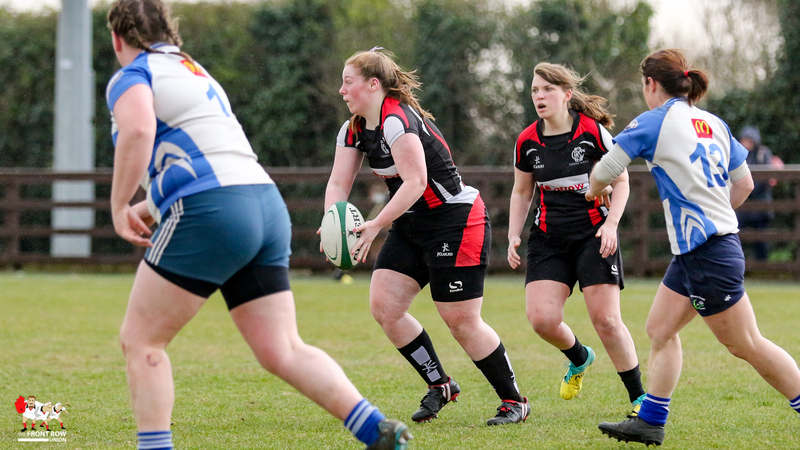 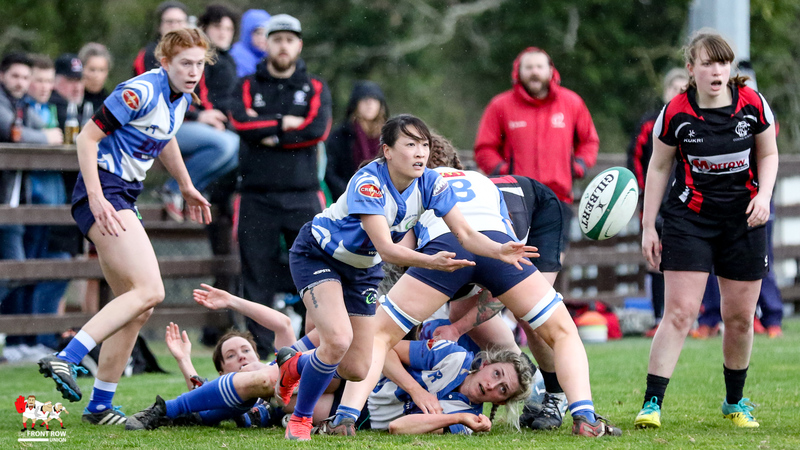 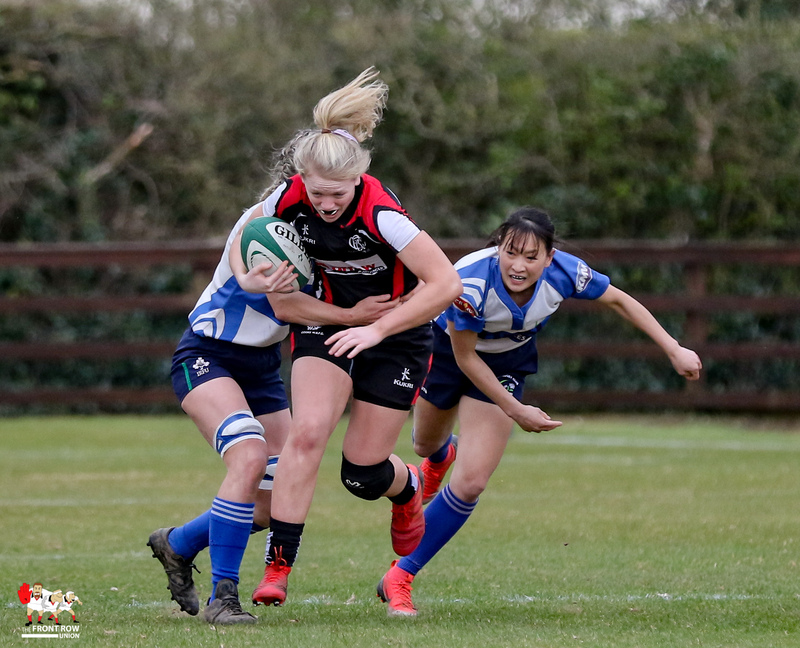 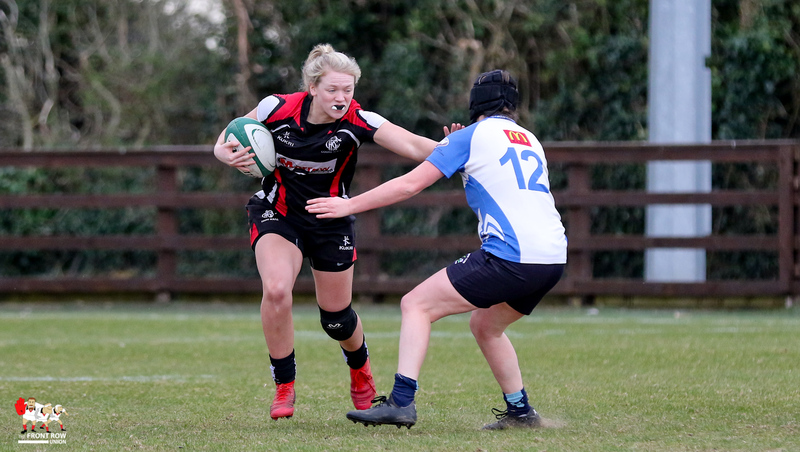 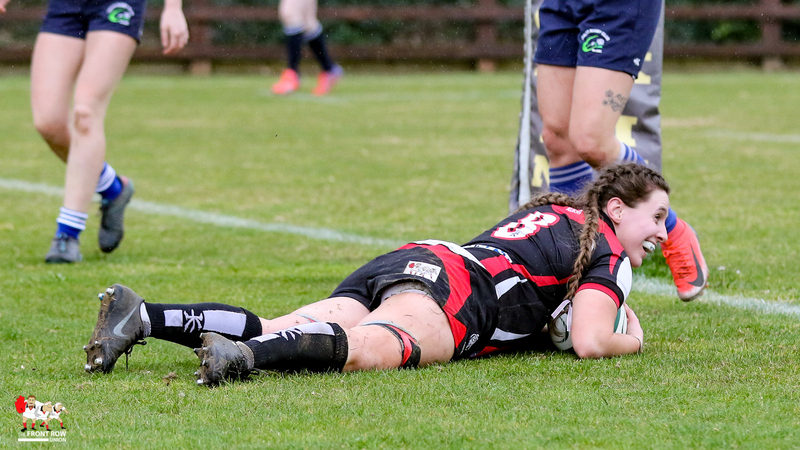 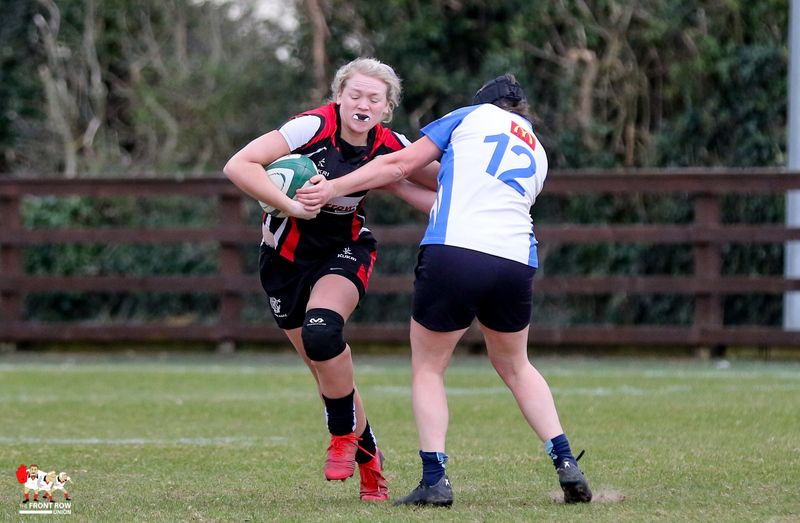 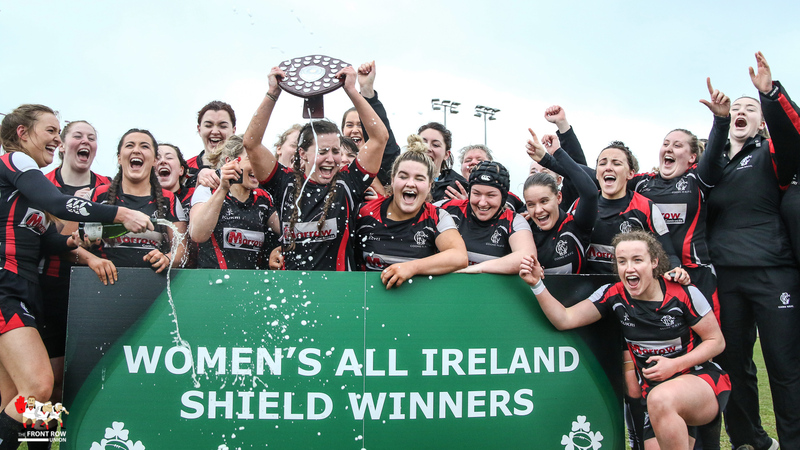 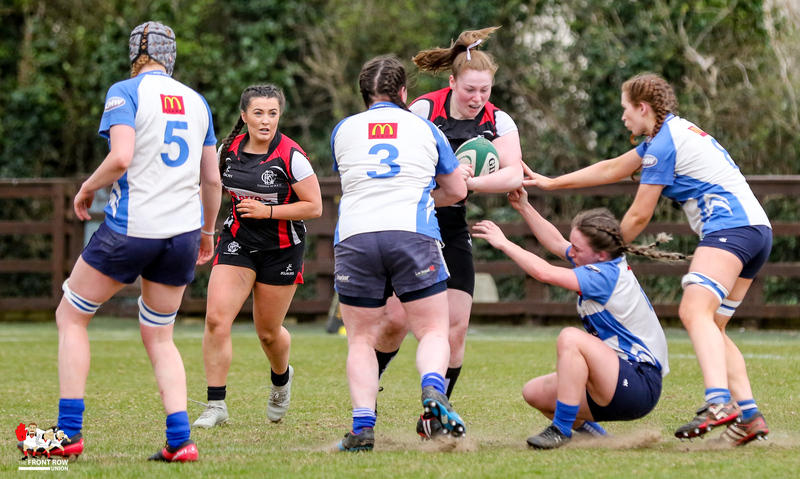 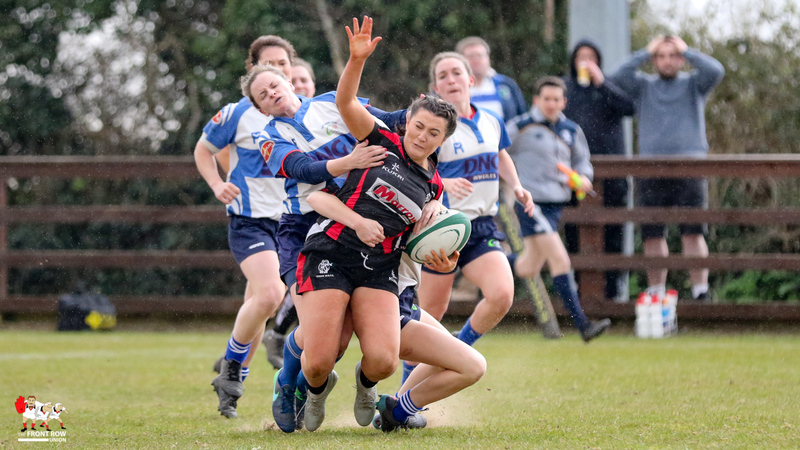 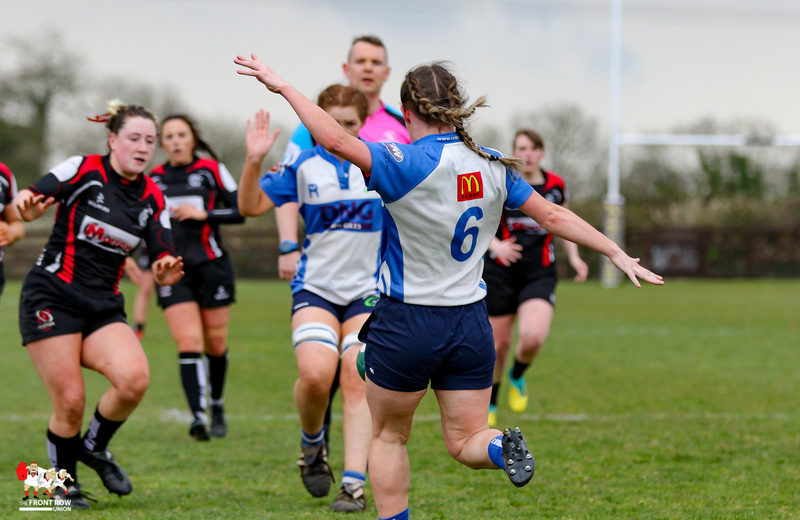 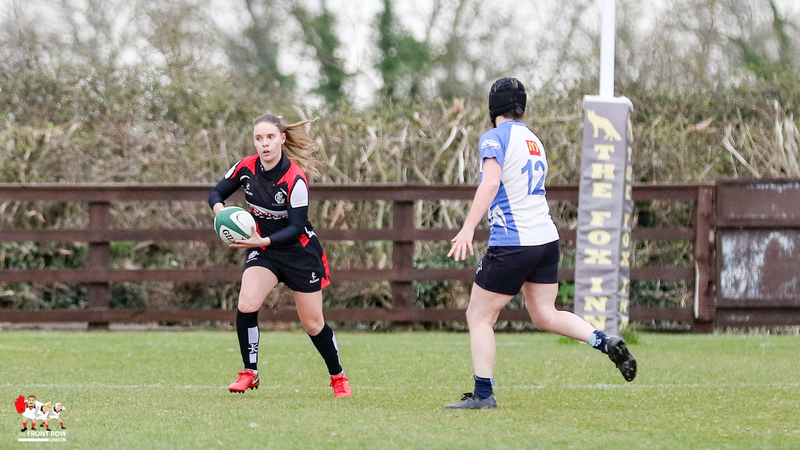 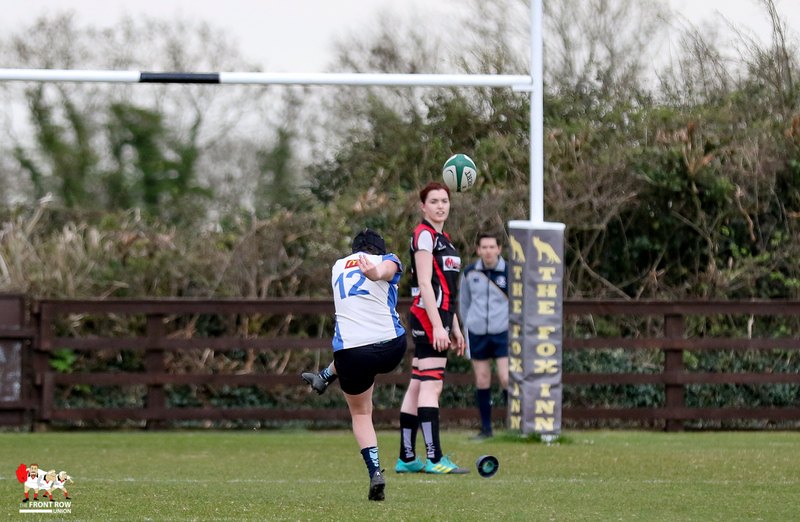 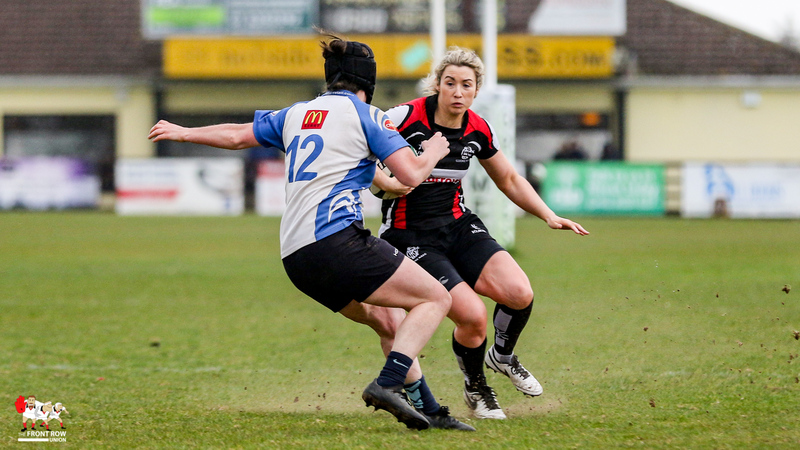 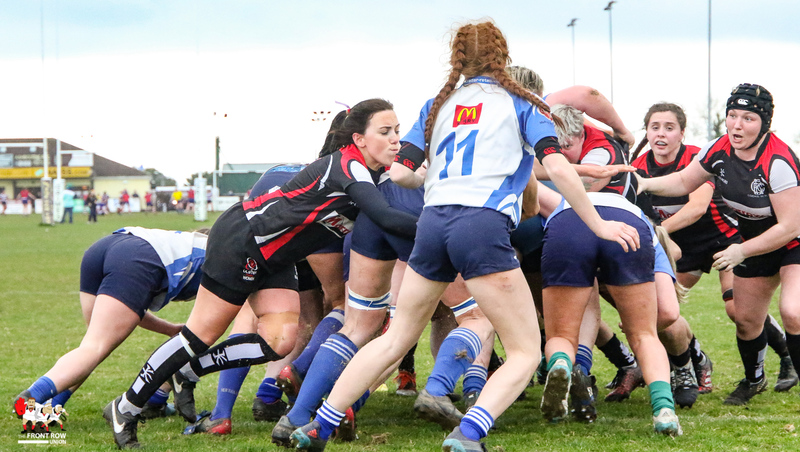 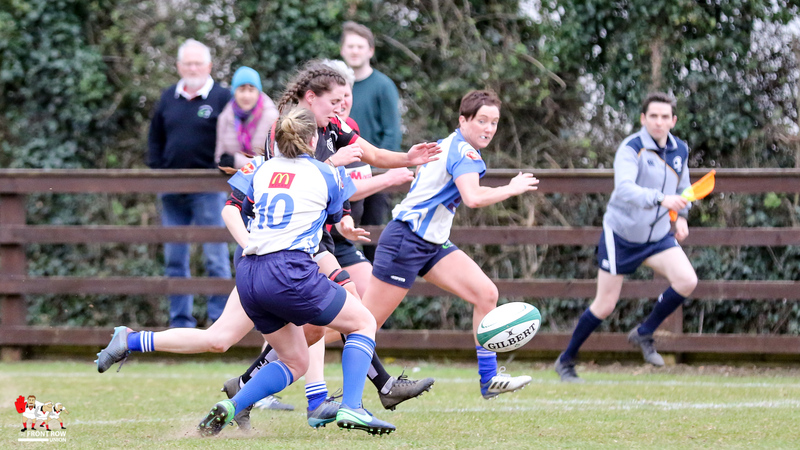 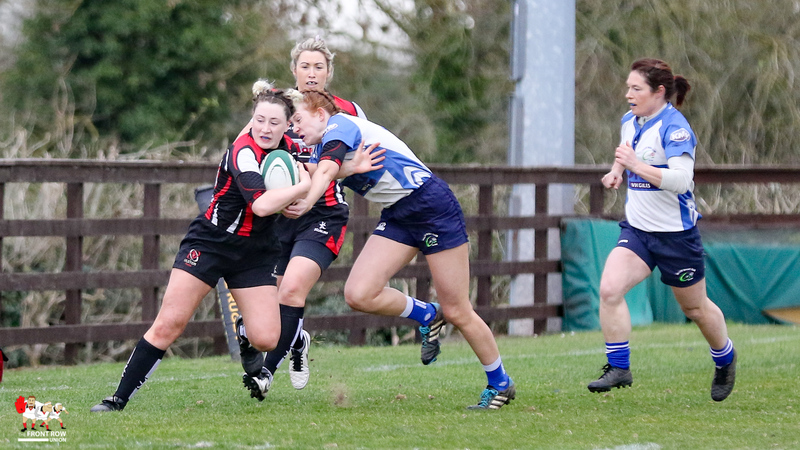 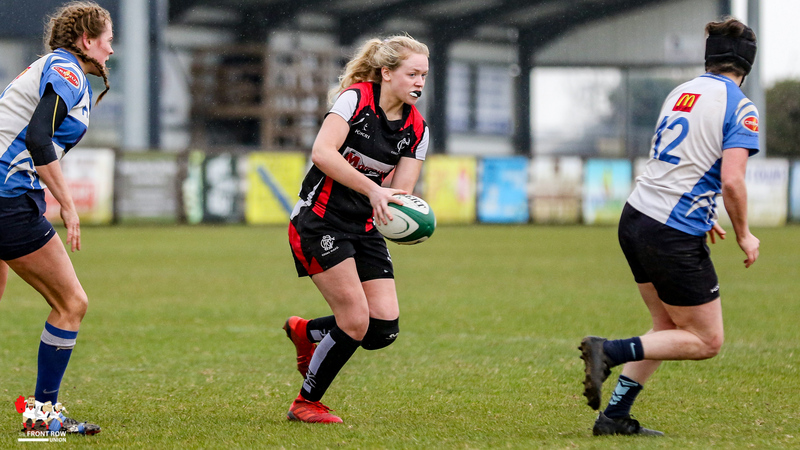 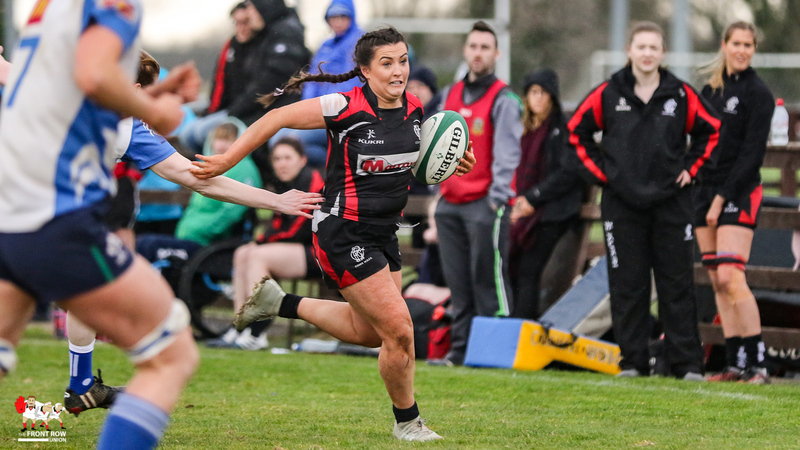 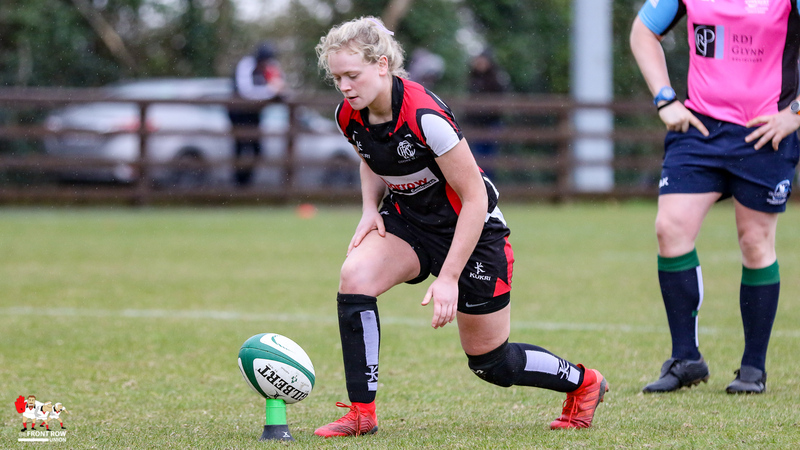 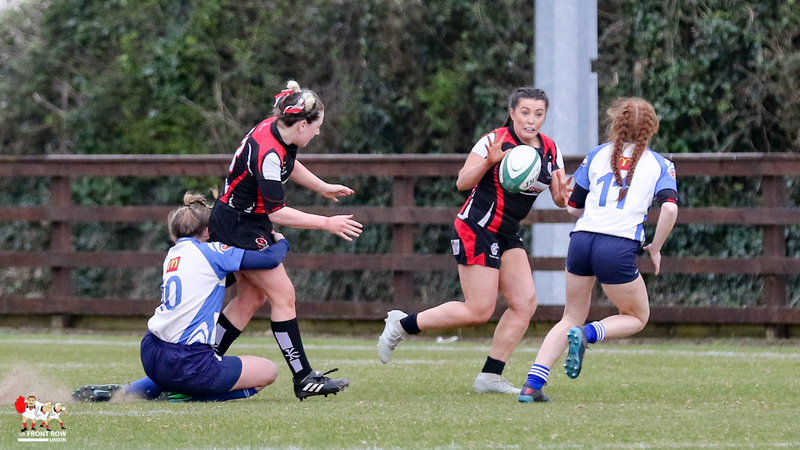 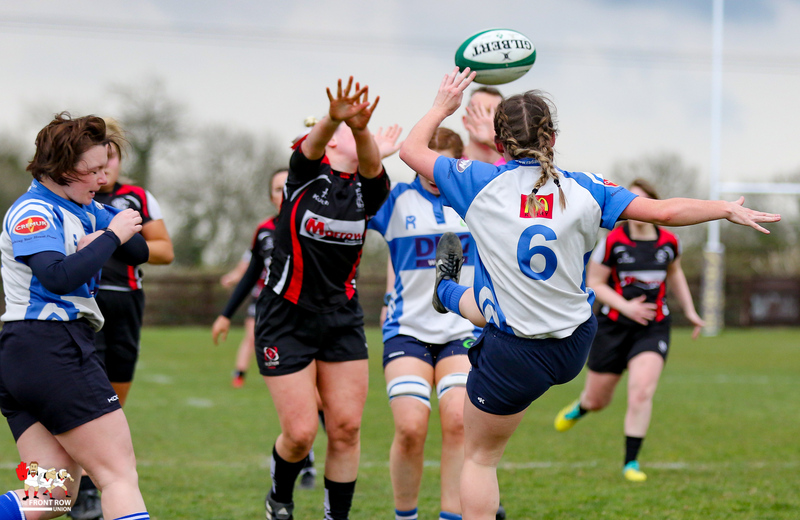 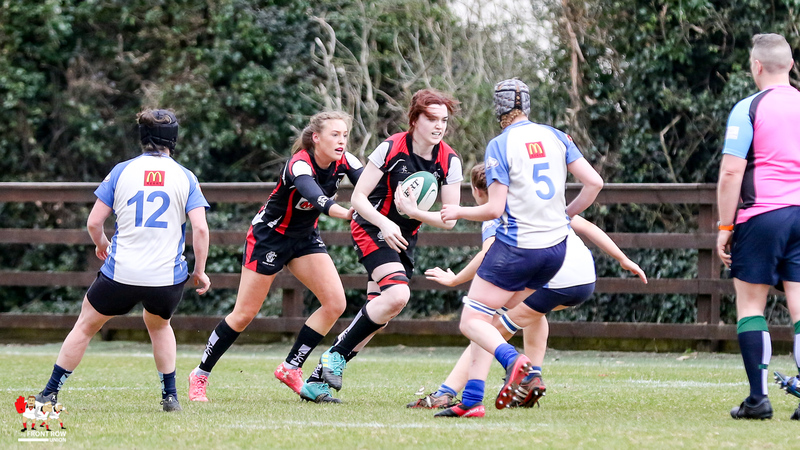 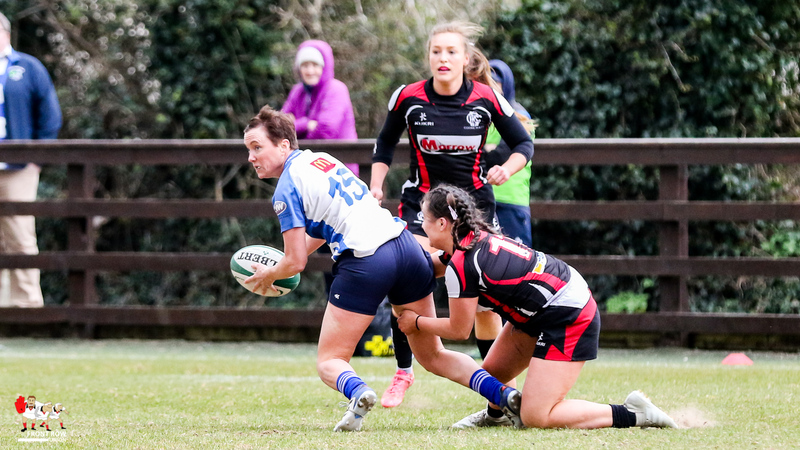 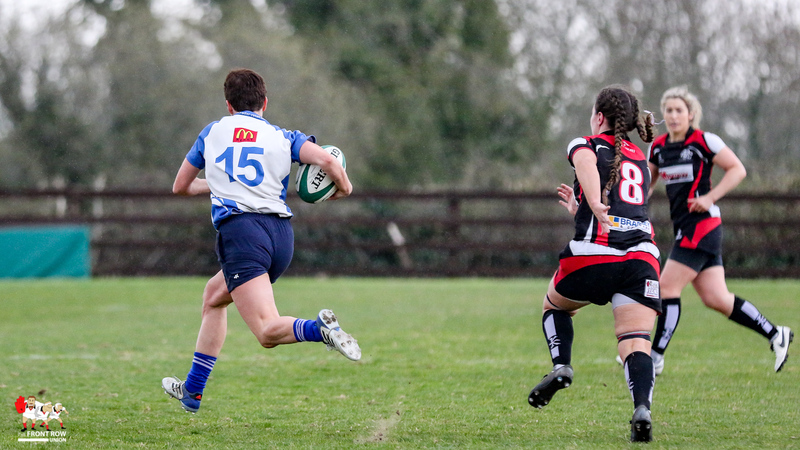 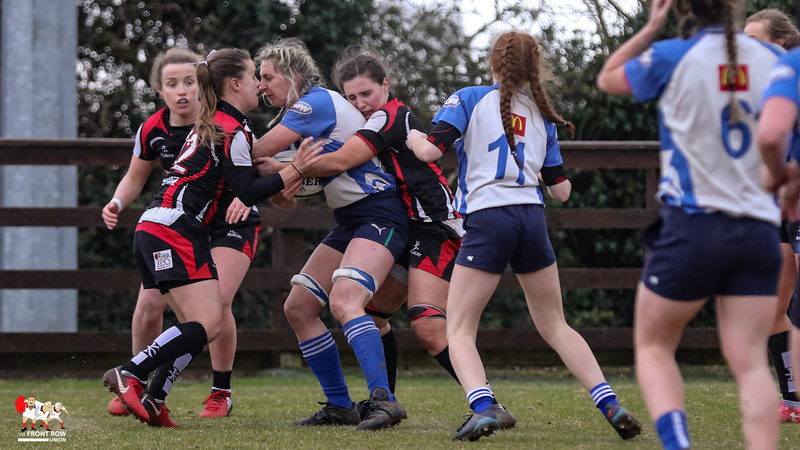 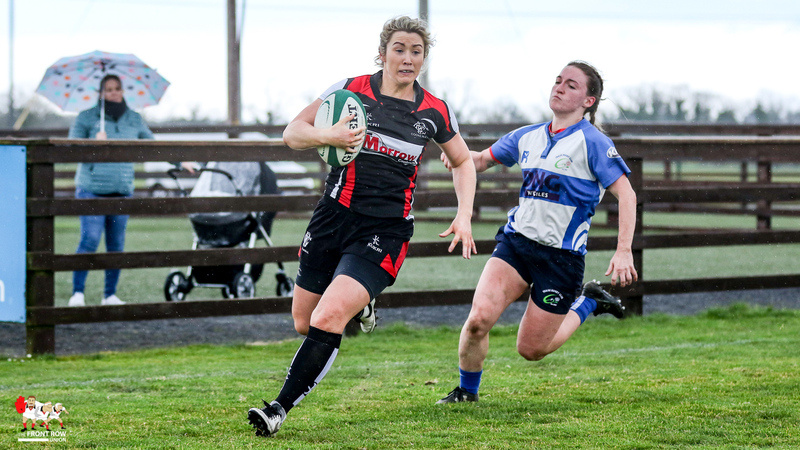 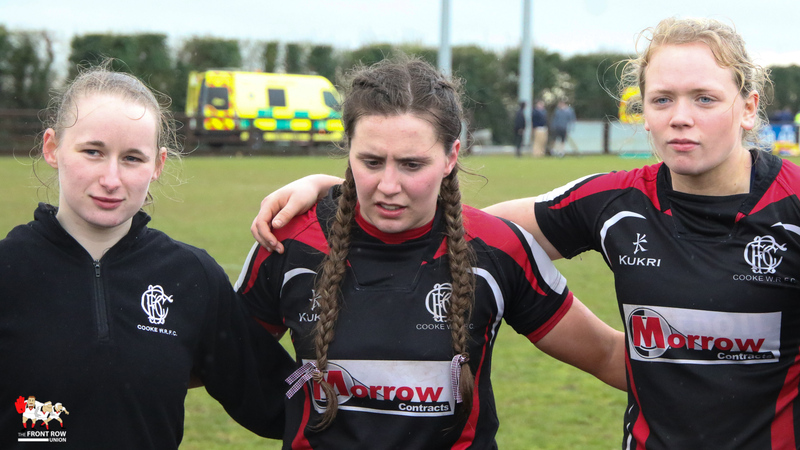 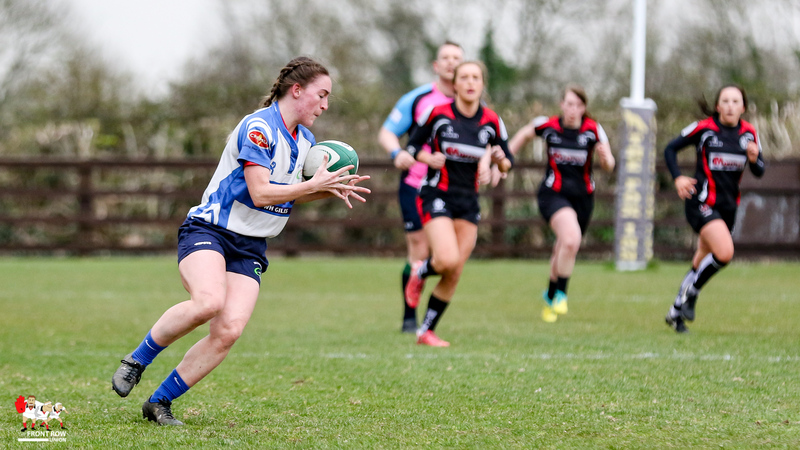 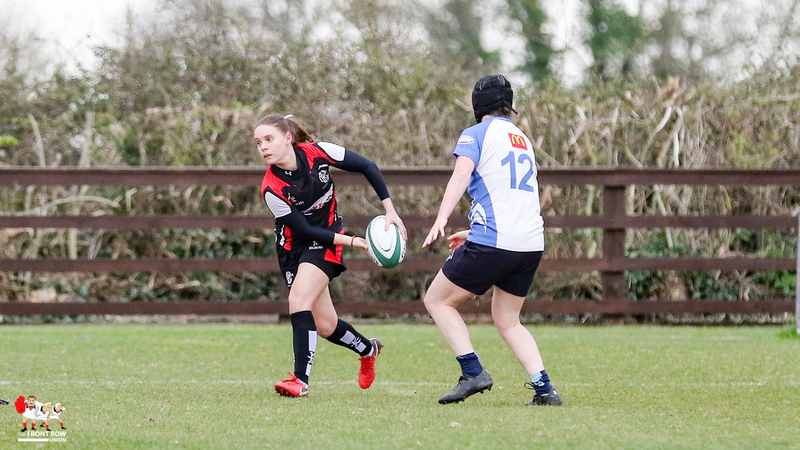 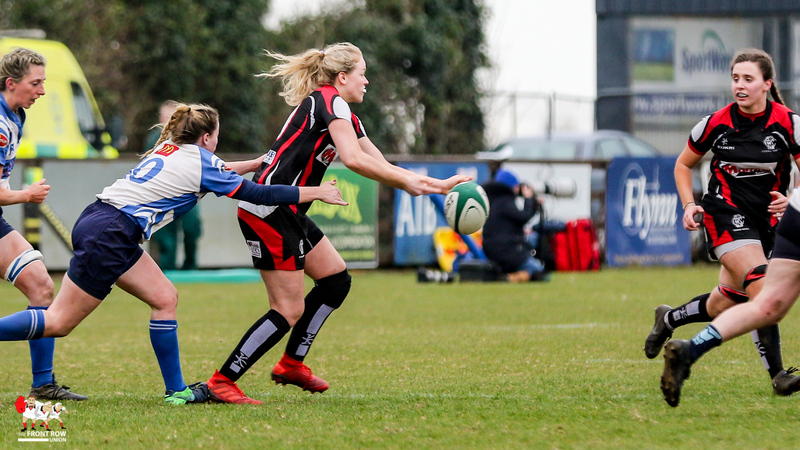 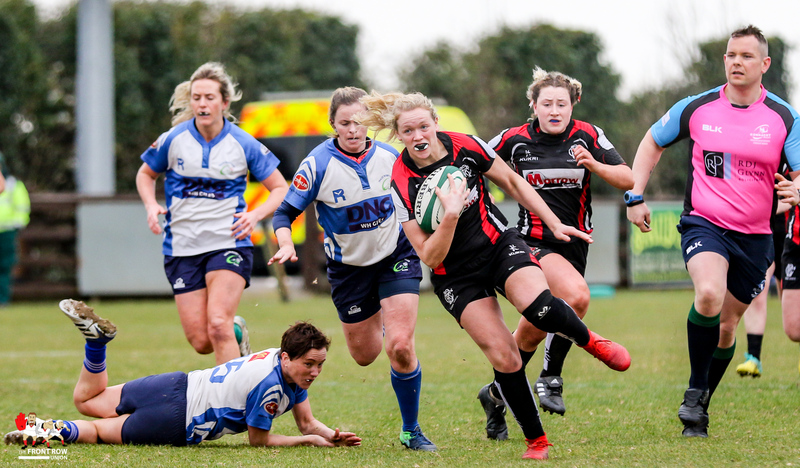 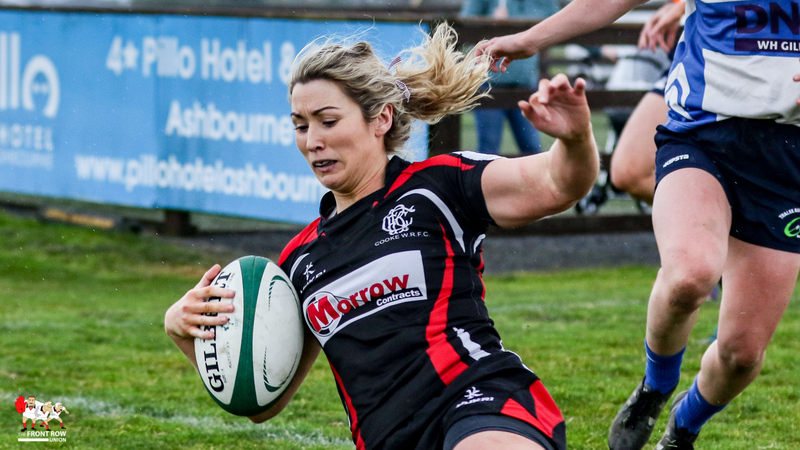 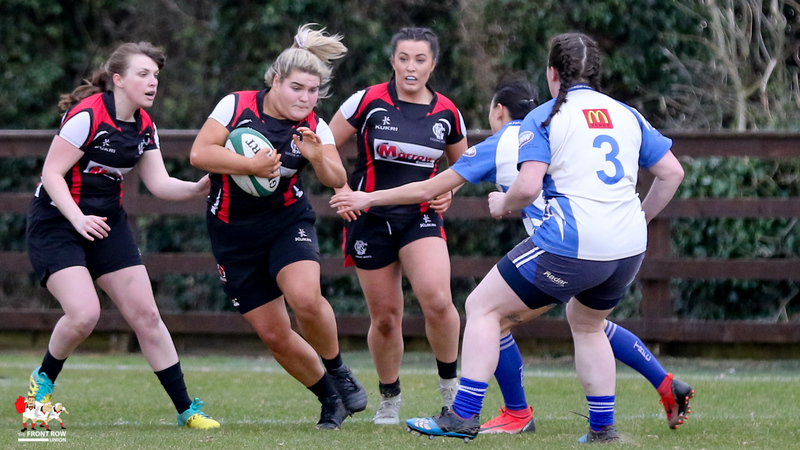 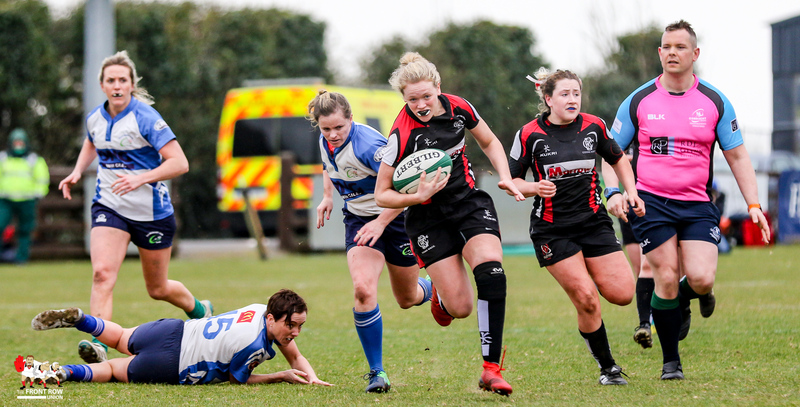 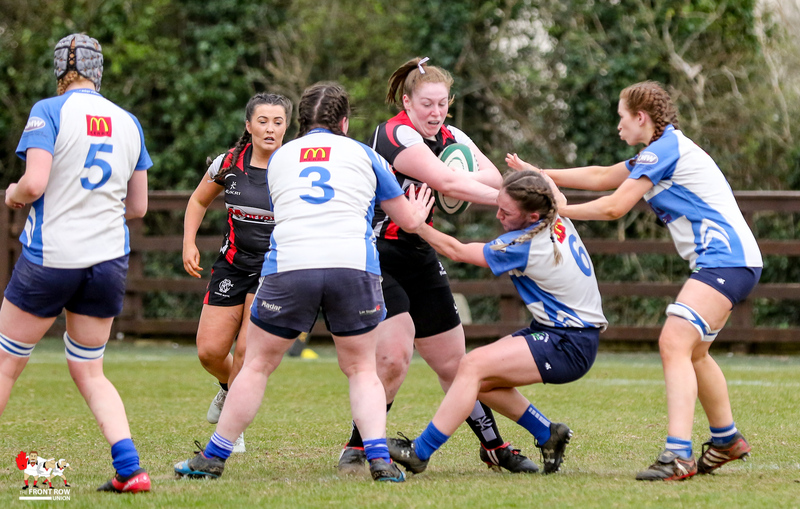 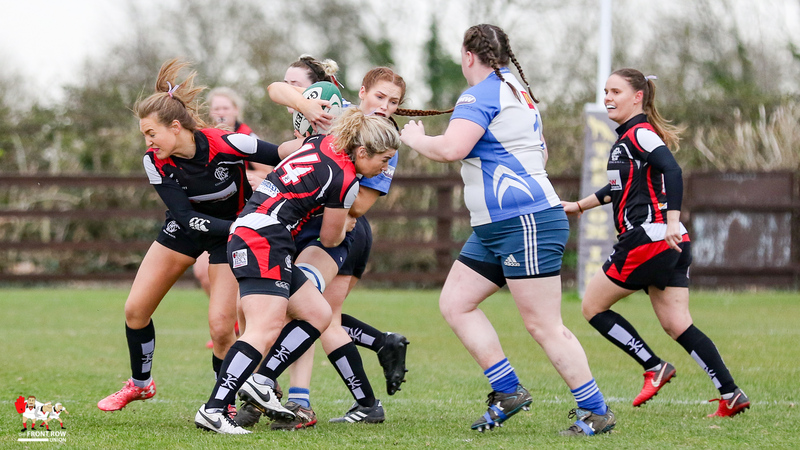 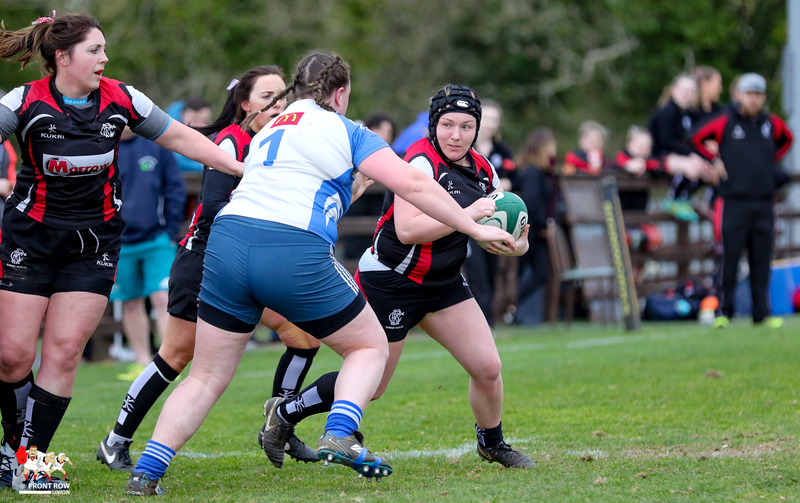 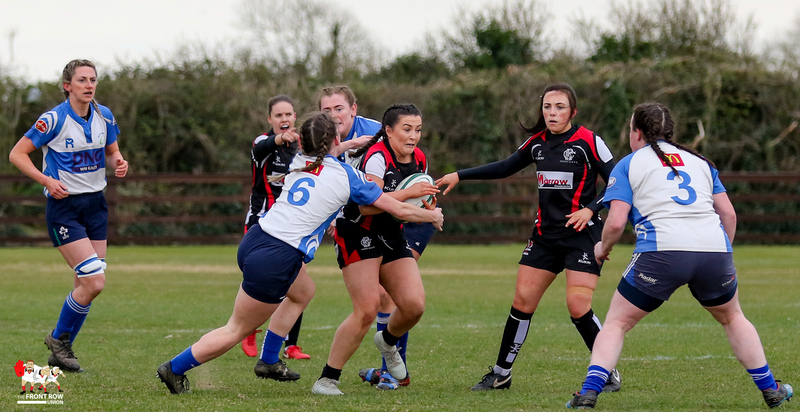 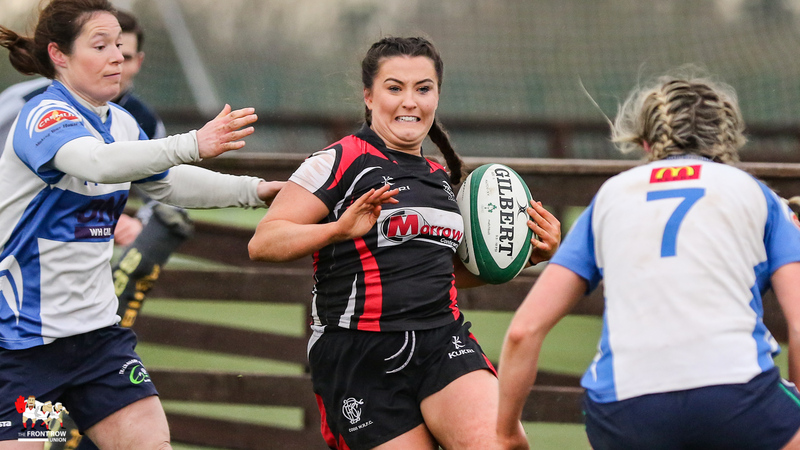 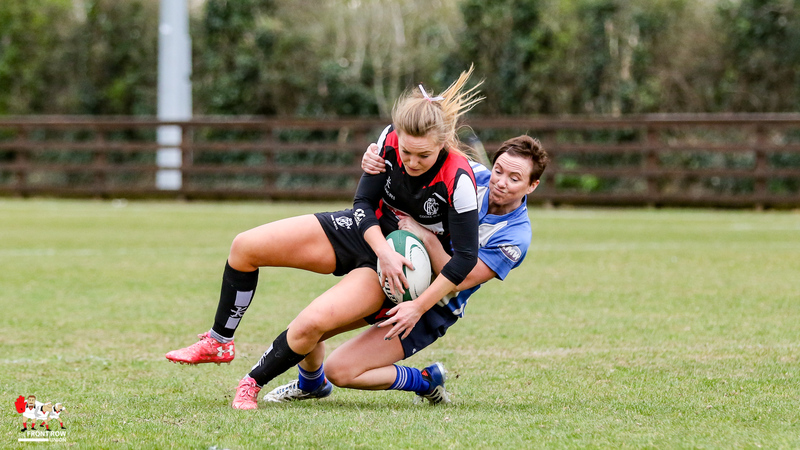 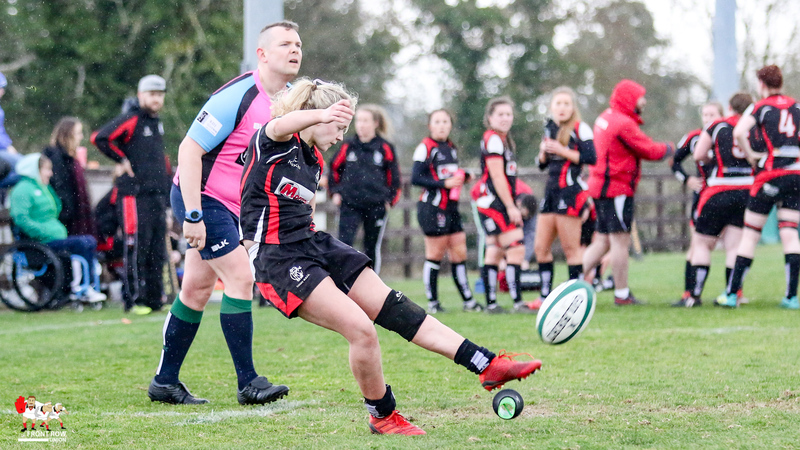 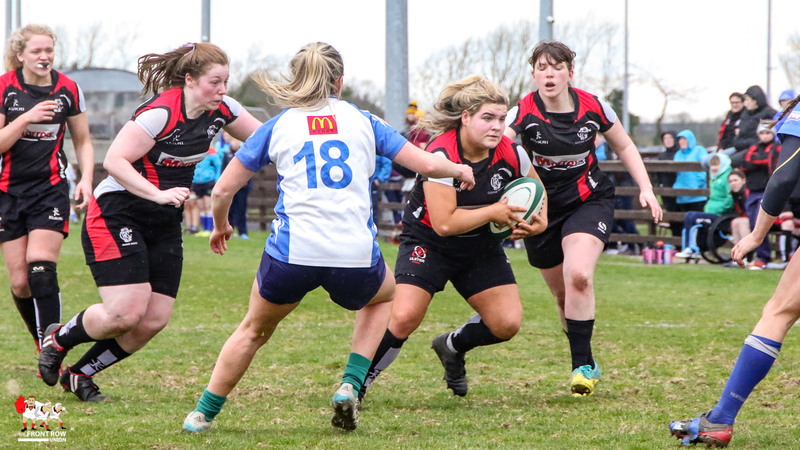 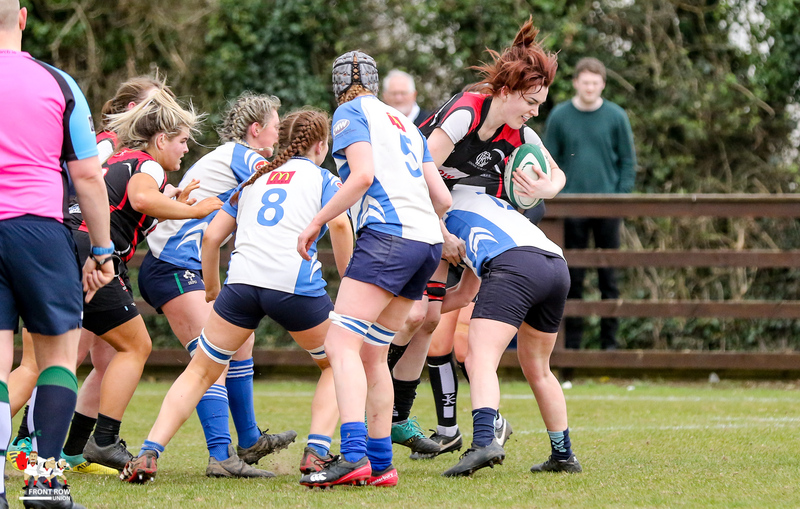 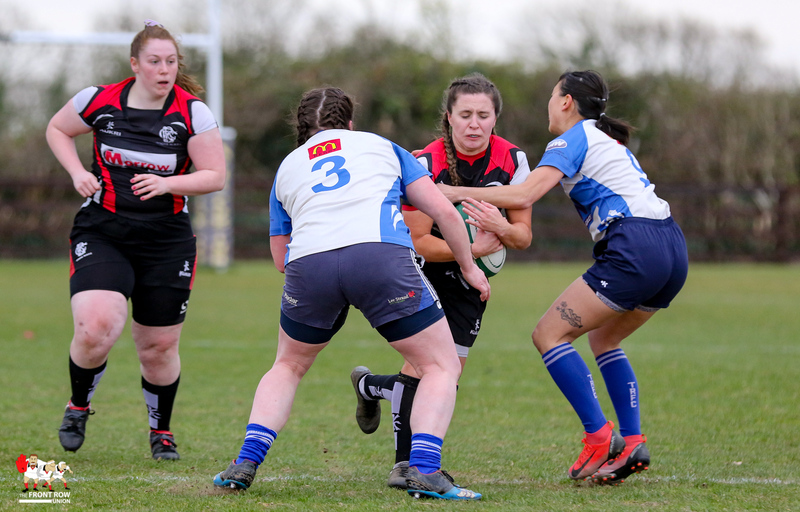 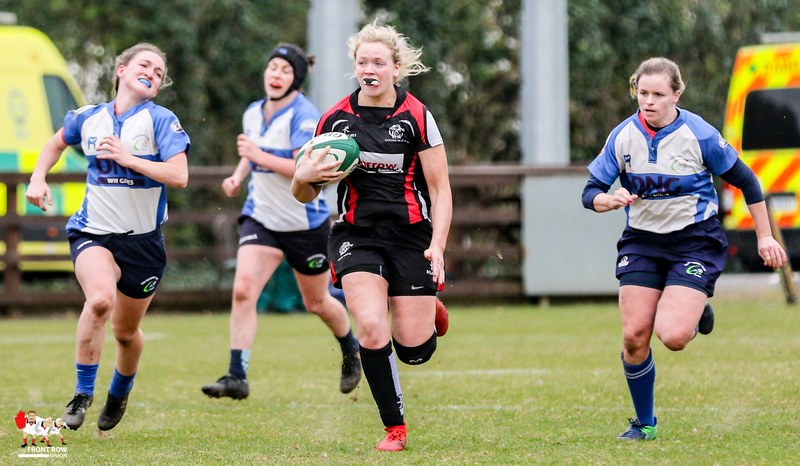 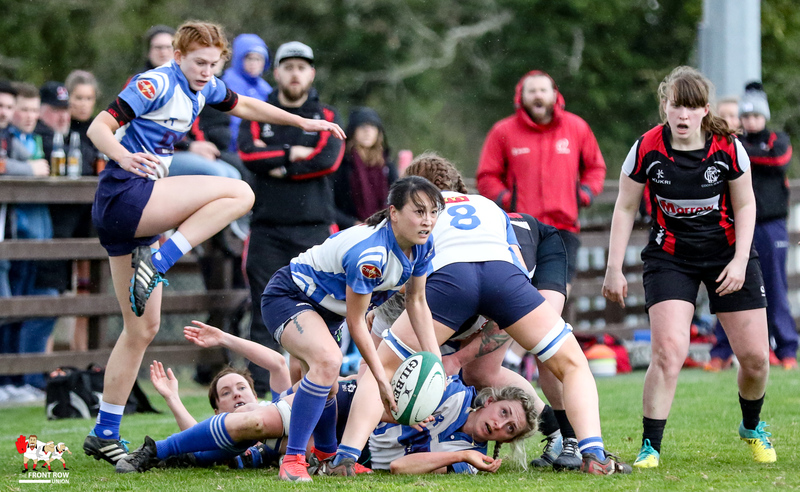 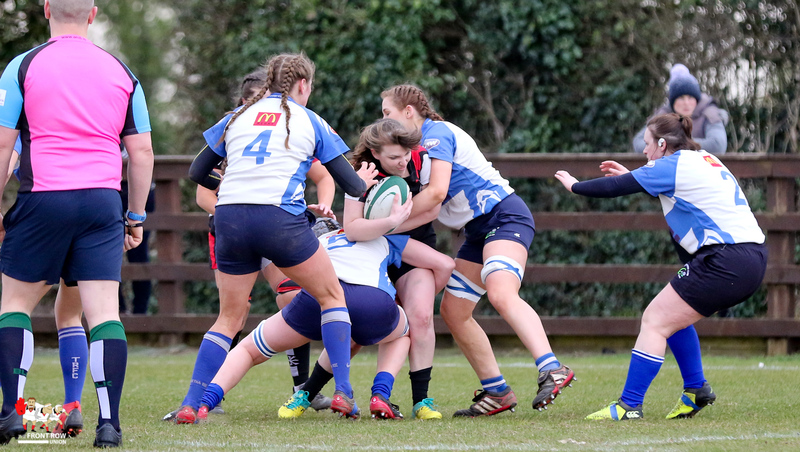 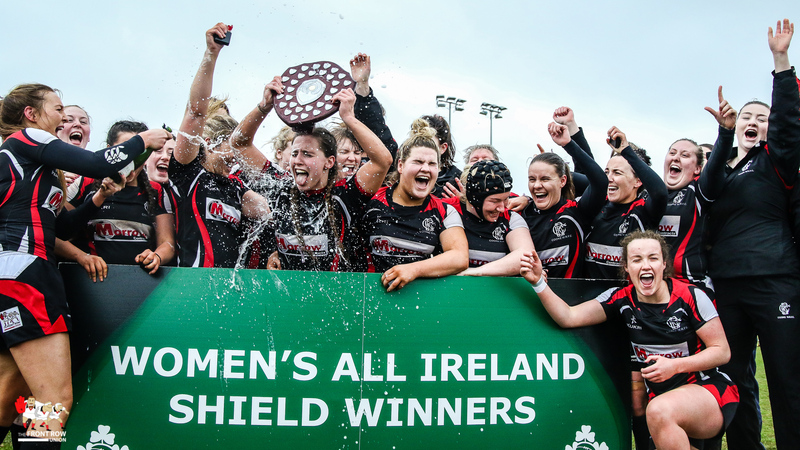 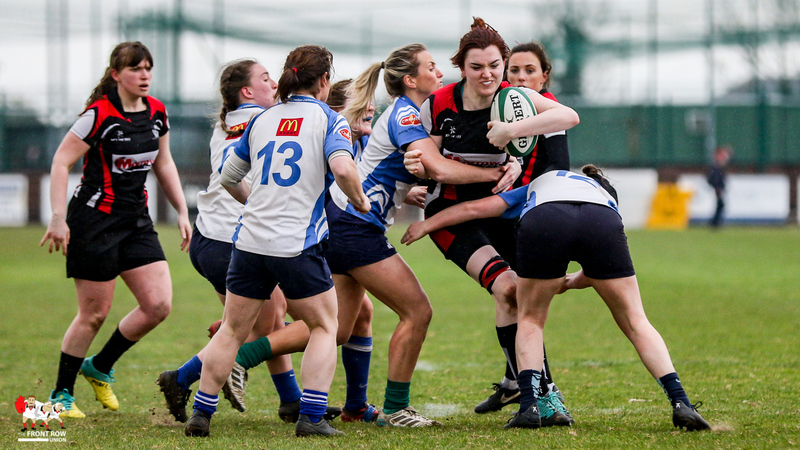 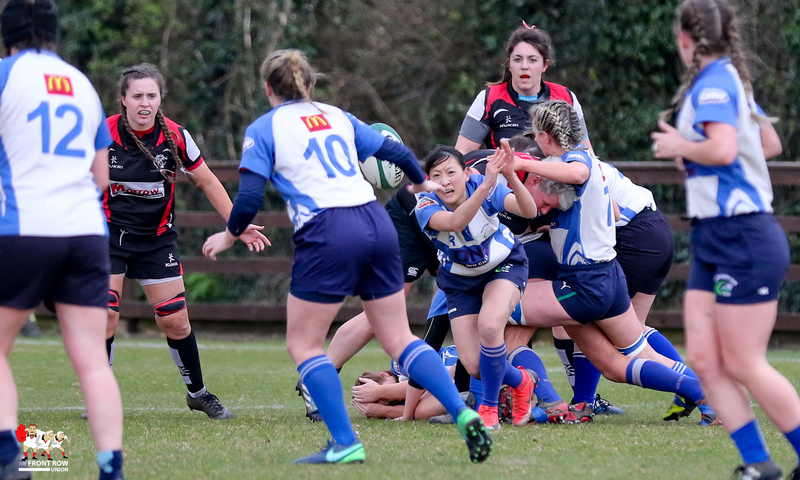 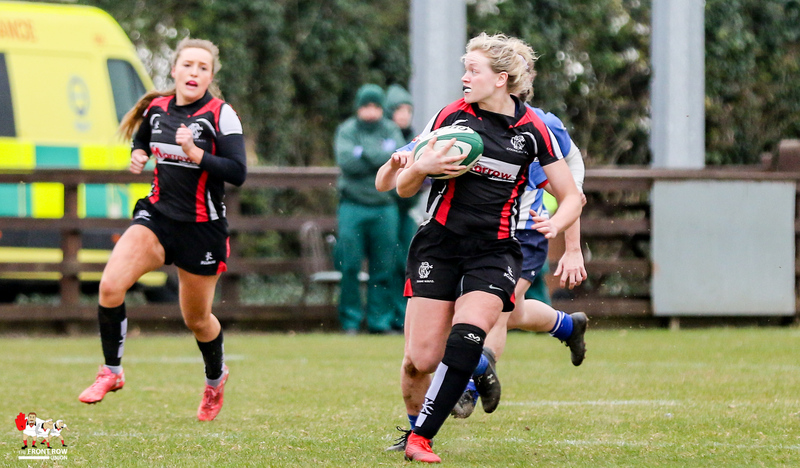 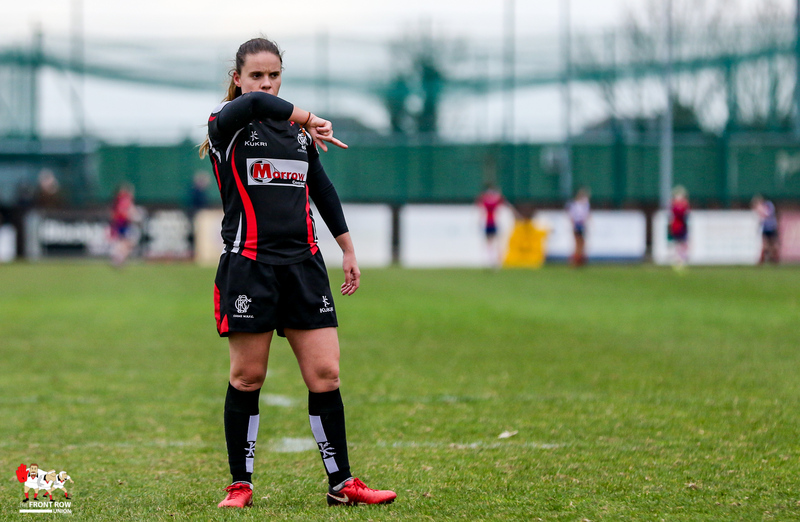 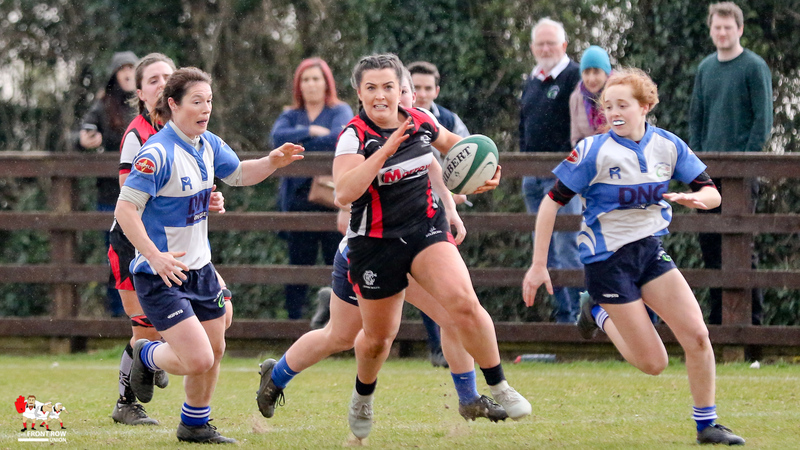 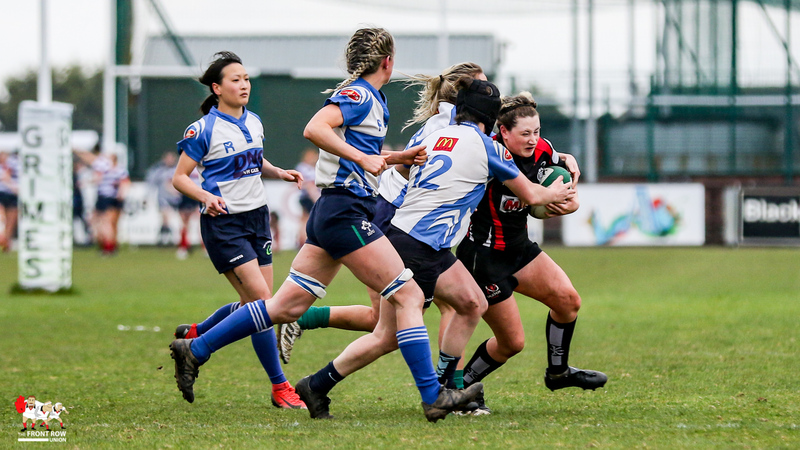 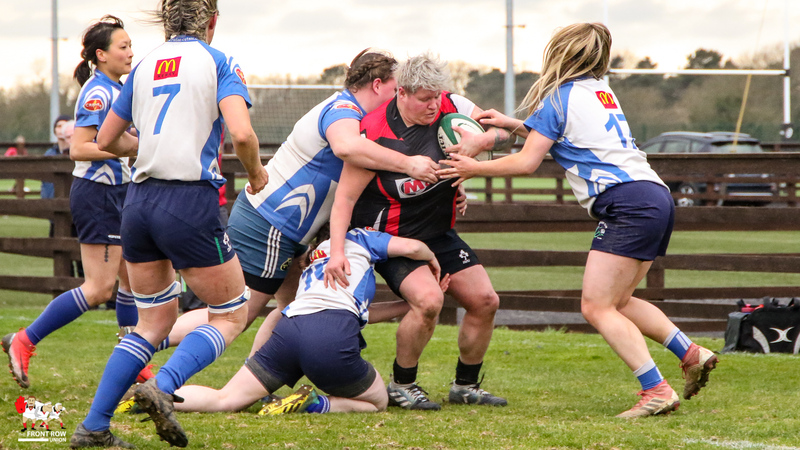 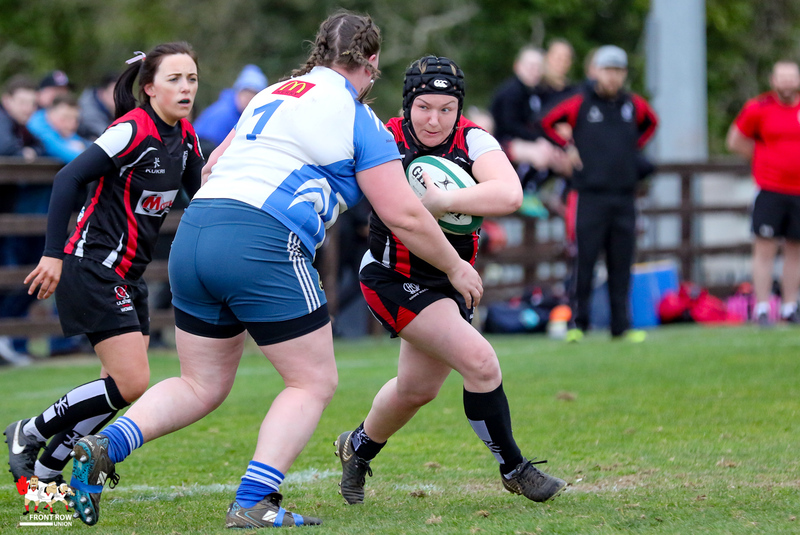 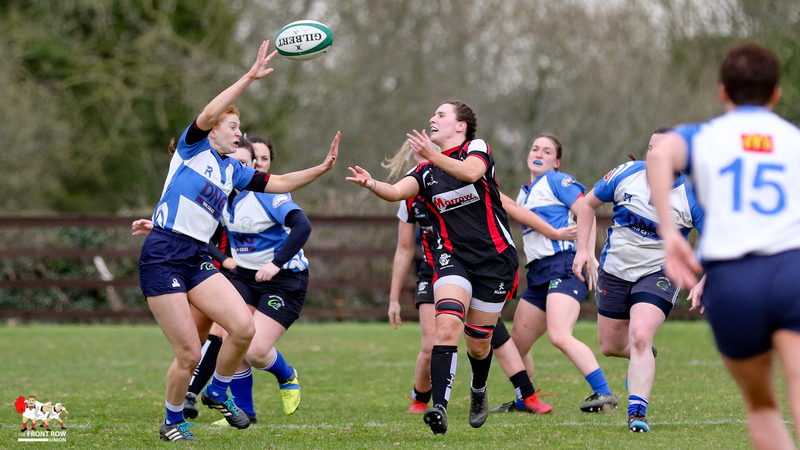 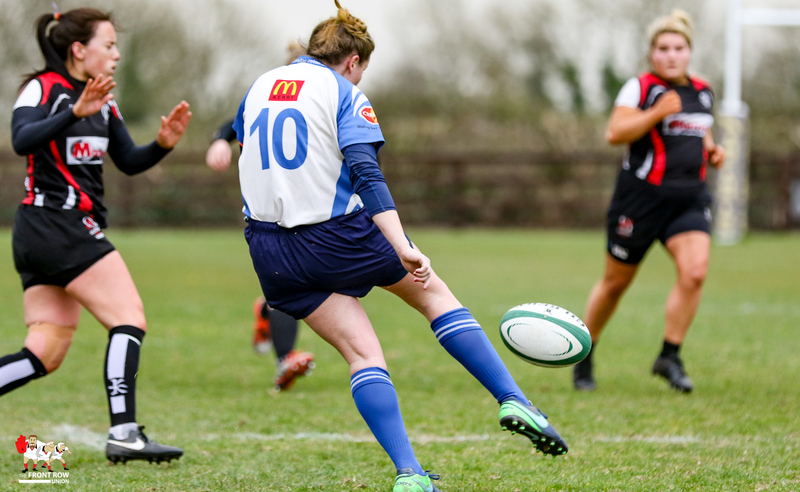 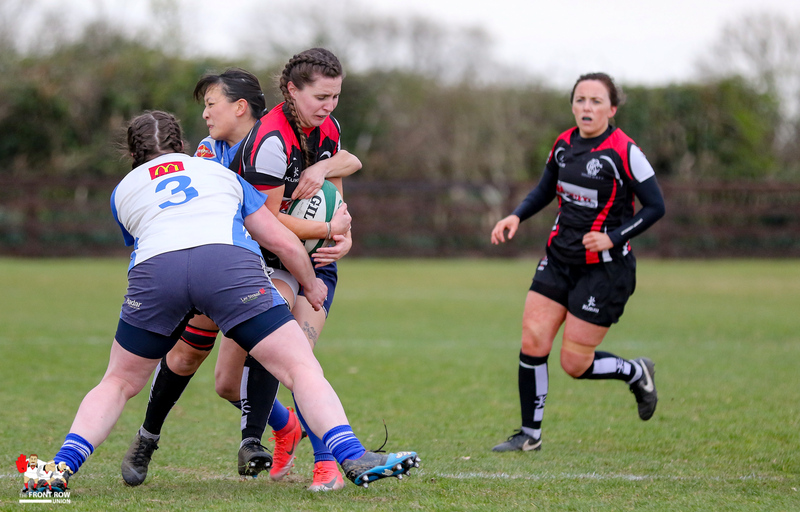 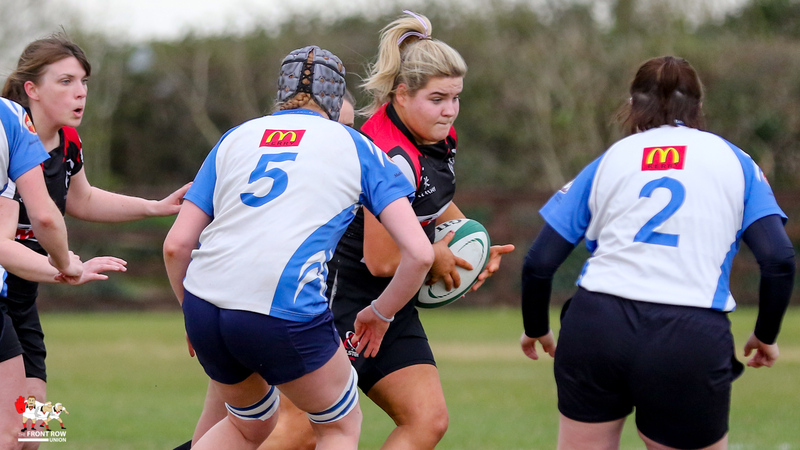 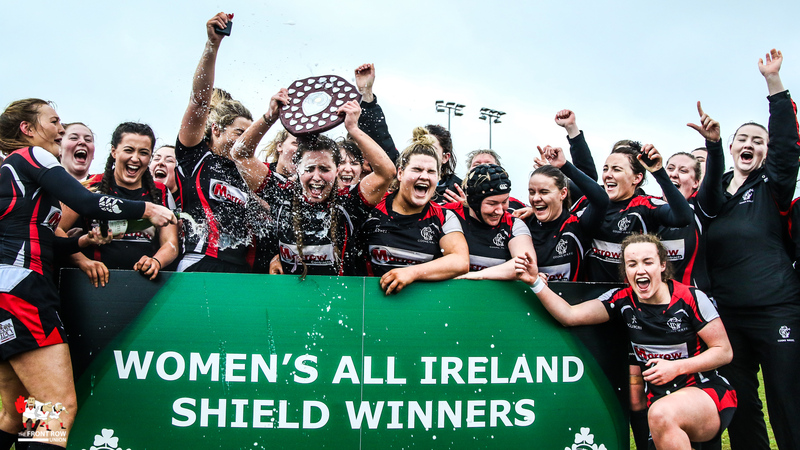 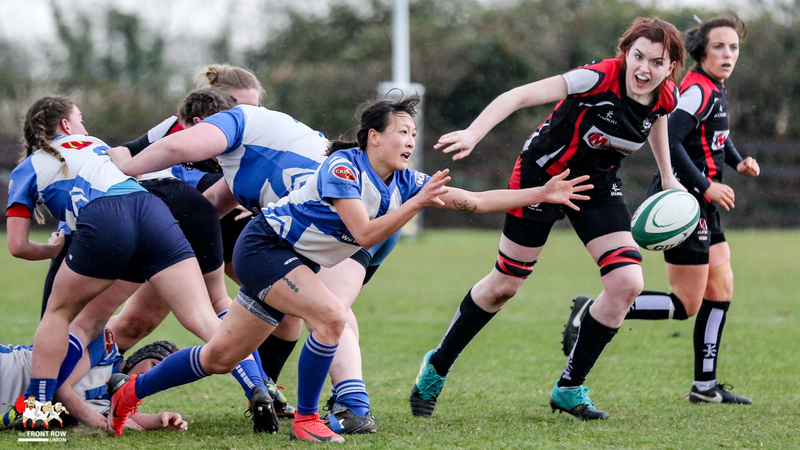 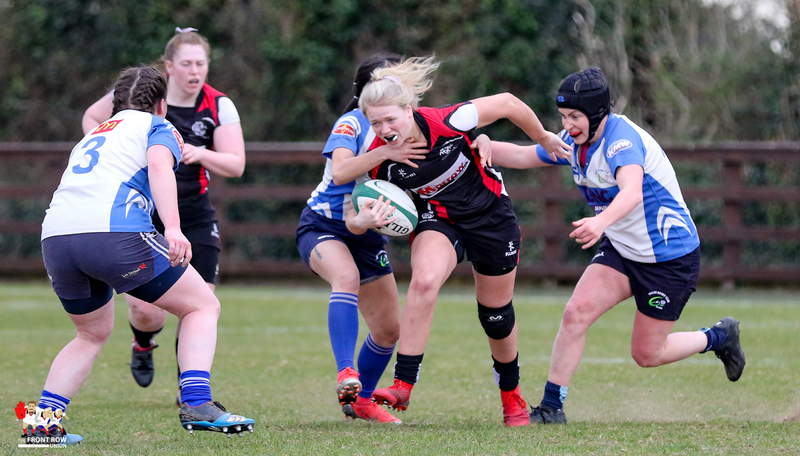 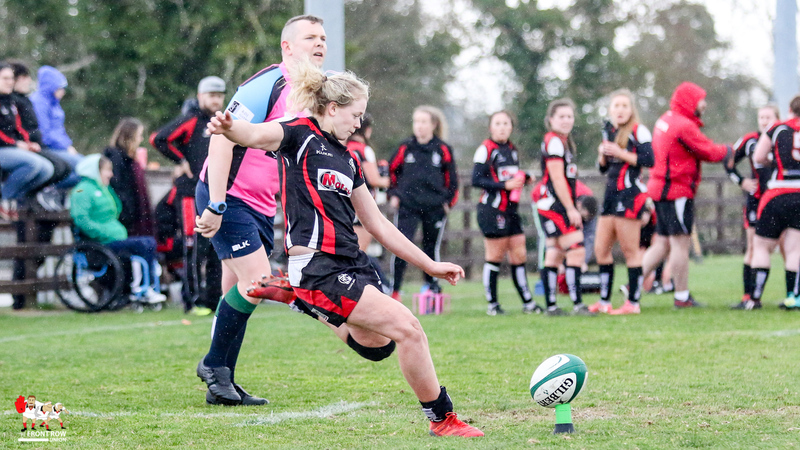 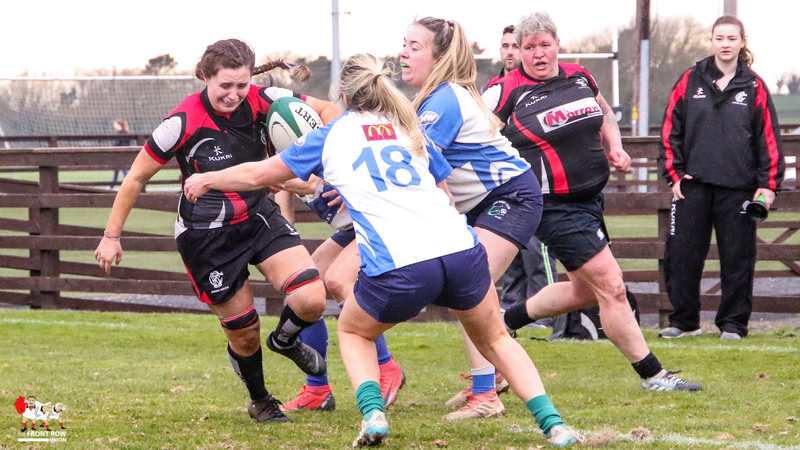 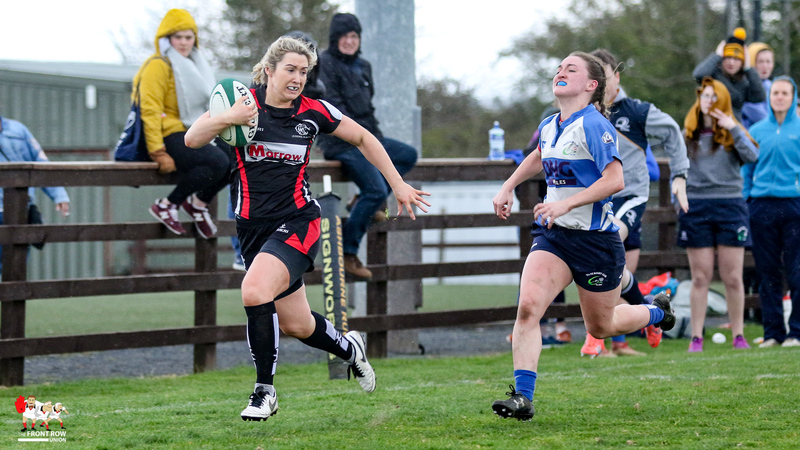 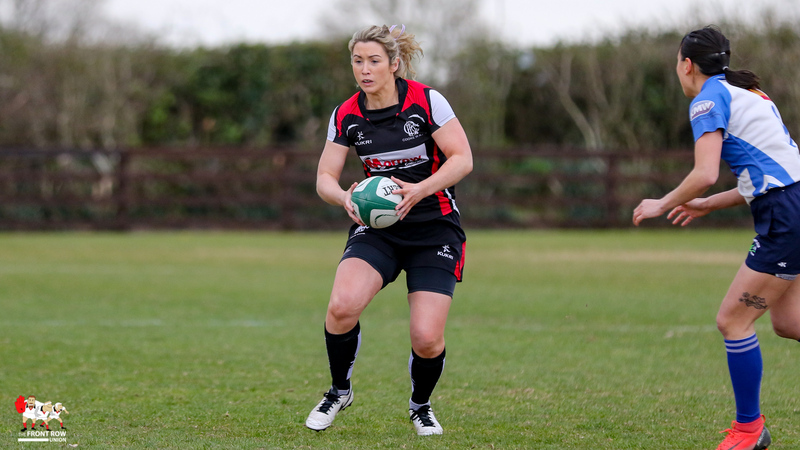 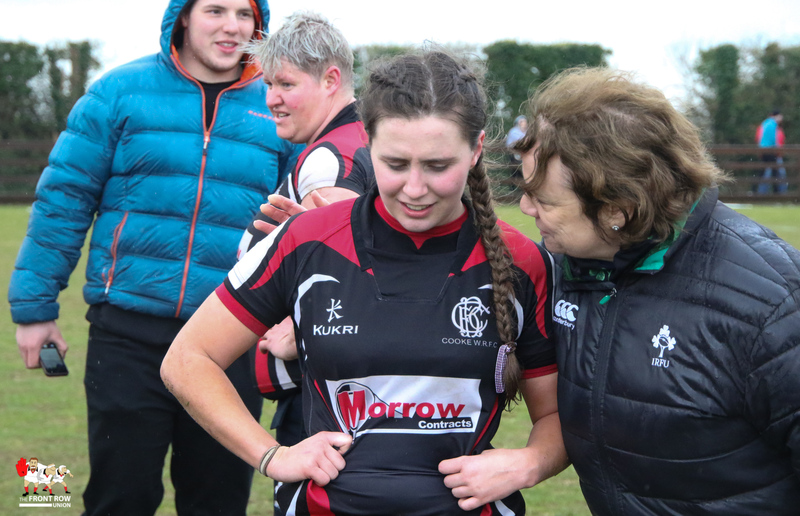 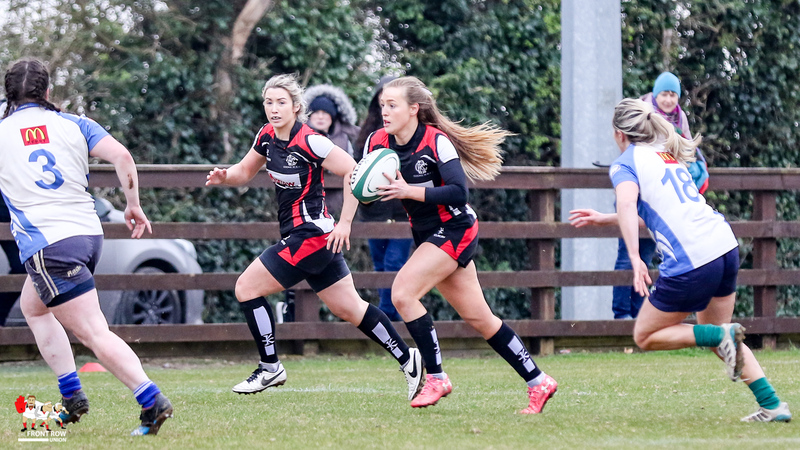 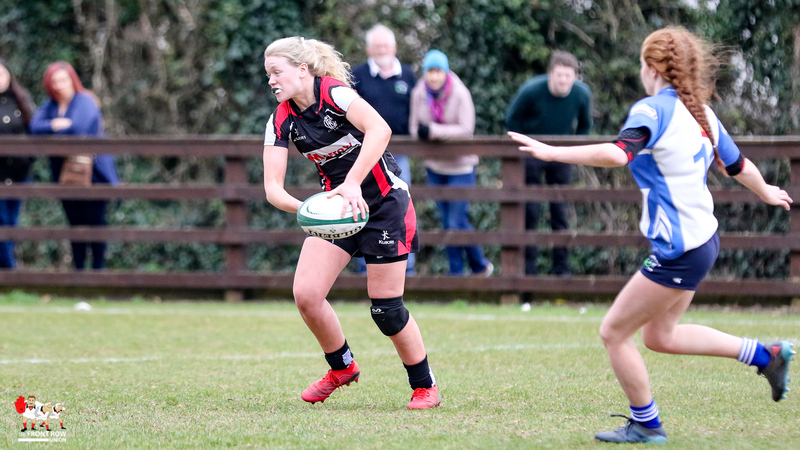 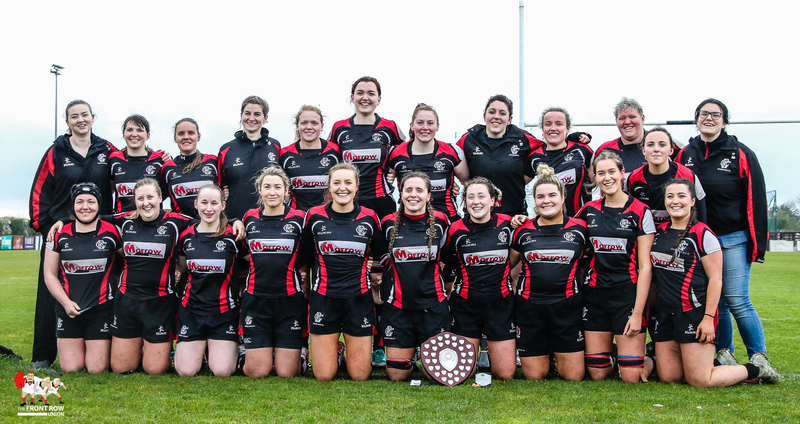 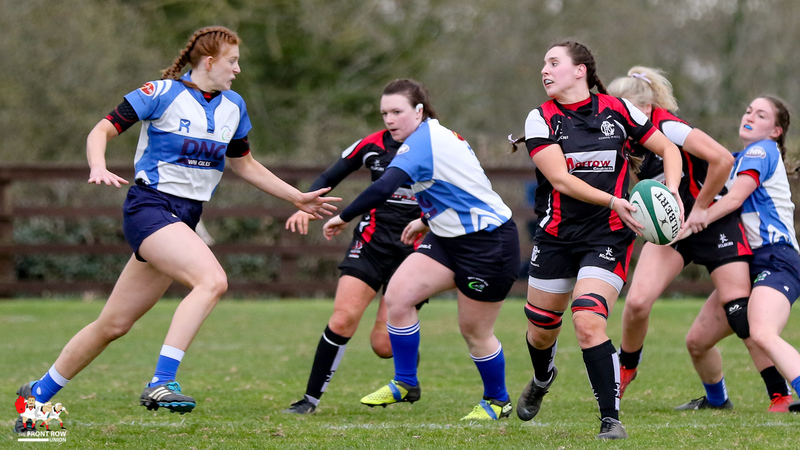 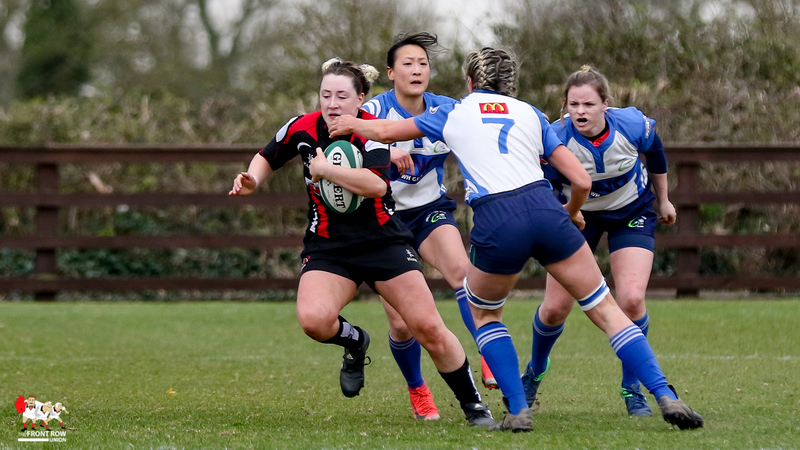 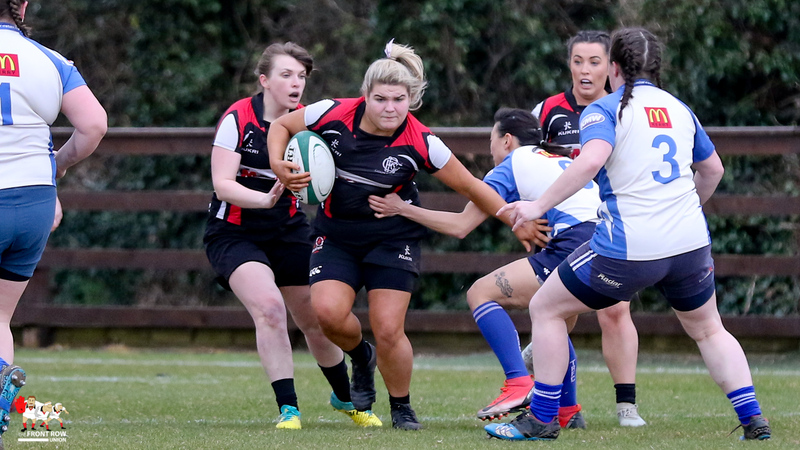 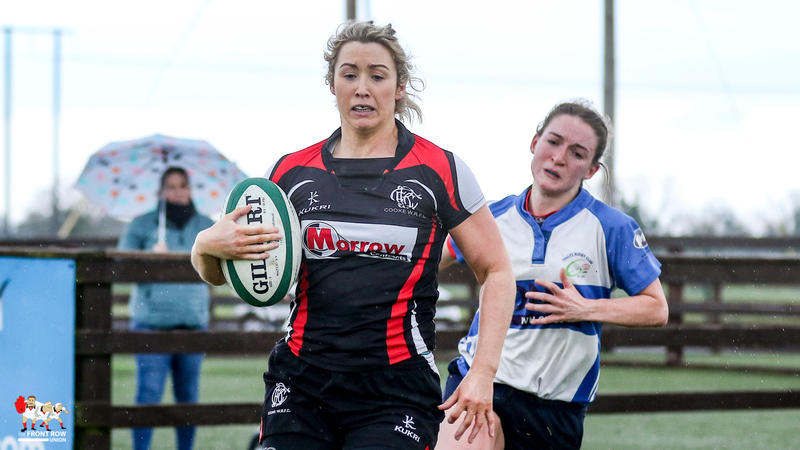 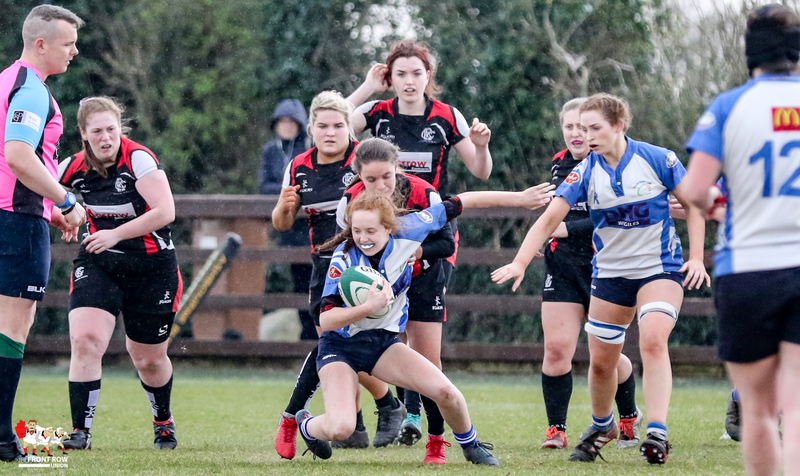 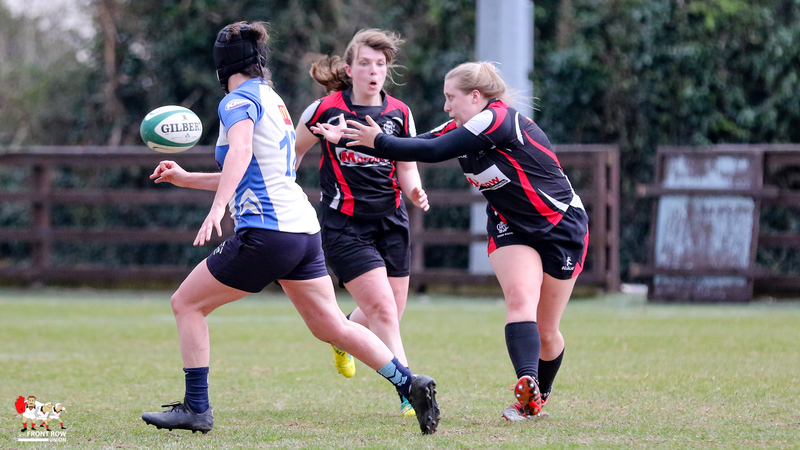 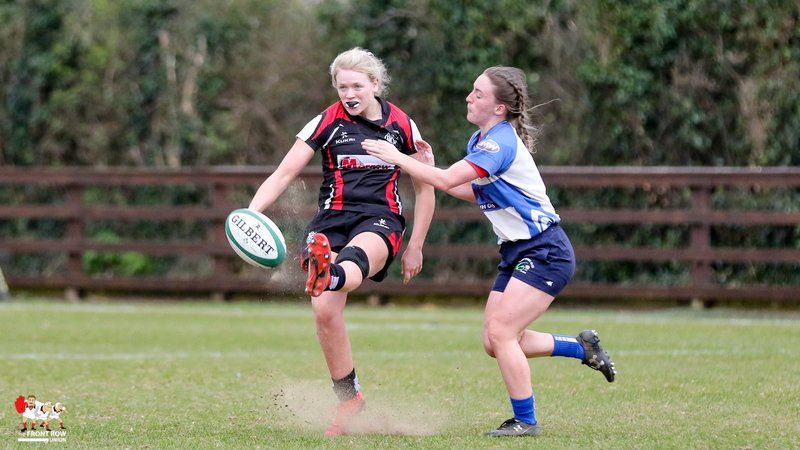 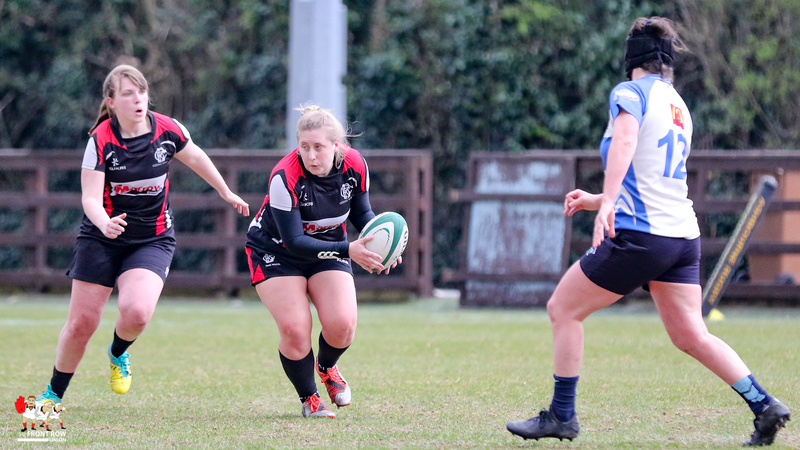 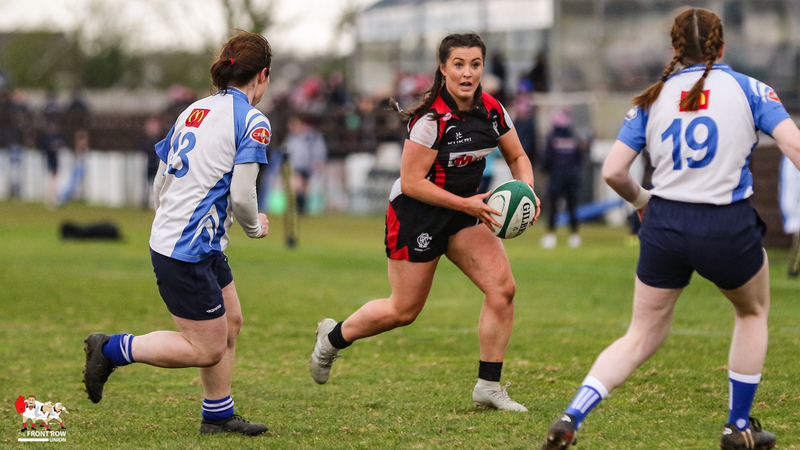 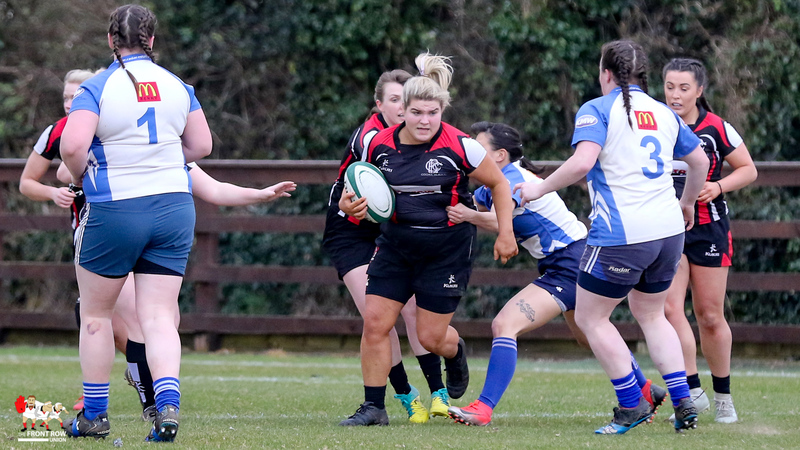 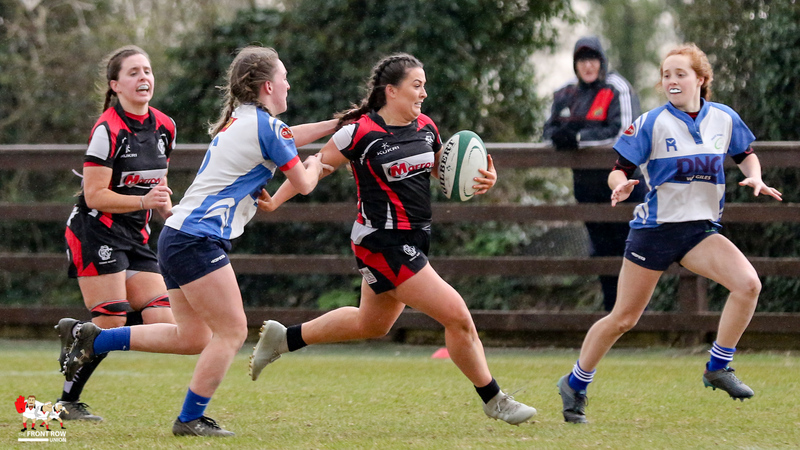 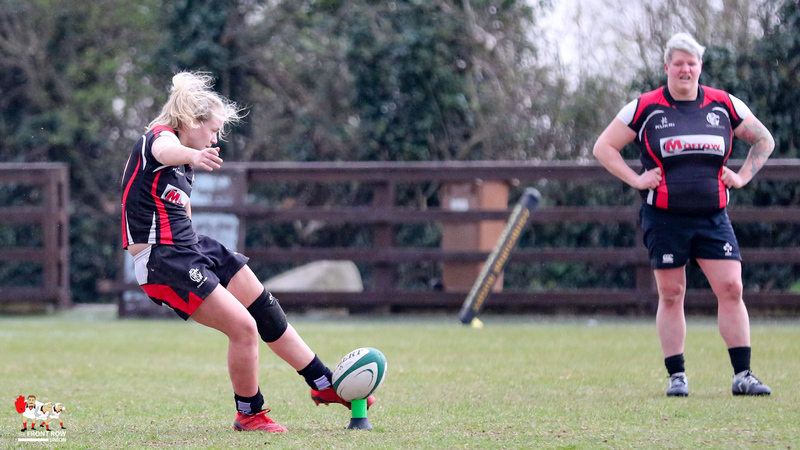 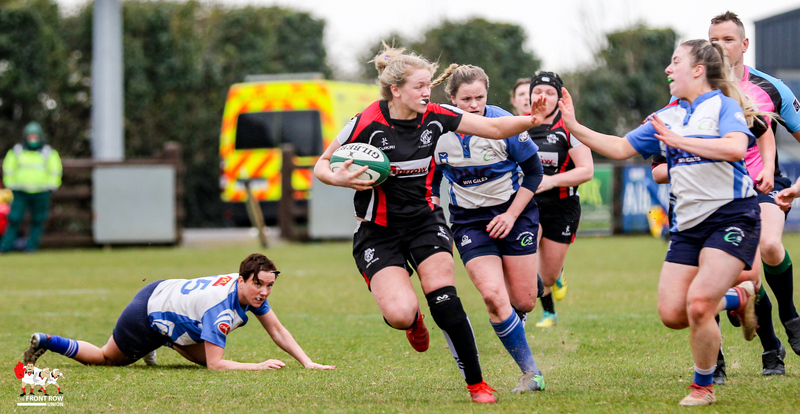 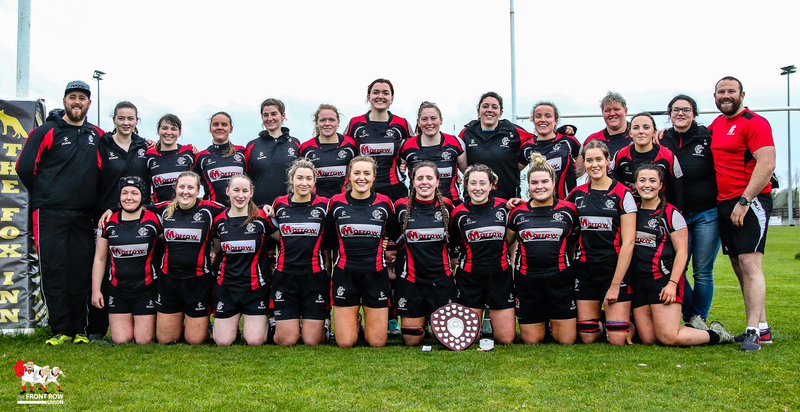 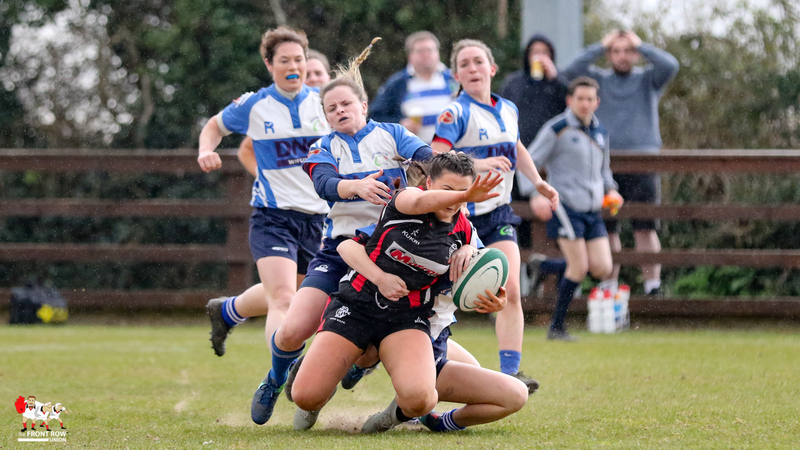 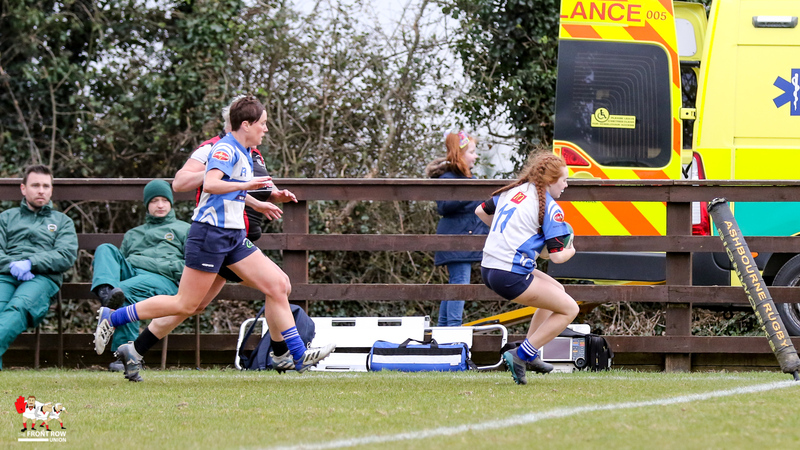 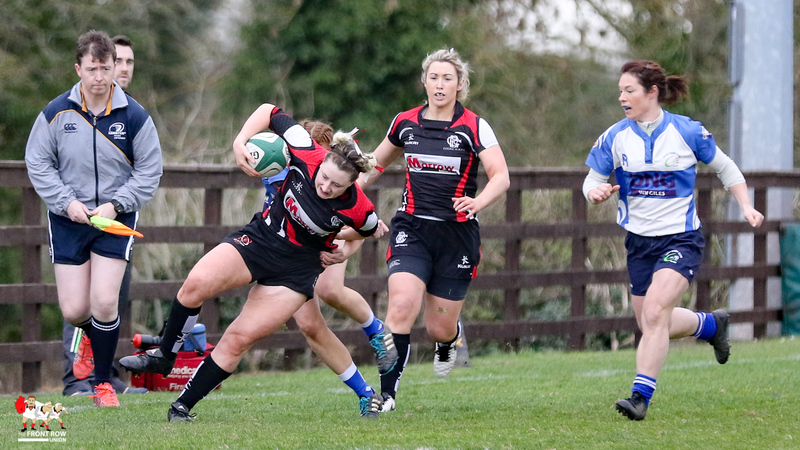 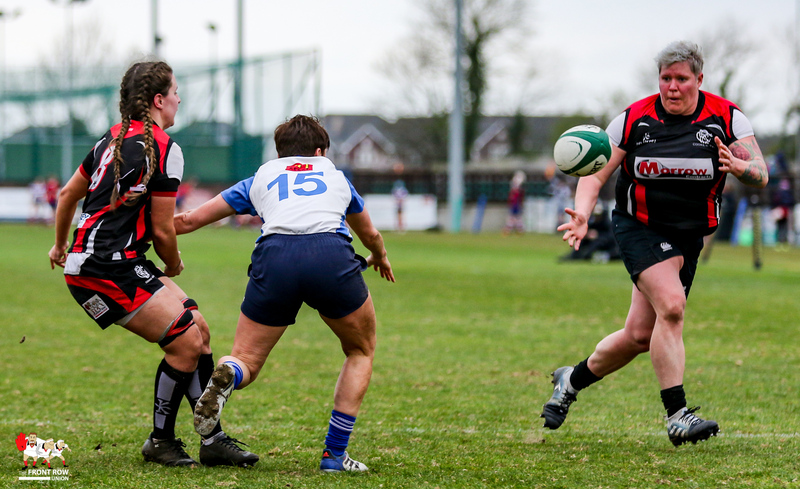 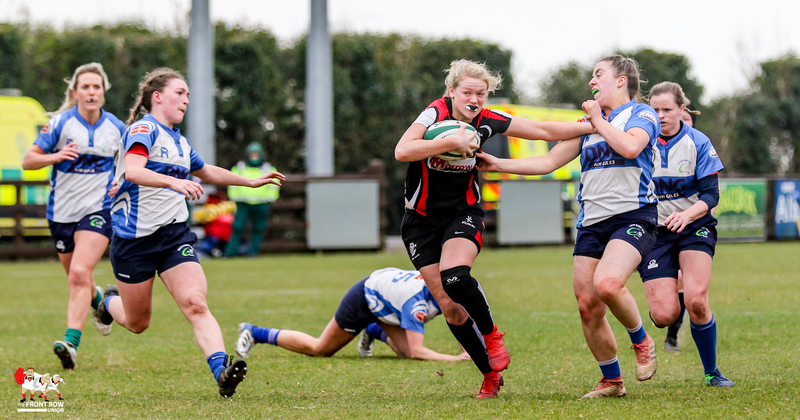 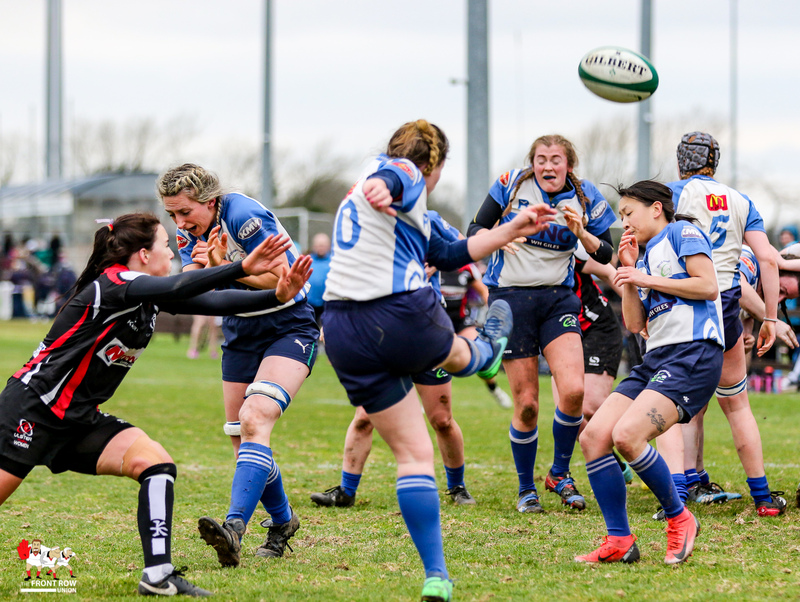 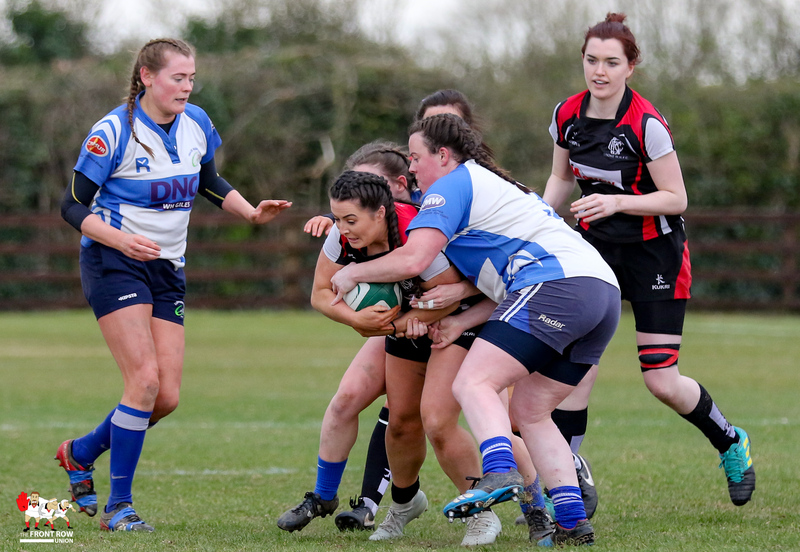 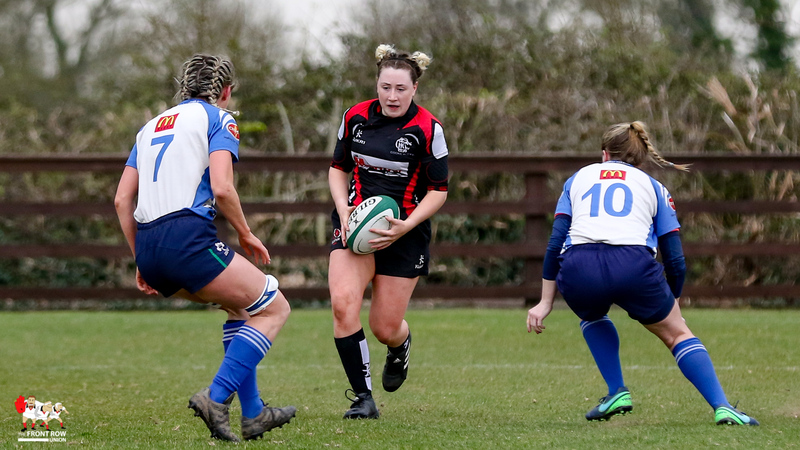 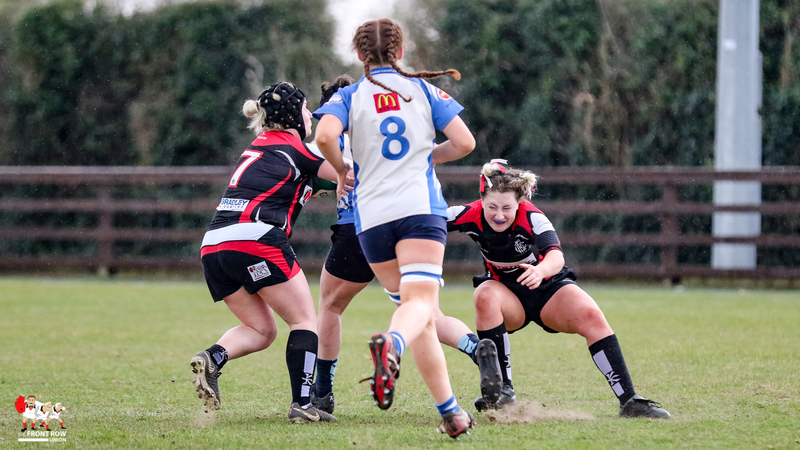 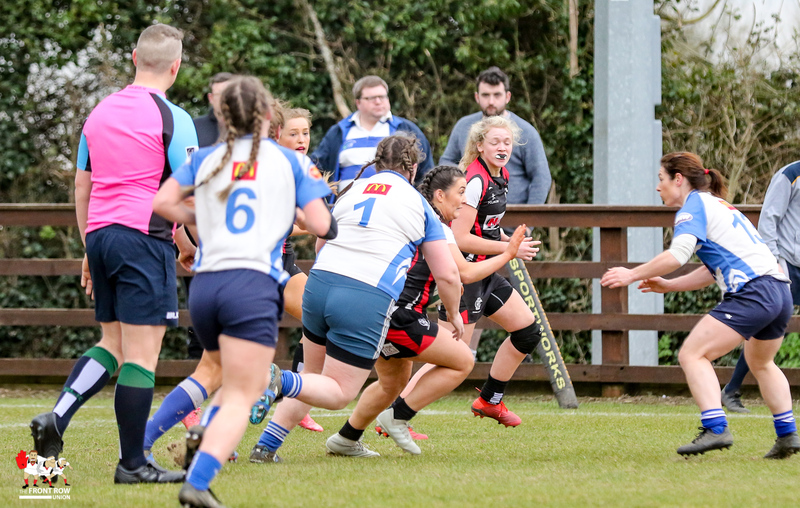 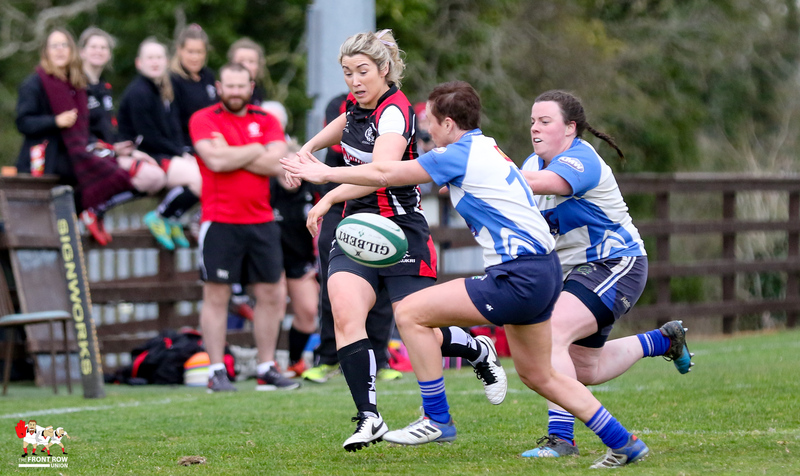 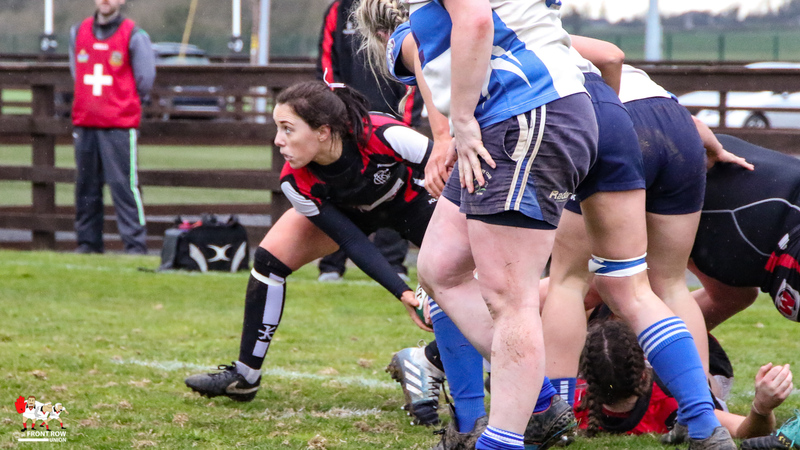 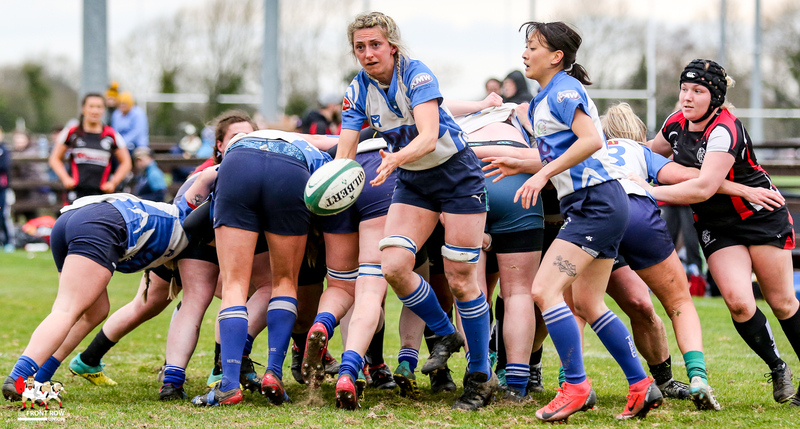 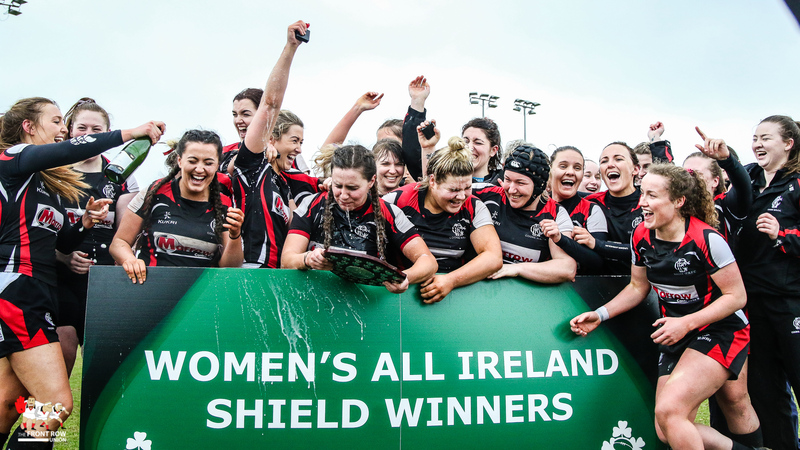 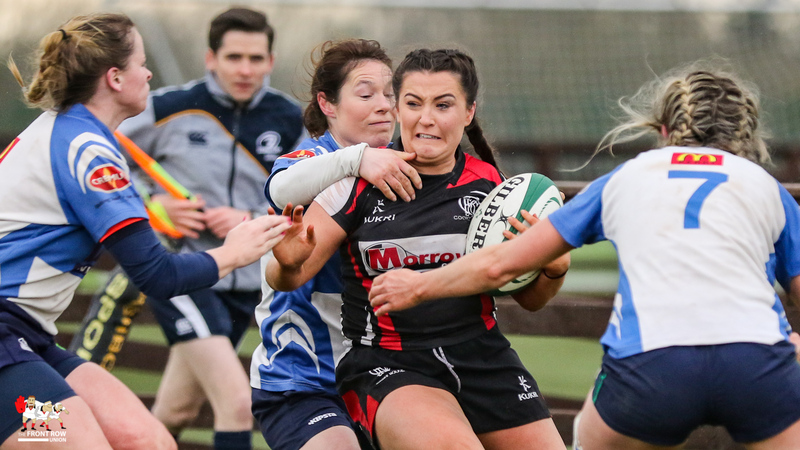 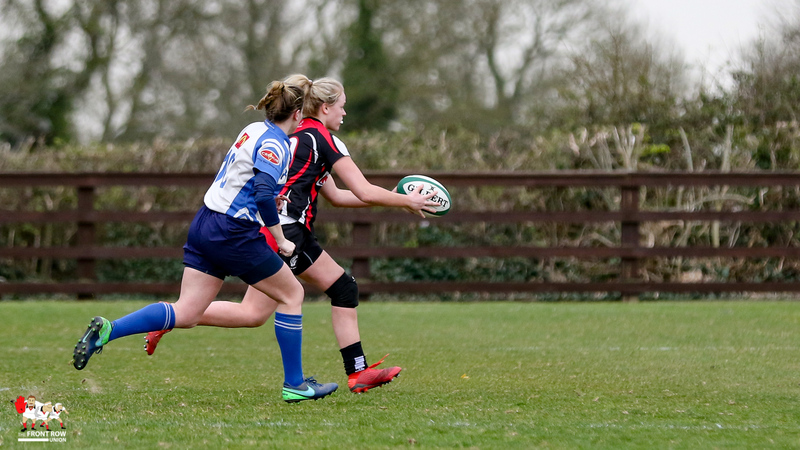 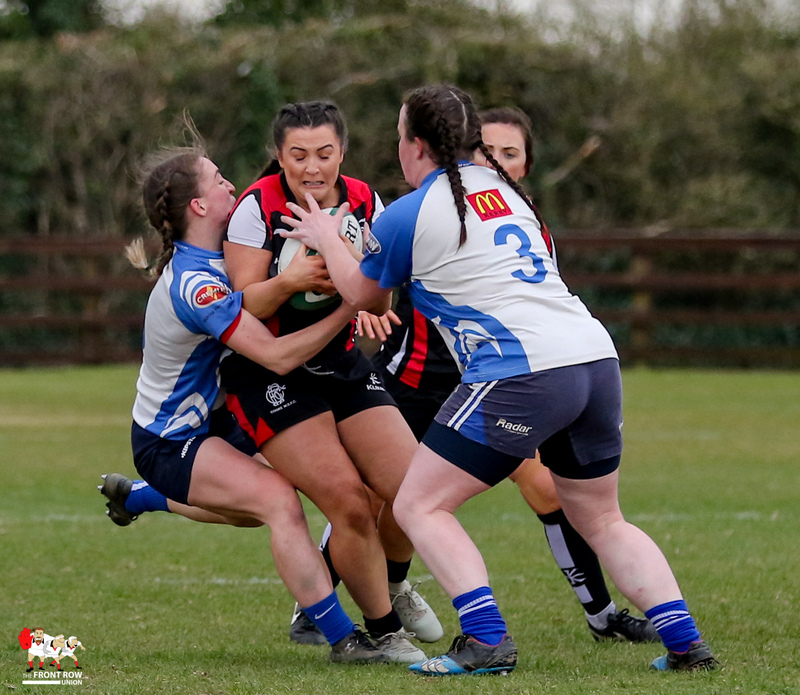 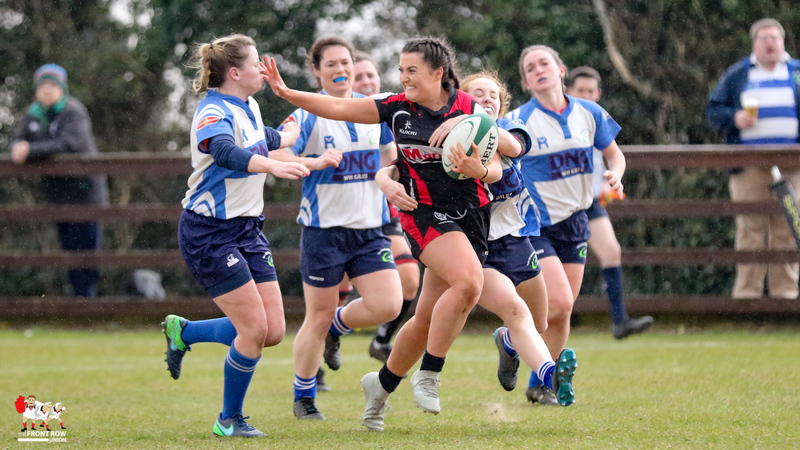 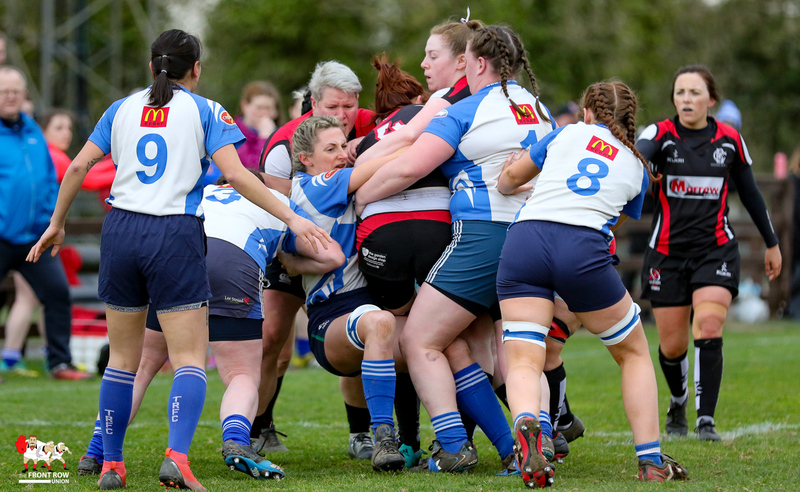 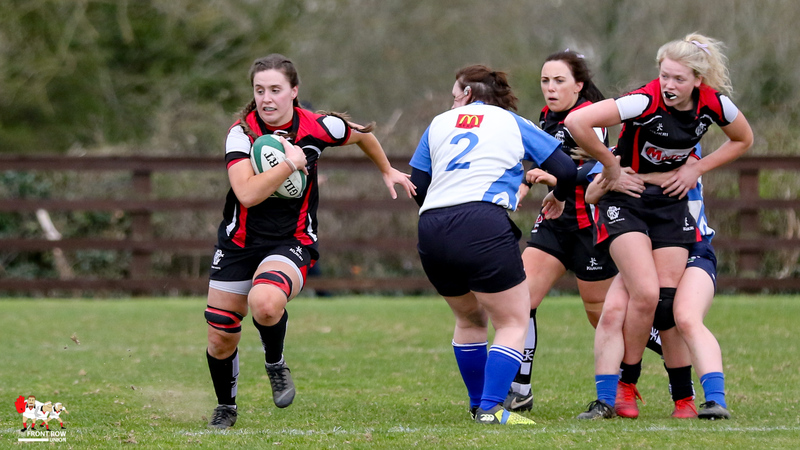 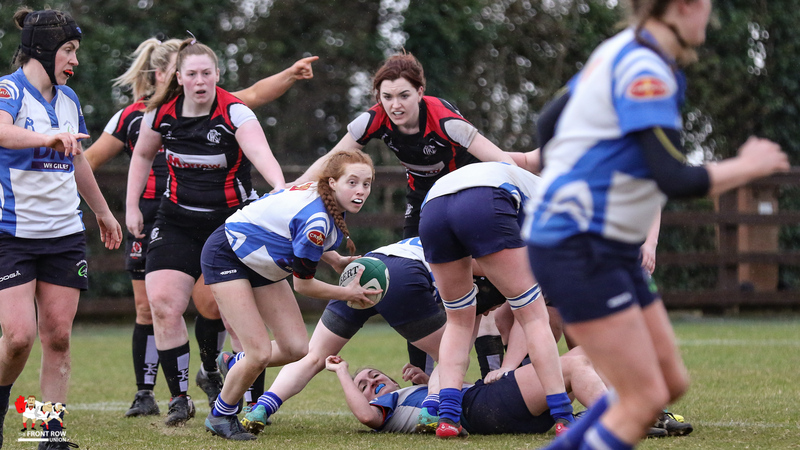 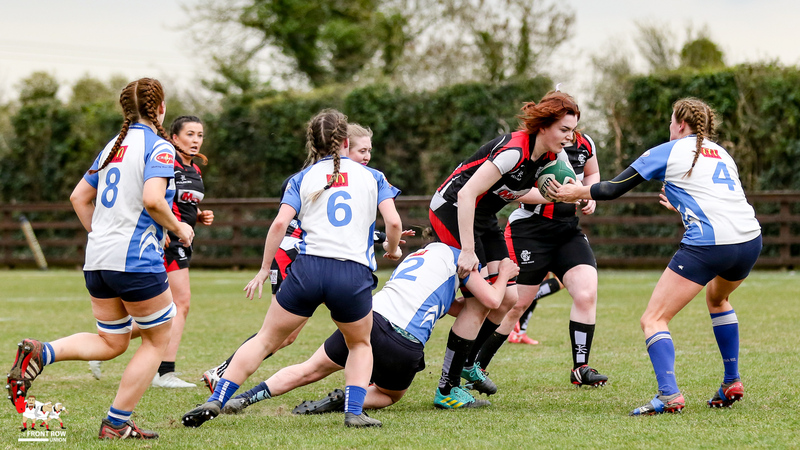 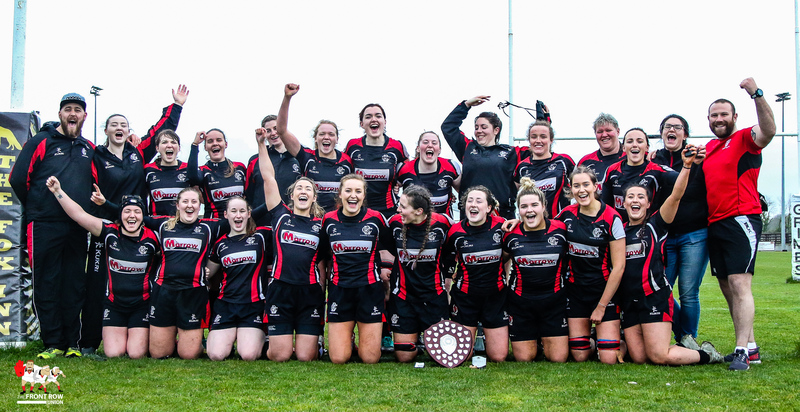 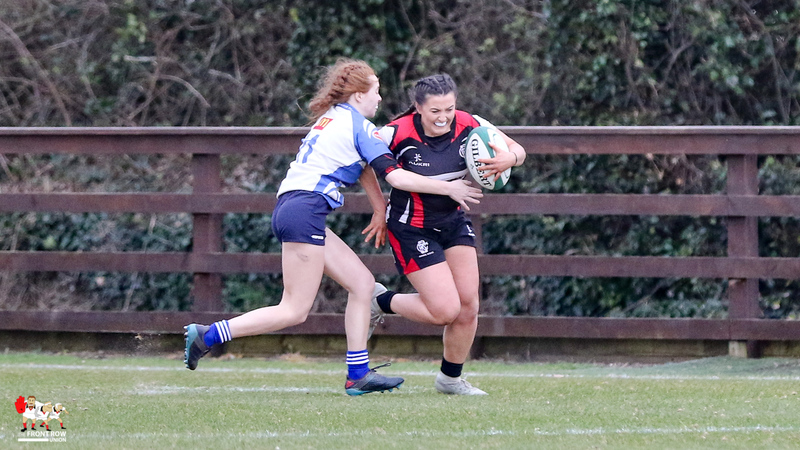 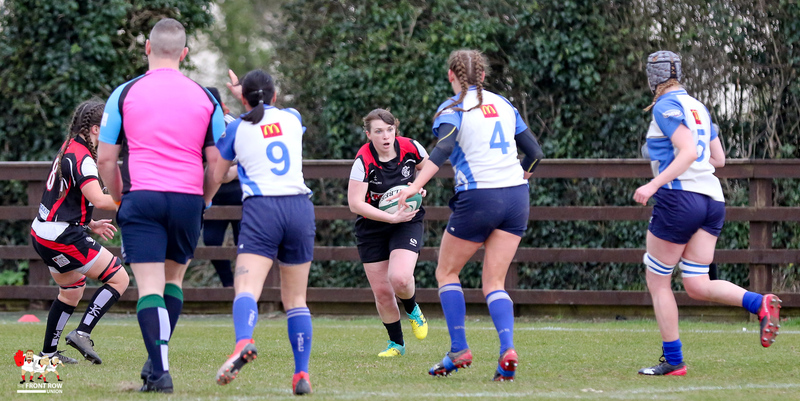 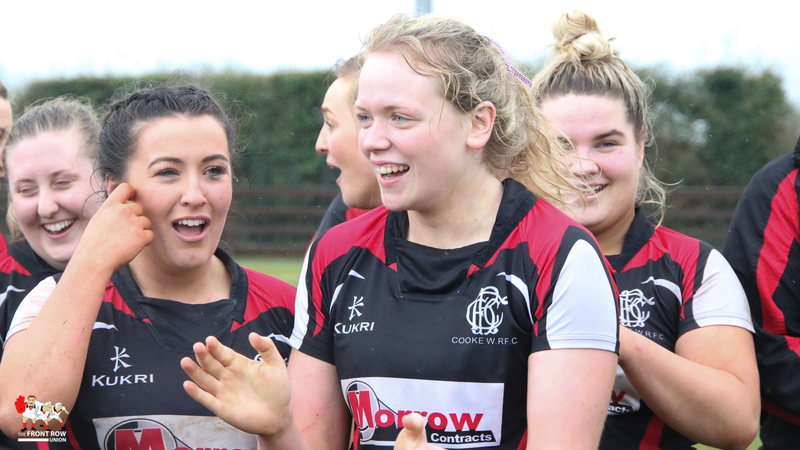 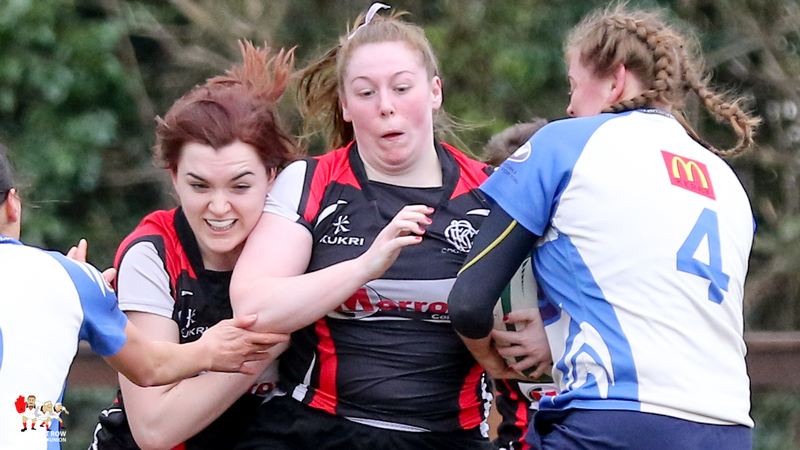 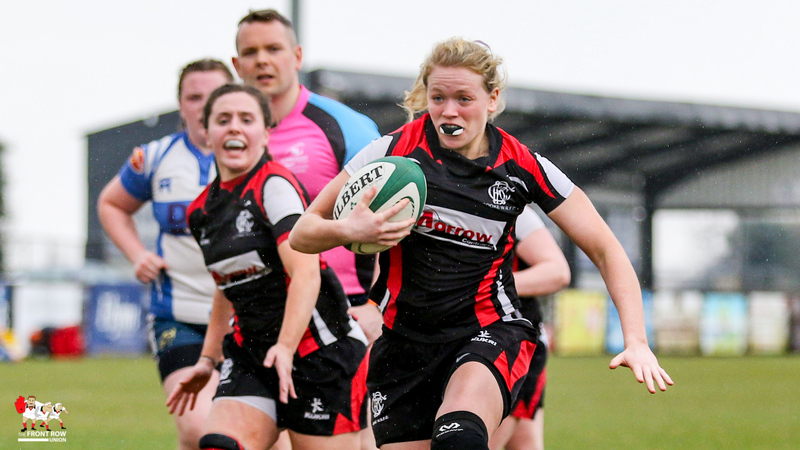 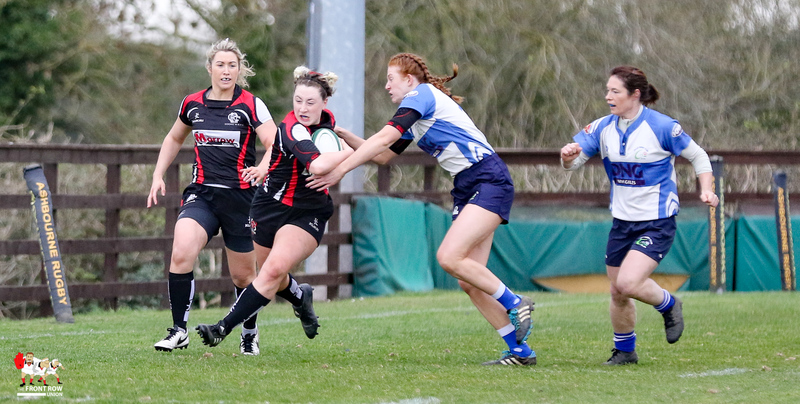 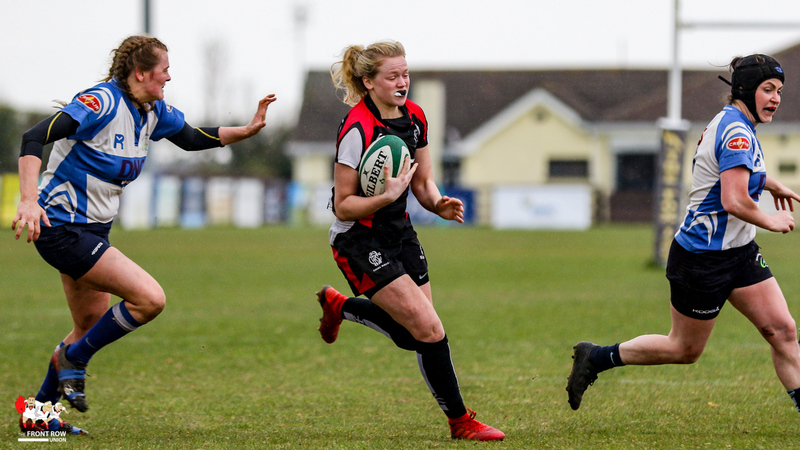 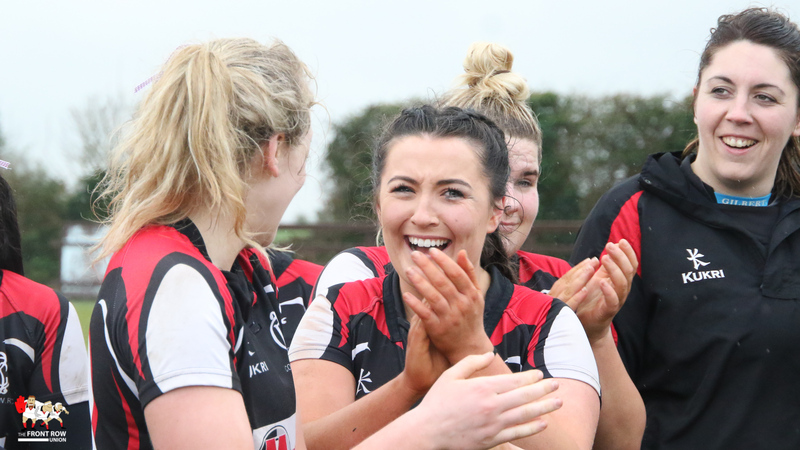 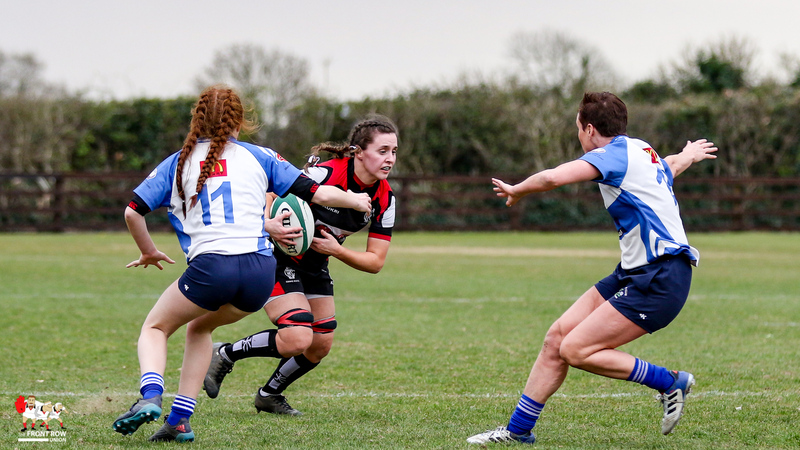 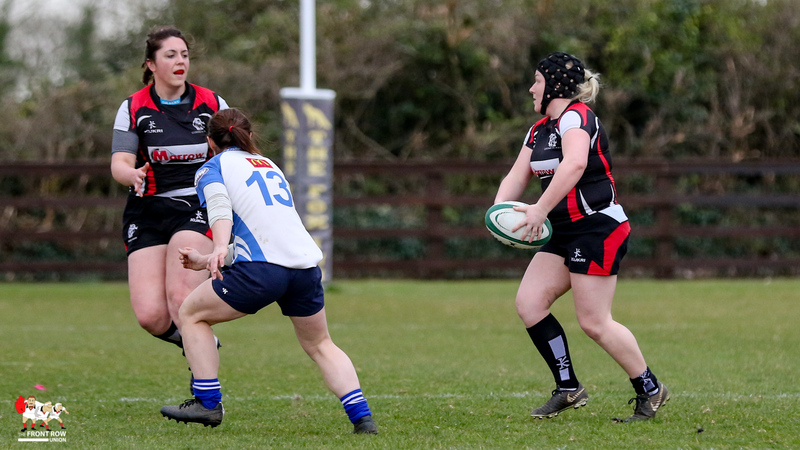 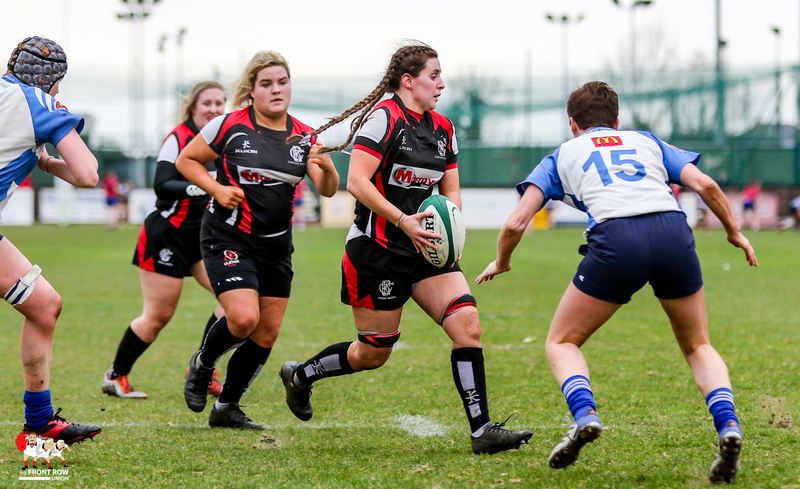 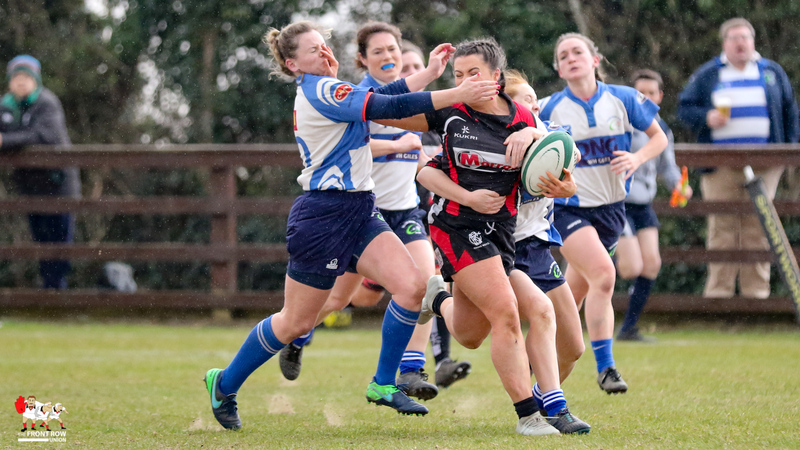 The second final at Ashbourne on saturday afternoon featured AIL side Cooke RFC Women against promotion chasing Tralee RFC Women with the Belfast girls edging an entertaining encounter in the Shield Final. 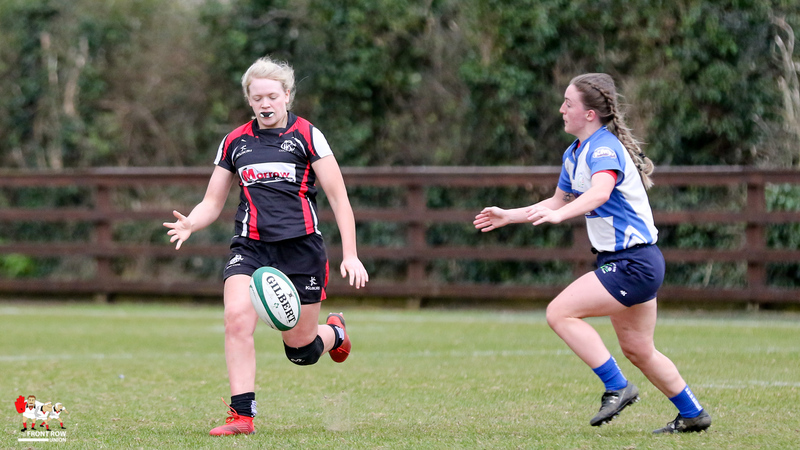 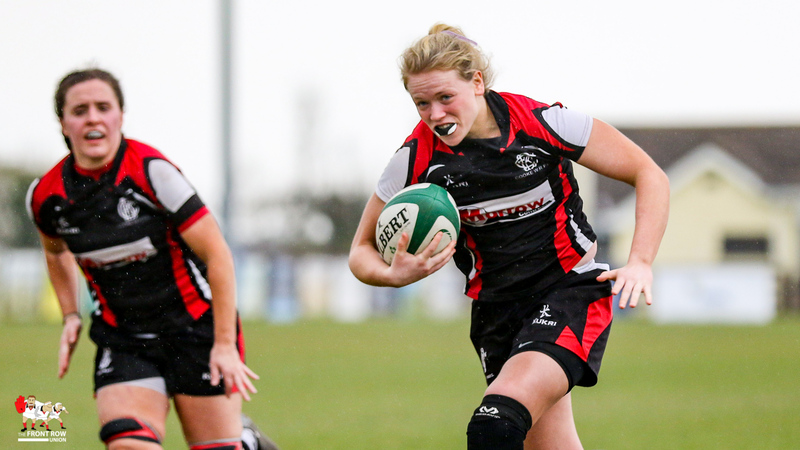 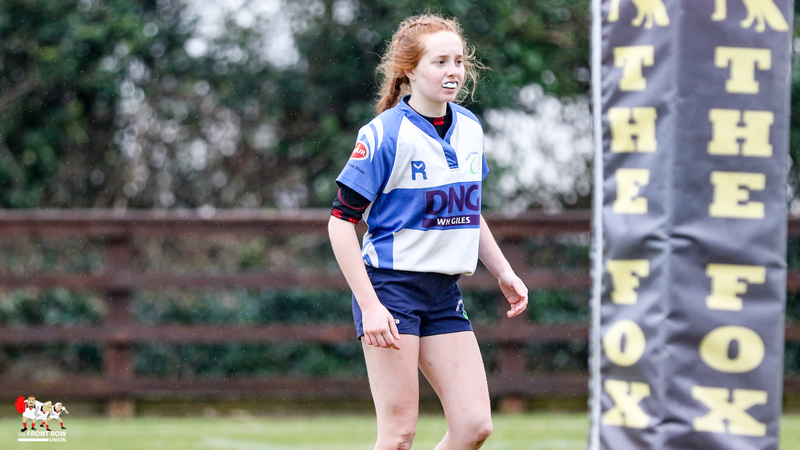 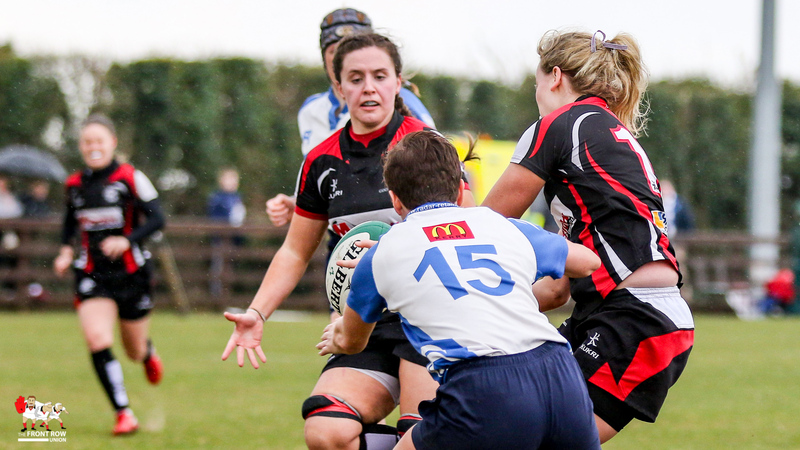 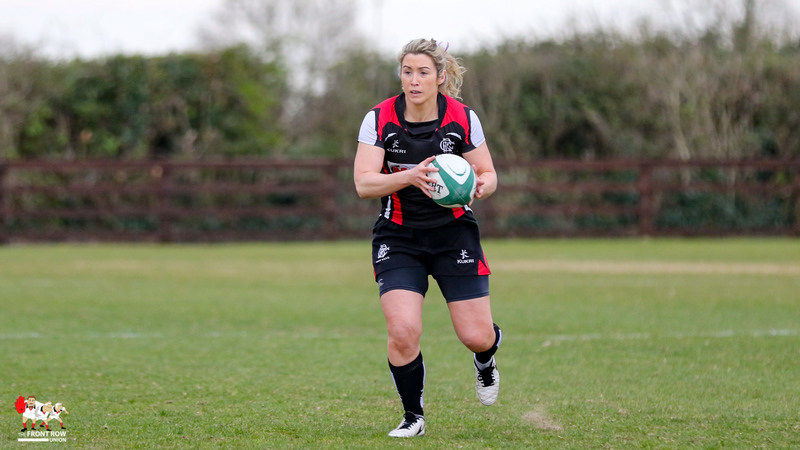 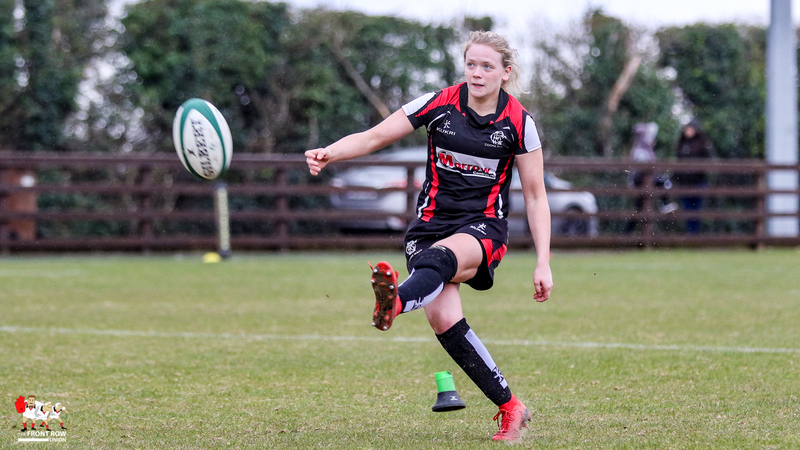 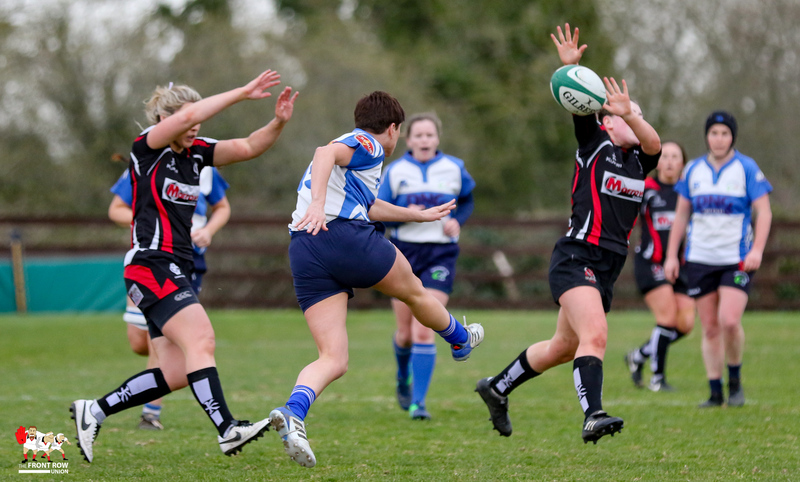 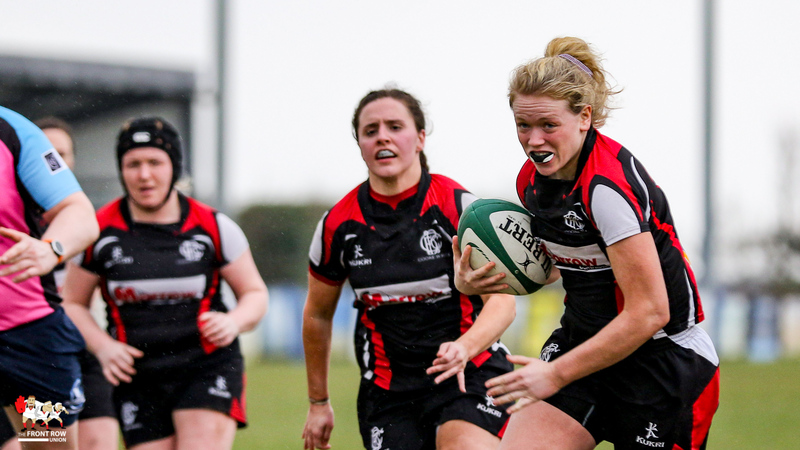 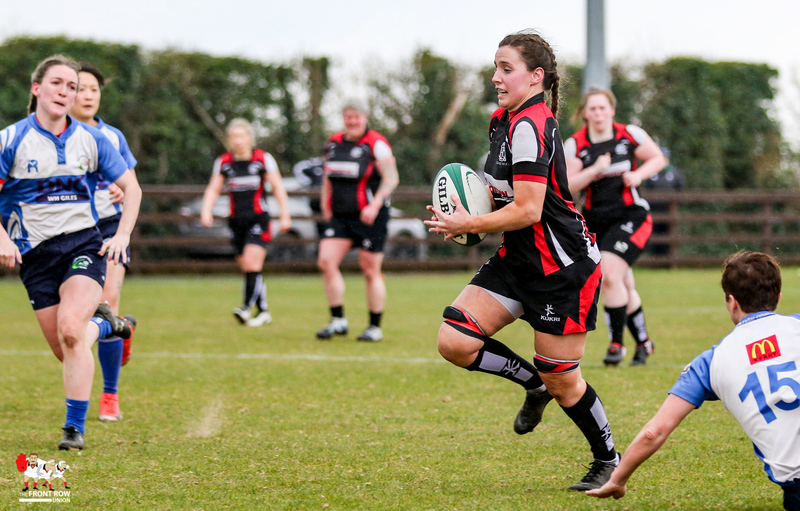 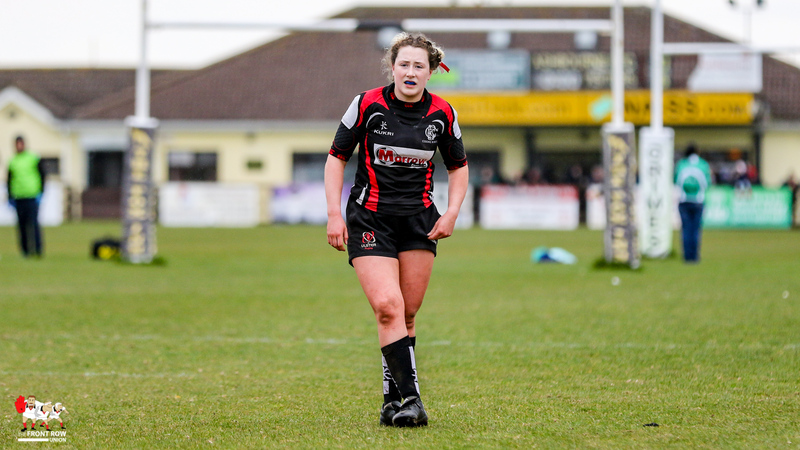 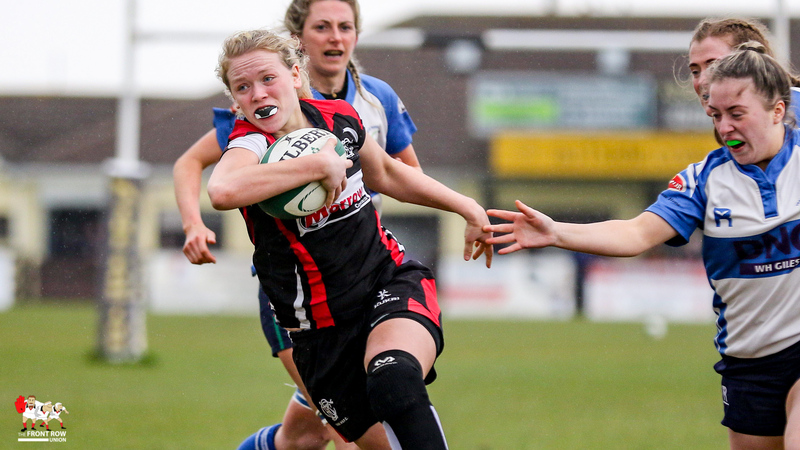 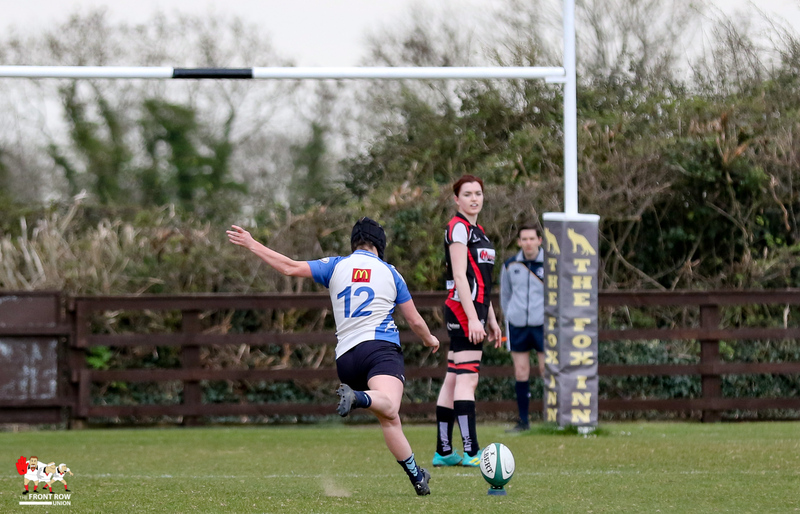 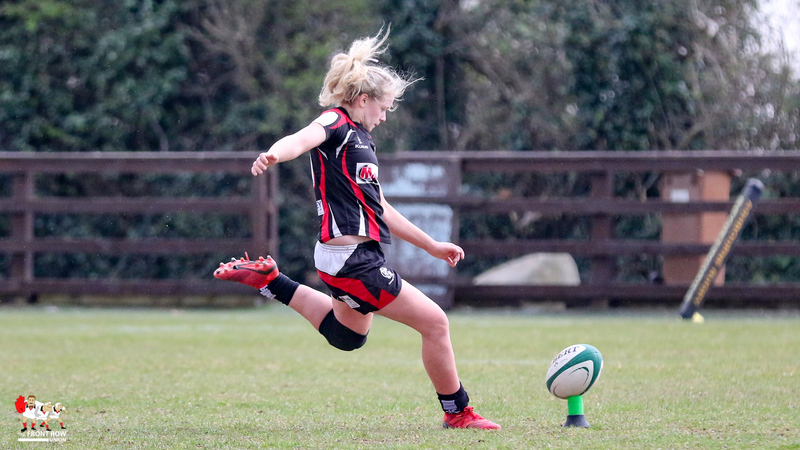 An all action display from Cooke youngster Vicky Irwin pushed the game in favour of AIL side. 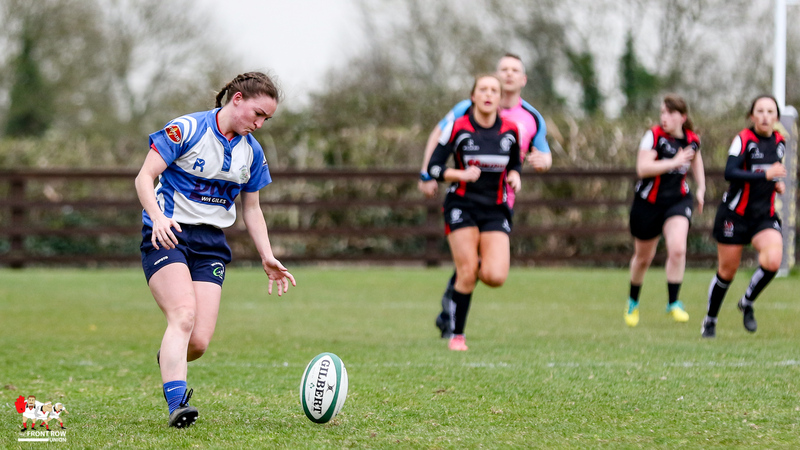 Irwin kicked the decisive five points and set up a try for teammate Beth Cregan as she constantly tested the Tralee defence. 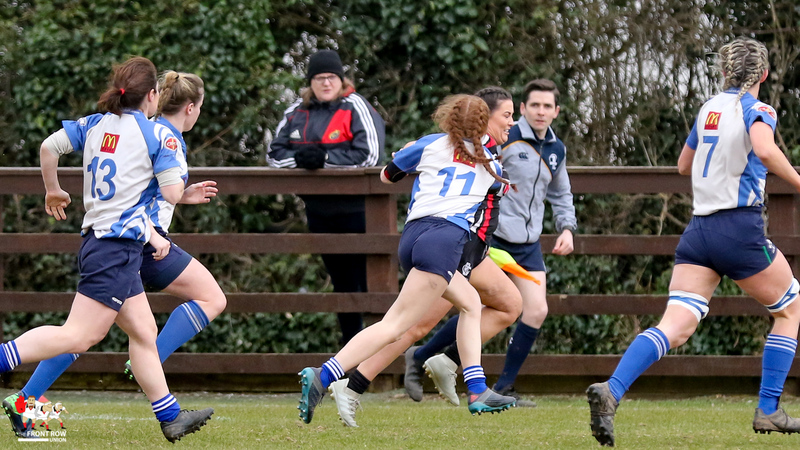 Tralee had already shown us their credentials when they faced Malone Women in the earlier rounds and they didn’t disappoint as they took an early lead through a penalty from Laoise O’Driscoll towards the end of the first quarter. 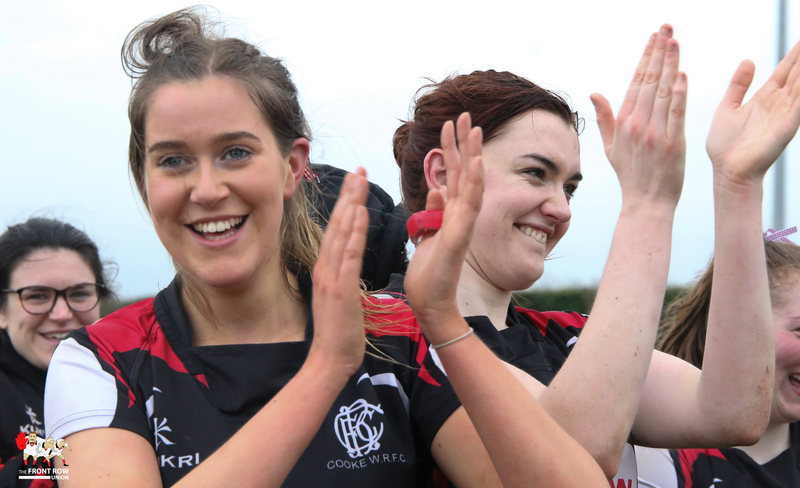 Cooke struck back with a penalty from Irwin at the start of the second quarter and as the game approached half time a decisive break by “snake hips” Eliza Downey gave the Belfast side the lead as she sprinted clear to score out wide, giving Cooke an 8 – 3 lead at the break. 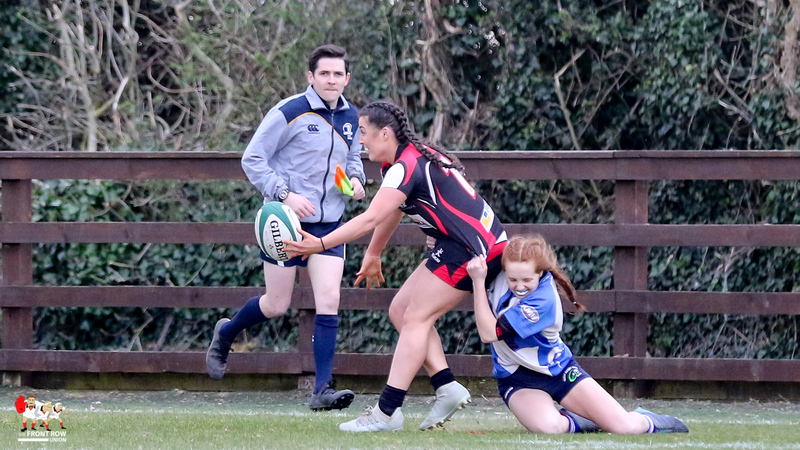 A break by Irwin was finished of by Beth Cregan at the start of the second half and with Irwin adding the extras Cooke took a decisive 15 – 3 lead. 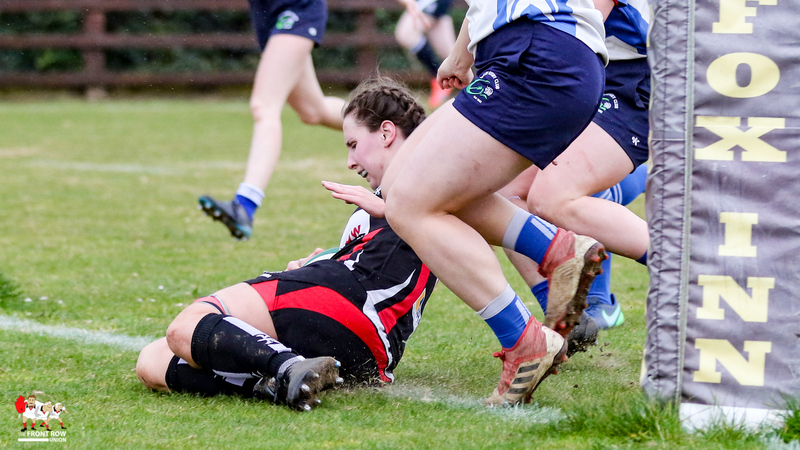 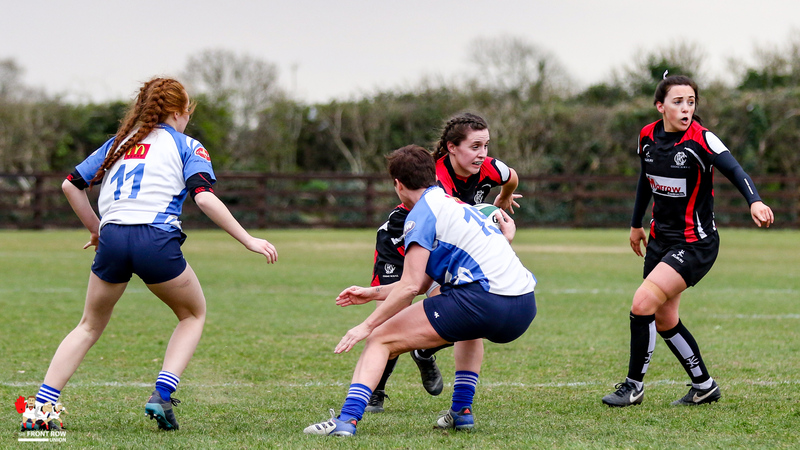 However, Tralee continued to show the grit and determination typical of a Munster side and a late try from Christine Arthurs, converted by O’Driscoll, gave them a glimmer of a chance as the game approached full time. 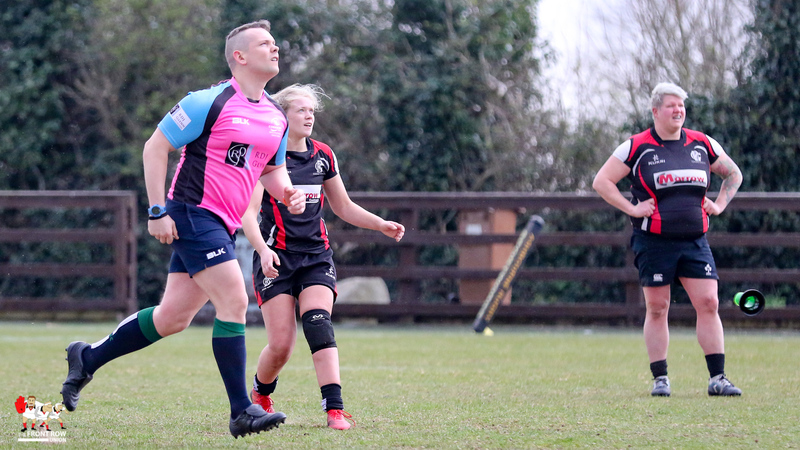 However, Irwin’s kicking game, with one notable exception, kept Cooke in the right area of the pitch and they were able to close out the game to claim thier first silverware of the season. 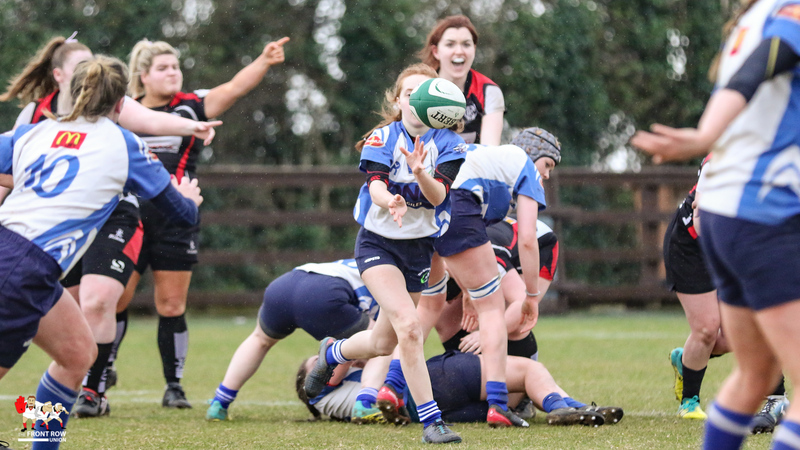 COOKE: Claire Johnston, Eliza Downey, Kelly McCormill, Amanda Morton, Maeve Liston, Victoria Irwin, Hannah Kilgore, Ilse Van Staden, Emma Kearney, Aishling O’Connell, Naomi McCullagh, Shannon Heapes, Marie-Louise Barter, Lesley Megarity, Beth Cregan. 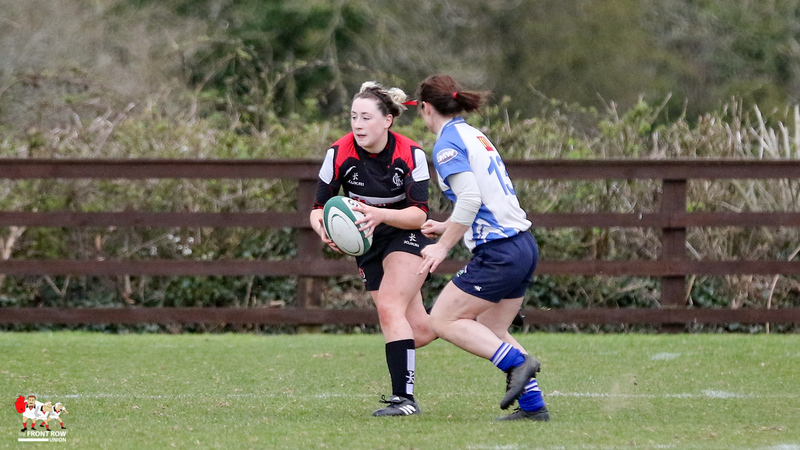 Replacements: Sophie Allen, Hannah Beattie, Caoimhe Rooney, Laura Cairns, Kate Keaney. 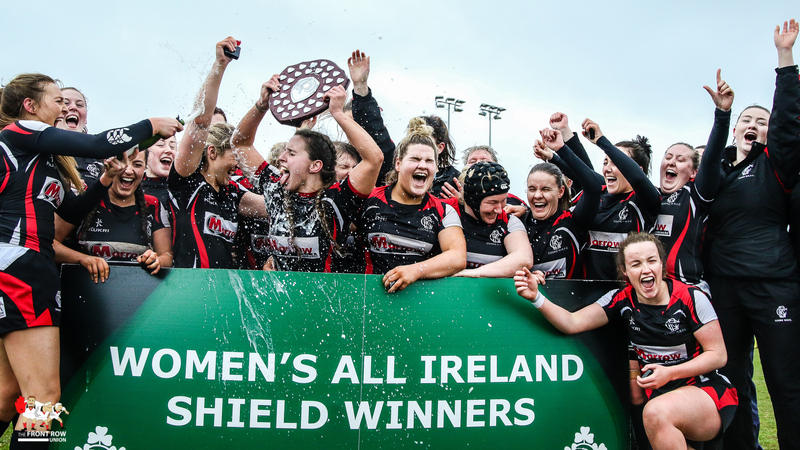 TRALEE: Riona Kennedy, Sinead O’Connor, Noreen Murphy, Laoise O’Driscoll, Muirne Wall, Anna Murphy, Ashlyn Fong, Maura Collins, Katie Harnett, Irene Dillane, Nuala O’Connor, Ellie Daly, Ashlea Sheehy, Siobhan Fleming, Caolann Healy. 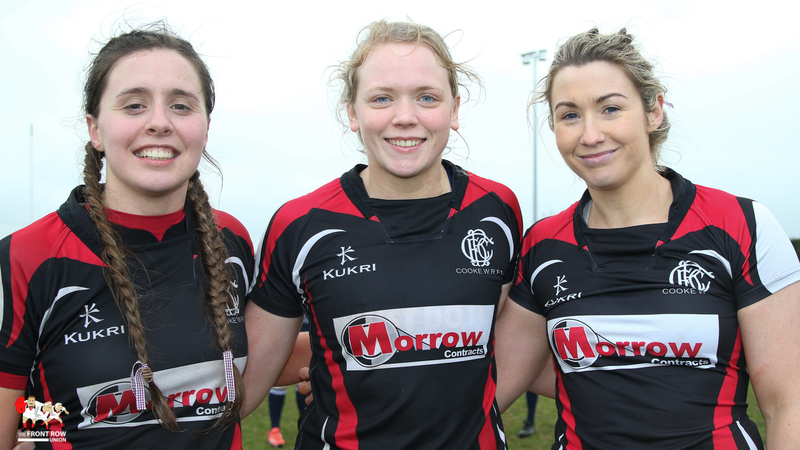 Replacements: Michaela Murphy, Maria Harnett, Christine Arthurs, Donna McGovern, Emma Bourke.